ಟೀಪು ಸಾಹಿಬ್ ಎಂದೂ ಕರೆಯಲ್ಪಡುತ್ತಿದ್ದ ಟೀಪು ಸುಲ್ತಾನ್ (೧೭೫೩ – ಮೇ ೪, ೧೭೯೯), ೧೭೮೨ ರಿಂದ ಮೈಸೂರು ಸಂಸ್ಥಾನದ ರಾಜ, ಹಾಗೂ ಭಾರತದಲ್ಲಿ ಬ್ರಿಟೀಷ್ ಸಾಮ್ರಾಜ್ಯಶಾಹಿಯ ವಿರುದ್ಧ ಆಗಿನ ಕಾಲದ ಪ್ರಮುಖ ಹೋರಾಟಗಾರರಲ್ಲಿ ಒಬ್ಬ. ಈ ಹೋರಾಟದ ಪರಿಣಾಮವಾಗಿ ಟೀಪುವಿಗೆ ಶೇರ್-ಎ-ಮೈಸೂರ್ (ಮೈಸೂರ ಹುಲಿ) ಎಂಬ ಬಿರುದು ಉಂಟು. ಟೀಪು ಸೇನಾ ತಂತ್ರಗಳನ್ನು ತನ್ನ ತಂದೆ, ಹೈದರಾಲಿಯೊಂದಿಗೆ ಇದ್ದ ಫ್ರೆಂಚ್ ಅಧಿಕಾರಿಗಳಿಂದ ಪಡೆದನು. ೧೭೬೭ ರ ಕರ್ನಾಟಕ ಯುದ್ಧದಲ್ಲಿ ಒಂದು ಅಶ್ವದಳದ ಅಧಿಕಾರಿಯಾಗಿ ಕೆಲಸ ನಿರ್ವಹಿಸಿದ್ದನು. ಸೇನಾನಾಯಕನಾಗಿ ಟೀಪು ಪ್ರಸಿದ್ದಿ ಪಡೆದದ್ದು ೧೭೭೫-೭೯ ರ ಆಂಗ್ಲೋ-ಮರಾಠಾ ಯುದ್ಧದಲ್ಲಿ. ೧೫ ನೆ ವಯಸ್ಸಿನಲ್ಲಿ ತನ ತಂದೆ ಹೈದರಾಲಿಯ ಜೊತೆ ಪ್ರಥಮ ಮೈಸೂರು ಯುದ್ಧದಲ್ಲಿ ಭಾಗವಹಿಸಿ, ಒಂದು ದೊಡ್ಡ ಸೇನಾ ತುಕಡಿಯ ನಾಯಕನಾಗಿ ೧೭೮೨ ರ ಫೆಬ್ರವರಿಯಲ್ಲಿ ಆಂಗ್ಲ ಸೇನಾನಾಯಕ ಬ್ರಾತ್‍ವೈಟ್‍ನನ್ನು ಸೋಲಿಸಿದನು. ಐದು ವರ್ಷಗಳ ನಂತರ ಎರಡನೇ ಮೈಸೂರು ಯುದ್ಧ ಆರಂಭವಾಯಿತು. ಈ ಯುದ್ಧದಲ್ಲಿ ಬ್ರಿಟಿಷರು ಸೋತರೂ ಅವರಿಂದ ಭಾರತದ ಸ್ವಾತಂತ್ರ್ಯಕ್ಕಿರುವ ಅಪಾಯವನ್ನು ಟೀಪು ಮನಗಂಡನು. ೧೭೮೨ ರಲ್ಲಿ ಹೈದರಾಲಿಯ ನಿಧನದ ನಂತರ ಟೀಪು ಸುಲ್ತಾನನಾದ ಮೇಲೆ ಬ್ರಿಟಿಷರ ಮುನ್ನಡೆಯನ್ನು ತಡೆಯಲು ಅನೇಕ ಮೈತ್ರಿತ್ವಗಳನ್ನು ಸ್ಥಾಪಿಸಲು ಹೆಣಗಿದ. ಮೊದಲು ಮರಾಠರೊಂದಿಗೆ ಹಾಗೂ ಮೊಘಲ್ ಸಾಮ್ರಾಜ್ಯದೊಂದಿಗೆ ಮೈತ್ರಿತ್ವವನ್ನು ಏರ್ಪಡಿಸಿದ. ಇದರ ಪರಿಣಾಮ ಮೂರನೇ ಮೈಸೂರು ಯುದ್ಧ – ಇದರಲ್ಲಿ ಮೈಸೂರು ಸಂಸ್ಥಾನ ಬಲವಾಗಿ ಸೋತಿತು; ಇದೇ ಸಮಯದಲ್ಲಿ ಫ್ರಾನ್ಸ್ ದೇಶದಲ್ಲಿ ಕ್ರಾಂತಿ ಆರಂಭವಾಗಿ ಫ್ರಾನ್ಸ್ ದೇಶವು ಟೀಪುವಿನ ನೆರವಿಗೆ ಬರಲಾಗಲಿಲ್ಲ. ಟೀಪುವಿನ ಮರಣ ನಾಲ್ಕನೇ ಮೈಸೂರು ಯುದ್ಧದ ಸಮಯದಲ್ಲಿ ನಡೆಯಿತು. ೧೭೯೮ ರಲ್ಲಿ ನೆಪೋಲಿಯನ್ ಈಜಿಪ್ಟ್ ವರೆಗೆ ಬಂದಿಳಿದದ್ದು ಮುಂದಕ್ಕೆ ಭಾರತದಲ್ಲಿ ಬ್ರಿಟಿಷರ ಮೇಲೆ ಆಕ್ರಮಣ ನಡೆಸಲು, ಮತ್ತು ಇದರ ಮುಂದಿನ ಹೆಜ್ಜೆ ಮೈಸೂರು ಸಂಸ್ಥಾನವಾಗಿದ್ದಿತು. ನೈಲ್ ಯುದ್ಧದಲ್ಲಿ ಆಂಗ್ಲ ಅಧಿಕಾರಿ ಹೊರೇಷಿಯೋ ನೆಲ್ಸನ್ ನೆಪೋಲಿಯನ್‌ನ ಕನಸನ್ನು ತಡೆದರೂ ಸಹ, ಮೂರು ಸೇನಾ ತುಕಡಿಗಳು – ಮುಂಬಯಿಯಿಂದ ಒಂದು ಮತ್ತು ಇನ್ನೆರಡು ಆಂಗ್ಲ ತುಕಡಿಗಳು (ಆರ್ಥರ್ ವೆಲ್ಲೆಸ್ಲಿ ಮತ್ತು ಡ್ಯೂಕ್ ಆಫ್ ವೆಲ್ಲಿಂಗ್ಟನ್ ನ ನೇತೃತ್ವದಲ್ಲಿ) ಮೈಸೂರಿನತ್ತ ಹೆಜ್ಜೆ ಇಟ್ಟವು. ರಾಜಧಾನಿಯಾದ ಶ್ರೀರಂಗಪಟ್ಟಣ ಕ್ಕೆ ೧೭೯೯ ರಲ್ಲಿ ಈ ತುಕಡಿಗಳು ಮುತ್ತಿಗೆ ಇಟ್ಟವು. ಮೇ ೪ ರಂದು ಈ ಸೇನೆಗಳು ಕೋಟೆ ಗೋಡೆಗಳನ್ನು ಭೇದಿಸಿ ಒಳಗೆ ನುಗ್ಗುತ್ತಿದ್ದಾಗ ಮುನ್ನುಗ್ಗಿದ ಟೀಪು ಮೃತನಾದ. ಟೀಪು ಸೃಷ್ಟಿಸಿದ ಒಂದು ಮುಖ್ಯ ಸೇನಾ ಪ್ರಗತಿಯೆಂದರೆ ರಾಕೆಟ್‍ಗಳ ಮೂಲಕ ದೊಡ್ಡ ಮಟ್ಟದ ಆಕ್ರಮಣವನ್ನು ನಡೆಸುವುದು. ಮೂರನೇ ಹಾಗೂ ನಾಲ್ಕನೇ ಮೈಸೂರು ಯುದ್ಧಗಳಲ್ಲಿ ಇವುಗಳ ಬಳಕೆಯ ಪರಿಣಾಮವಾಗಿ ಆಂಗ್ಲರು ಸಹ ಇವನ್ನು ಬಳಕೆಗೆ ತಂದರು. ಟೀಪು ತನ್ನನ್ನು ನಾಗರಿಕ ಟೀಪು ಸುಲ್ತಾನ್ ಎಂದು ಕರೆದುಕೊಳ್ಳುತ್ತಿದ್ದ. ಆ ಕಾಲದ ಇತರ ಯಾವುದೇ ಸಮಾಜಶಾಹಿ ಅಥವಾ ಸ್ವಾತಂತ್ರ್ಯಪೂರ್ಣ ವಿಚಾರಗಳನ್ನು ಒಪ್ಪದ ರಾಜರ ಅಭಿಪ್ರಾಯಗಳಿಗೆ ಇದು ಸಂಪೂರ್ಣ ವಿರುದ್ಧವಾದದ್ದು. ಸುಭಾಷ್ ಚಂದ್ರ ಬೋಸ್ (সুভাষ চন্দ্র বসু ; ಜನನ: ಜನವರಿ ೨೩, ೧೮೯೭ — ಮರಣ (ಸಂಭಾವಿತ): ಆಗಸ್ಟ್ ೧೮, ೧೯೪೫) ನೇತಾಜಿ ಎಂದೇ ಪ್ರಸಿದ್ಧರಾದ ಭಾರತದ ಸ್ವಾತಂತ್ರ್ಯ ಸಂಗ್ರಾಮದ ಪ್ರಮುಖ ಜನನಾಯಕರಲ್ಲಿ ಒಬ್ಬರು. ಸ್ವಾಮಿ ವಿವೇಕಾನಂದರ ವಿಚಾರಗಳಿಂದ ಪ್ರಭಾವಿತರಾದ ಇವರು ಭಾರತ ಸ್ವಾತಂತ್ರ ಹೋರಾಟದಲ್ಲಿ ಅತ್ಯಂತ ವಿಶಿಷ್ಟ ಪಾತ್ರವಹಿಸಿದವರು. Subhas Chandra Bose (Bengali: সুভাষচন্দ্র বসু, Oriya: ସୁଭାଷ ଚନ୍ଦ୍ର ବୋଷ; born January 23, 1897; presumed to have died August 18, 1945 although this is disputed), popularly known as Netaji (literally “Respected Leader”), was a leader in the Indian independence movement. Bose was elected president of the Indian National Congress for two consecutive terms but had to resign from the post following ideological conflicts with Mahatma Gandhi and after openly attacking Congress foreign and internal policy. 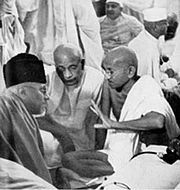 Bose believed that Mahatma Gandhi’s tactics of non-violence would never be sufficient to secure India’s independence, and advocated violent resistance. 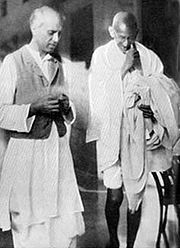 He established a separate political party, the All India Forward Bloc and continued to call for the full and immediate independence of India from British rule. He was imprisoned by the British authorities 11 times. His political views and the alliances he made with Nazi and other militarist regimes at war with Britain have been the cause of arguments among historians and politicians, with some accusing him of fascist sympathies, while others in India have been more sympathetic towards the inculcation of realpolitik as a manifesto that guided his social and political choices. Bose advocated complete freedom for India at the earliest, whereas the Congress Committee wanted it in phases, through a Dominion status. Other younger leaders including Jawaharlal Nehru supported Bose and finally at the historic Lahore Congress convention, the Congress had to adopt Purna Swaraj (complete freedom) as its motto. Bhagat Singh‘s martyrdom and the inability of the Congress leaders to save his life infuriated Bose and he started a movement opposing the Gandhi-Irwin Pact. He was imprisoned and expelled from India. But defying the ban, he came back to India and was imprisoned again. He is presumed to have died on 18 August 1945 in a plane crash over Taiwan. However, contradictory evidence exists regarding his death in the accident. Subhash Chandra Bose was born on January 23 1897 in Cuttack, the ninth child among 14, of Janakinath Bose, an advocate, and Prabhavati Devi. Bose studied in an Anglo school, Cuttack until standard 6 which is now known as Stewart School and then shifted to Ravenshaw Collegiate School of Cuttack. A brilliant student, Bose topped the matriculation examination of Calcutta province in 1911 and passed his B.A. in 1918 in Philosophy from the Scottish Church College of the University of Calcutta. Bose went to study in Fitzwilliam Hall of the University of Cambridge, and his high score on civil service exams meant an almost automatic appointment. He then took his first conscious step as a revolutionary and resigned the appointment on the premise that the “best way to end a government is to withdraw from it.” At the time, Indian nationalists were shocked and outraged because of the Amritsar massacre and the repressive Rowlatt legislation of 1919. Returning to India, Bose wrote for the newspaper Swaraj and took charge of publicity for the Bengal Provincial Congress Committee. His mentor was C.R. Das, spokesman for aggressive nationalism in Bengal. Bose worked for Das when the latter was elected mayor of Calcutta in 1924. In a roundup of nationalists in 1925, Bose was arrested and sent to prison in Mandalay, where he contracted tuberculosis. He was a devout Hindu and spent much time in meditation. Strongly influenced by Swami Vivekananda‘s teachings, he was known for his patriotic zeal as a student. In this famous photograph the Nazi official along with Bose is often mistakenly identified as General Rommel. Released from prison two years later, Bose became general secretary of the Congress party and worked with Jawaharlal Nehru for independence. Again Bose was arrested and jailed for civil disobedience; this time he emerged Mayor of Calcutta. During the mid-1930s Bose traveled in Europe, visiting Indian students and European politicians, as well as Hitler in 1936. He observed party organization and saw communism and fascism in action. By 1938 Bose had become a leader of national stature and agreed to accept nomination as Congress president. He stood for unqualified Swaraj (independence), including the use of force against the British. 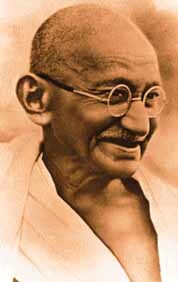 This meant a confrontation with Mohandas Gandhi, who in fact opposed Bose’s presidency, splitting the Congress party. Bose attempted to maintain unity, but Gandhi advised Bose to form his own cabinet. The rift also divided Bose and Nehru. Bose appeared at the 1939 Congress meeting on a stretcher. Though he was elected president again, over Gandhi‘s preferred candidate Pattabhi Sitaramayya, this time differences with Gandhi led to Bose’s resignation. “I am an extremist, ” Bose once said, and his uncompromising stand finally cut him off from the mainstream of Indian nationalism. Bose then organized the Forward Bloc aimed at consolidating the political left, but its main strength was in his home state, Bengal. When war erupted in Europe, Bose was again imprisoned for civil disobedience and put under house arrest to await trial. He escaped and made his way to Berlin by way of Peshawar and Afghanistan. In Europe, Bose sought help from Germany for the liberation of India. He got Nazi permission to organize the Indian Legion of prisoners of war from Africa, but the legion remained basically German in training. Bose felt the need for stronger steps, and he turned to the Japanese embassy in Berlin, which finally made arrangements for Bose to go to Asia. Arriving in Tokyo in May 1943, Bose attracted the attention of the Japanese high command, including Hideki Tojo, Japan’s premier. The Japanese agreed to cooperate in founding an Axis-supported Indian National Army (INA) in Southeast Asia. Bose was flown to Singapore and became commander of the INA and head of the Free India provisional government (Arzi Hukumat-e-Azad Hind). The INA included both Indian prisoners of war from Singapore and Indian civilians in Southeast Asia. The strength of INA grew to 43,000 and fought Allied forces in 1944 inside the borders of India at Imphal and in Burma. For Bose any means and any ally were acceptable in the struggle to liberate India. By the end of World War II none of Bose’s Axis allies had helped, and Bose then turned to the Soviet Union. Three officers of the INA were tried after the war in Delhi; the trial attracted so much popular sympathy (including statements by Nehru and Gandhi that the men were great patriots) that the British decision to withdraw from India followed. Bose indirectly and posthumously achieved his goal of Indian independence. Officially, Bose died in a plane crash over Taiwan, while flying to Tokyo on 18 August 1945. It is believed that he was on route to the Soviet Union in a Japanese plane when it crashed in Taiwan, burning him fatally. However, his body was never recovered, and many theories have been put forward concerning his possible survival. One such claim is that Bose actually died in Siberia, while in Soviet captivity. Several committees have been set up by the Government of India to probe into this matter. In May 1956, a four-man Indian team (known as the Shah Nawaz Committee) visited Japan to probe the circumstances of Bose’s alleged death. The Indian government did not then request assistance from the government of Taiwan in the matter, citing their lack of diplomatic relations with Taiwan. However, the Inquiry Commission under Justice Mukherjee, which investigated the Bose disappearance mystery in the period 1999-2005, did approach the Taiwanese government, and obtained information from the Taiwan Government that no plane carrying Bose had ever crashed in Taipei. The Mukherjee Commission also received a report originating from the U.S. Department of State supporting the claim of the Taiwan Government that no such air crash took place during that time frame.. The revelation makes it clear that disappearance of Bose is a mystery which cannot be simplified by the story of his death. The Justice Mukherjee Commission of Inquiry submitted its report to the Indian Government on November 8, 2005. The report was tabled in Parliament on May 17, 2006. The probe said in its report that as Bose did not die in the plane crash, and that the ashes at the Renkoji Temple (said to be of Bose’s) are not his. However, the Indian Government rejected the findings of the Commission, though no reasons were cited. Bose was posthumously awarded the Bharat Ratna, India’s highest civilian award in 1992, but it was later withdrawn in response to a Supreme Court directive following a Public Interest Litigation filed in the Court against the “posthumous” nature of the award. The Award Committee could not give conclusive evidence on Bose’s death and thus the “posthumous” award was invalidated. No headway was made on this issue however. Bose’s portrait hangs in the Indian Parliament, and a statue of him has been erected in front of the West Bengal Legislative Assembly. Several people believed that the Hindu sanyasi named Bhagwanji, who lived in Faizabad, near Ayodhya and died in 1985, was Subhas Chandra Bose in exile. There had been at least four known occasions when Bhagwanji said he was Netaji Subhas Chandra Bose. The belongings of the sanyasi were taken into custody after his death, following a court order. These were later subjected to inspection by the Justice Mukherjee Commission of Inquiry. The commission refuted this belief, in the absence of any “clinching evidence”. The independent probe done by the Hindustan Times into the case provided hints that the monk was Bose himself. The life and works of Bhagwanji remain a mystery even today. Subhas Chandra Bose, believed that the Vedanta and the Bhagavad Gita were the sources of inspiration for the struggle against the British . Swami Vivekananda’s teachings on universalism, his nationalist thoughts and his emphasis on social service and reform had all inspired Subhas Chandra Bose from his very young days. The fresh interpretation of the India’s ancient scriptures had appealed immensely to him. Many scholars believe that Hindu spirituality formed the essential part of his political and social thought through his adult life, although there was no sense of bigotry or orthodoxy in it.Subhas who called himself a socialist, believed that socialism in India owed its origins to Swami Vivekananda. As historian Leonard Gordan explains “Inner religious explorations continued to be a part of his adult life. This set him apart from the slowly growing number of atheistic socialists and communists who dotted the Indian landscape.” . Bose’s correspondence (prior to 1939) reflects his deep disapproval of the racist practices of, and annulment of democratic institutions in Nazi Germany. However, he expressed admiration for the authoritarian methods (though not the racial ideologies) which he saw in Italy and Germany during the 1930s, and thought they could be used in building an independent India. Bose had clearly expressed his belief that democracy was the best option for India. The pro-Bose thinkers believe that his authoritarian control of the Azad Hind was based on political pragmatism and a post-colonial recovery doctrine rather than any anti-democratic belief. However, during the war (and possibly as early as the 1930s) Bose seems to have decided that no democratic system could be adequate to overcome India’s poverty and social inequalities, and he wrote that an authoritarian state, similar to that of Soviet Russia (which he had also seen and admired) would be needed for the process of national re-building. Accordingly some suggest that Bose’s alliance with the Axis during the war was based on more than just pragmatism, and that Bose was a militant nationalist, though not a Nazi nor a Fascist, for he supported empowerment of women, secularism and other democratic ideas; alternatively, others consider he might have been using populist methods of mobilisation common to many post-colonial leaders. Bose never liked the Nazis but when he failed to contact the Russians for help in Afghanistan he approached the Germans and Italians for help. His comment was that if he had to shake hands with the devil for India’s independence he would do that. The following words are inscribed on a brass shield in front of the chair which is symbolic to the sovereignty of the Republic of India, as also to the Psychological upkeep of the Armed Forces of India. The chair rests in a glass case and is a symbol of pride as well as national heritage. ತಿಲಕರು ಹುಟ್ಟಿದ್ದು 1856ರ ಜುಲೈ 23ರಂದು ಮಹಾರಾಷ್ತ್ರದ ರತ್ನಾಗಿರಿಯ ಮಧ್ಯಮ ವರ್ಗದ ಕುಟುಂಬವೊಂದರಲ್ಲಿ.ಚತುರ ವಿದ್ಯಾರ್ಥಿಯಾಗಿದ್ದ ತಿಲಕನಿಗೆ ಗಣಿತದಲ್ಲಿ ವಿಶೇಷ ಪ್ರತಿಭೆಯಿತ್ತು. ಆಧುನಿಕ, ಕಾಲೇಜು ಶಿಕ್ಷಣ ಪಡೆದುಕೊಂಡ ನವ ಪೀಳಿಗೆಯ ಯುವಕರಲ್ಲಿ ತಿಲಕರೂ ಒಬ್ಬರಾಗಿದ್ದರು. ಪದವಿ ಪಡೆದ ಬಳಿಕ ಪುಣೆಯ ಖಾಸಗೀ ಶಾಲೆಯೊಂದರಲ್ಲಿ ಗಣಿತ ಶಿಕ್ಷಕರಾಗಿ ಸೇರಿದ ತಿಲಕರು , ನಂತರ ಅದನ್ನು ಬಿಟ್ಟು ಪತ್ರಕರ್ತರಾದರು. ಪಾಶ್ಚಿಮಾತ್ಯ ಶಿಕ್ಷಣ ಪಧ್ಧತಿಯು ಭಾರತೀಯ ಪರಂಪರೆಯನ್ನು ಅವಹೇಳಿಸುವಂಥಾದ್ದೂ ಹಾಗೂ ಭಾರತದ ವಿದ್ಯಾರ್ಥಿಗಳನ್ನು ಕೀಳುಗಳೆಯುವಂಥಾದ್ದು ಎಂಬ ನಿರ್ಧಾರಕ್ಕೆ ಬಂದ ಅವರು, ಈ ಪಧ್ಧತಿಯ ತೀವ್ರ ಟೀಕಾಕಾರರಾದರು. ವಿದ್ಯಾರ್ಥಿಗಳಿಗೆ ಓಳ್ಳೆಯ ಗಉಣಮಟ್ಟದ ಶಿಕ್ಷಣ ದೊರೆಯಬೇಕು ಎಂಬ ಉದ್ದೇಶದಿಂದ ಪುಣೆಯಲ್ಲಿ ಡೆಕ್ಕನ್ ಎಜುಕೇಶನ್ ಸೊಸೈಟಿಯನ್ನು ಸ್ಥಾಪಿಸಿದರು. ತಿಲಕರು ಸ್ಥಾಪಿಸಿದ “ಕೇಸರಿ” ಮರಾಠಿ ಪತ್ರಿಕೆಯು ಬಹುಬೇಗ ಜನಸಾಮಾನ್ಯರ ಮನೆಮಾತಾಯಿತು. ಅಭಿಪ್ರಾಯ ಸ್ವಾತಂತ್ರ್ಯವನ್ನು, ಅದರಲ್ಲೂ ಮುಖ್ಯವಾಗಿ, 1905ರ ಬಂಗಾಳದ ವಿಭಜನೆಯ ವಿರೋಧವನ್ನು , ಹತ್ತಿಕ್ಕಿದ; ಭಾರತದ ನಾಗರೀಕರನ್ನು, ಸಂಸೃತಿಯನ್ನು, ಪರಂಪರೆಯನ್ನು ಹೀಯಾಳಿಸುವ ಬ್ರಿಟಿಷ್ ಸತ್ತೆಯ ತೀವ್ರ ಟೀಕೆಯನ್ನು ಅವರು ಕೇಸರಿಯಲ್ಲಿ ಮಾಡುತ್ತಿದ್ದರು. ಭಾರತೀಯರಿಗೆ ಸ್ವರಾಜ್ಯದ ಹಕ್ಕನ್ನು ಬಿಟ್ಟುಕೊಡಬೇಕೆಂದು ಅವರು ಪ್ರತಿಪಾದಿಸಿದರು. 1890ರ ದಶಕದಲ್ಲಿ ತಿಲಕರು ಕಾಂಗ್ರೆಸ್ ಸೇರಿದರಾದರೂ , ಬಹುಬೇಗ ಸ್ವಾತಂತ್ರ್ಯ ಹೋರಾಟದಲ್ಲಿ ಅದರ ಉದಾರೀ-ಸೌಮ್ಯವಾದೀ ಧೋರಣೆಯ ವಿರೋಧಕರಾದರು. ಗೋಪಾಲ ಕೃಷ್ಣ ಗೋಖಲೆಯವರ ಸೌಮ್ಯವಾದೀ ನೀತಿಯ ಕಟು ಟೀಕಾಕಾರರಾದರು. ಇದರಲ್ಲಿ ತಿಲಕರಿಗೆ ಬಂಗಾಳದ ಬಿಪಿನ ಚಂದ್ರ ಪಾಲ್ ಹಾಗೂ ಪಂಜಾಬಿನ ಲಾಲಾ ಲಜಪತ ರಾಯ್ ರ ಬೆಂಬಲವಿತ್ತು.1907ರಲ್ಲಿ ಸೂರತ್ ಅಧಿವೇಶನದಲ್ಲಿ ಕಾಂಗ್ರೆಸ್ ತಿಲಕ,ಪಾಲ್ ಹಾಗೂ ರಾಯ್ ನೇತ್ಳತ್ವದಲ್ಲಿ “ಗರಂ ದಳ” (“ಬಿಸಿ ಗುಂಪು”) ಹಾಗೂ ಗೋಖಲೆಯವರ ನೇತ್ಳತ್ವದಲ್ಲಿ “ನರಂ ದಳ” (“ಮೆದು ಗುಂಪು”) ಎಂದು ಇಭ್ಭಾಗವಾಯಿತು. ರಾಜದ್ರೋಹದ ಆರೋಪದ ಮೇಲೆ 1906ರಲ್ಲಿ ಬಂಧನಕ್ಕೋಳಗಾದ ತಿಲಕರು ತಮ್ಮ ಪರವಾಗಿ ವಕಾಲತ್ತು ವಹಿಸುವಂತೆ ಕೇಳಿಕೋಂಡದ್ದು ಯುವ ವಕೀಲ ಮಹಮದ್ ಆಲಿ ಜಿನ್ನಾರನ್ನು. ಆದರೂ, ಬ್ರಿಟಿಷ್ ನ್ಯಾಯಾಧೀಶರಿಂದ ಅಪರಾಧಿ ಎಂದು ಘೋಷಿಸಲ್ಪಟ್ಟು, 1908 ರಿಂದ 1914ರವರೆಗೆ ಬರ್ಮಾ ದೇಶದ ಮಂಡಾಲೆಯಲ್ಲಿ ಸೆರೆವಾಸ ಅನುಭವಿಸಿದರು. ಬಿಡುಗಡೆಯಾದ ನಂತರ ತಮ್ಮ ಸಹ- ರಾಷ್ಟ್ರೀಯವಾದಿಗಳನ್ನು ಕೂಡಿಕೋಂಡ ತಿಲಕರು , 1916ರಲ್ಲಿ ಕಾಂಗ್ರೆಸ್ಸನ್ನು ಕೂಡಾ ಪುನಹ ಓಟ್ಟುಗೂಡಿಸಿದರು. ಅಖಿಲ ಭಾರತ ಹೋಂ ರೂಲ್ ಲೀಗನ್ನು ಸ್ಥಾಪಿಸುವಲ್ಲಿ ಆನಿ ಬೆಸೆಂಟ್ ಮತ್ತು ಮಹಮದ್ ಆಲಿ ಜಿನ್ನಾರಿಗೆ ಸಹಕಾರ ನೀಡಿದರು. ತಿಲಕರು ಮೂಲತಃ ಅದ್ವೈತ ವೇದಾಂತದ ಪ್ರತಿಪಾದಕರಾಗಿದ್ದರೂ, ಸಾಂಪ್ರದಾಯಿಕ ಅದ್ವೈತದ “ಜ್ಙಾನವೊಂದರಿಂದಲೇ ಮುಕ್ತಿ” ಎಂಬ ನಂಬುಗೆಯು ಅವರಿಗೆ ಒಪ್ಪಿಗೆಯಿರಲಿಲ್ಲ. ಅದಕ್ಕೆ ಸರಿಸಮನಾಗಿ ಹಾಗೂ ಪೂರಕವಾಗಿ ಅವರು ಕರ್ಮಯೋಗವನ್ನೂ ಸೇರಿಸಿದರು. ವಿವಾಹಕ್ಕೆ ಕನಿಷ್ಠ ವಯೋಮಿತಿಯೇ ಮೊದಲಾಗಿ ತಿಲಕರು ಅನೇಕ ಸಾಮಾಜಿಕ ಸುಧಾರಣೆಗಳನ್ನು ಮುಂದಿಟ್ಟರು. ಮದ್ಯಪಾನ ನಿಷೇಧದ ಪರವಾಗಿ ಅವರಿಗೆ ಅತ್ಯಂತ ಕಳಕಳಿಯಿತ್ತು. ಶಿಕ್ಷಣ ಹಾಗೂ ರಾಜಕೀಯ ಜೀವನದ ಬಗ್ಯೆ ಅವರ ವಿಚಾರಗಳು ಬಹಳ ಪ್ರಭಾವಶಾಲಿಯಾಗಿದ್ದವು – ದೇವನಾಗರಿ ಲಿಪಿಯಲ್ಲಿ ಬರೆಯಲಾಗುವ ಹಿಂದಿ ಭಾಷೆಯು ಭಾರತದ ರಾಷ್ತ್ರಭಾಷೆಯಾಗಬೇಕು ಎಂದು ಮೊದಲು ಸೂಚಿಸಿದವರು ತಿಲಕರು. ಗಾಂಧೀಜಿ ಇದನ್ನು ಮುಂದೆ ಬಲವಾಗಿ ಅನುಮೋದಿಸಿದರು. ಆದರೆ, ತಿಲಕರು ಸಂಪೂರ್ಣವಾಗಿ ಭಾರತದಿಂದ ನಿರ್ಮೂಲನ ಮಾಡಬೇಕೆಂದು ಇಚ್ಛೆ ಪಟ್ಟಿದ್ದ ಇಂಗ್ಲೀಷು ಭಾಷೆ , ಇಂದಿಗೂ ಸಂವಹನದ ಒಂದು ಮುಖ್ಯ ಸಾಧನವಾಗಿ ಉಳಿದುಕೊಂಡು ಬಂದಿದೆ.ಆದರೂ ಹಿಂದಿ (ಮತ್ತು ಇತರ ಭಾರತೀಯ ಭಾಷೆಗಳ) ಜನಸಾಮಾನ್ಯರ ಮಟ್ಟದಲ್ಲಿ ಬಳಕೆ ಮತ್ತು ಬ್ರಿಟಿಷರ ಕಾಲದಿಂದ ಇಂದಿನವರೆಗೂ ನೀಡಲಾಗುತ್ತಿರುವ ಪ್ರೋತ್ಸಾಹಕ್ಕೆ ತಿಲಕರು ಅಂದು ಪ್ರಾರಂಭಿಸಿದ ಪುನರುಜ್ಜೀವನವೇ ಕಾರಣ ಎನ್ನಲಾಗುತ್ತದೆ. ತಿಲಕರ ಮತ್ತೊಂದು ದೊಡ್ಡ ಕಾಣಿಕೆಯೆಂದರೆ, ಸಾರ್ವಜನಿಕ ಗಣೇಶೋತ್ಸವ. ಭಾದ್ರಪದ ಶುಕ್ಲ ಚತುರ್ಥಿಯಿಂದ ಹಿಡಿದು ಅನಂತ ಚತುರ್ದಶಿಯವರೆಗಿನ 11 ದಿನಗಳ ಈ ಉತ್ಸವ, ಖಾಸಗೀ ಧಾರ್ಮಿಕ ಆಚರಣೆಯನ್ನು ಜನಸಾಮಾನ್ಯರು ಒಟ್ಟುಗೂಡಿ ಆಚರಿಸುವ, ನಾಯಕರುಗಳಿಗೆ ಜನಸಾಮಾನ್ಯರೊಂದಿಗೆ ಸಂಪರ್ಕ ಸಾಧಿಸುವ ಮಾಧ್ಯಮವಾಗಿ ಬದಲಾಯಿಸಿತು. ತಿಲಕರು ಪ್ರಾರಂಭಿಸಿದ ಈ ಪರಂಪರೆ ದೇಶದ ಅನೇಕ ಕಡೆಗಳಲ್ಲಿ, ಅದರಲ್ಲೂ ಮುಖ್ಯವಾಗಿ ಮಹಾರಾಷ್ತ್ರದಲ್ಲಿ ಇಂದಿಗೂ ಮುಂದುವರಿಯುತ್ತಿದೆ.ಪರದೇಶೀ ವಸ್ತುಗಳನ್ನು ಬಹಿಷ್ಕರಿಸುವಂತೆ ಅವರು ನೀಡಿದ ಕರೆ ಬಹಳಷ್ಟು ಭಾರತೀಯರಲ್ಲಿ ದೇಶಭಕ್ತಿಯನ್ನು ಉಕ್ಕಿಸಿತು. ತಿಲಕರು ಮಹಾತ್ಮಾ ಗಾಂಧಿಯವರ ಅಹಿಂಸಾತ್ಮಕ , ಅಸಹಕಾರ ಚಳುವಳಿಯ ಟೀಕಾಕಾರರಾಗಿದ್ದರು. ಒಂದು ಕಾಲದಲ್ಲಿ ತೀವ್ರವಾದಿ ಕ್ರಾಂತಿಕಾರಿಯೆಂದು ಪರಿಗಣಿಸಲ್ಪಟ್ಟಿದ್ದರೂ, ನಂತರದ ವರ್ಷಗಳಲ್ಲಿ ಅವರು ಗಮನಾರ್ಹವಾಗಿ ಬದಲಾಗಿದ್ದರು. ಭಾರತದ ಸ್ವಾತಂತ್ರ ಗಳಿಸಲು, ಮಾತುಕತೆಗಳ ಮೂಲಕವೇ ಹೆಚ್ಚು ಪರಿಣಾಮಕಾರಿ ಎಂಬ ಬಗ್ಯೆ ಅವರಿಗೆ ಒಲವಿತ್ತು. ಅಷ್ಟೇ ಅಲ್ಲ ಬ್ರಿಟಿಷ್ ಸಾಮ್ರಾಜ್ಯದಿಂದ ಹೊರಬರುವುದಕ್ಕೆ ಅವರ ಬೆಂಬಲವಿರಲಿಲ್ಲ. ಆದರೂ, ಸ್ವರಾಜ್ಯ ಮತ್ತು ರಾಜಕೀಯ ಸ್ವಾತಂತ್ರ್ಯಕ್ಕಾಗಿ ಹೋರಾಟವನ್ನು ಜನಸಾಮಾನ್ಯರವರೆಗೆ ಕೊಂಡೊಯ್ದ ತಿಲಕರನ್ನು ಸ್ವಾತಂತ್ರ್ಯ ಚಳುವಳಿಯ ಜನಕ ಎಂದು ಪರಿಗಣಿಸಲಾಗಿದೆ. ಭಾರತೀಯ ಸಂಸ್ಕೃತಿ, ಇತಿಹಾಸ ಹಾಗೂ ಧರ್ಮದ ಬಗ್ಯೆ ಲೇಖನಗಳಿಂದ ಲಕ್ಷಾಂತರ ಭಾರತೀಯರಿಗೆ ತಮ್ಮ ಭವ್ಯ ಪರಂಪರೆಯ ಹಾಗೂ ನಾಗರೀಕತೆಗಳ ಅರಿವು ಮಾಡಿಕೊಟ್ಟು, ಅವರ ಪ್ರಜ್ಙೆಯಲ್ಲಿ ತಮ್ಮ ನಾಡಿನ ಬಗ್ಯೆ ಅಭಿಮಾನವನ್ನು ಮೂಡಿಸಿದರು . ತಿಲಕರನ್ನು ಭಾರತದ ರಾಜಕೀಯ ಹಾಗೂ ಆಧ್ಯಾತ್ಮಿಕ ನಾಯಕರನ್ನಾಗಿಯೂ, ಮಹಾತ್ಮಾ ಗಾಂಧಿಯವರನ್ನು ಇವರ ಉತ್ತರಾಧಿಕಾರಿಯಾಗಿಯೂ ಅನೇಕರು ಪರಿಗಣಿಸುತ್ತಾರೆ. 1920ರಲ್ಲಿ ತಿಲಕರು ತೀರಿಕೊಂಡಾಗ, ಅವರ ಅಂತ್ಯಕ್ರಿಯೆಯಲ್ಲಿ ಭಾಗವಹಿಸಿದ 200,000 ಜನರಲ್ಲಿ ಒಬ್ಬರಾದ ಮಹಾತ್ಮಾ ಗಾಂಧಿಯವರು ತಿಲಕರನ್ನು “ಆಧುನಿಕ ಭಾರತದ ಜನಕ” ಎಂದು ಬಣ್ಣಿಸಿದರು. 1903ರಲ್ಲಿ ತಿಲಕರು Arctic Home in the Vedas ಎಂಬ ಗ್ರಂಥವನ್ನು ಬರೆದು, ಅದರಲ್ಲಿ , ಖಗೋಳಶಾಸ್ತ್ರದ ಆಧಾರದ ಮೇಲೆ, ವೇದಗಳನ್ನು ಧ್ರುವ ಪ್ರದೇಶಗಳಲ್ಲಿ ಮಾತ್ರವೇ ಸೃಷ್ಟಿಸಿರಲು ಸಾಧ್ಯ ಎಂದು ವಾದಿಸುತ್ತಾರೆ. ಕೊನೆಯ ಮಂಜಿನ ಯುಗ ಶುರುವಾದ ಮೇಲೆ ಅಲ್ಲಿಂದ ದಕ್ಷಿಣದ ಕಡೆ ಸಾಗಿದ ಆರ್ಯರ ಮೂಲಕ ಅದು ದಕ್ಷಿಣ ದೇಶಗಳನ್ನು ಮುಟ್ಟಿತು ಎಂದೂ ಅವರು ಪ್ರತಿಪಾದಿಸುತ್ತಾರೆ. The Orion, ಅಥವಾ ವೇದಗಳ ಪ್ರಾಚೀನತೆಯ ಸಂಶೋಧನೆಗಳು ಎಂಬ ಪುಸ್ತಕದಲ್ಲಿ ವೇದ ಕಾಲೀನ ಜನರು ಕ್ರ.ಪೂ. 4ನೆಯ ಸಹಸ್ರಮಾನದಷ್ಟು ಹಿಂದೆಯೇ ಭಾರತದಲ್ಲಿ ನೆಲೆಸಿದ್ದರು ಎಂದು ಖಗೋಳಶಾಸ್ತ್ರದ ಆಧಾರದ ಮೇಲೆ ಪ್ರತಿಪಾದಿಸುತ್ತಾರೆ. ತಿಲಕರ “ಗೀತಾರಹಸ್ಯ ಅಥವಾ ಜೀವನಧರ್ಮ ಯೋಗ” ಎಂಬ ಭಗವದ್ಗೀತೆಯ ತಾತ್ಪರ್ಯವು ಬಹಳ ಪ್ರಸಿಧ್ಧವಾದ ಕೃತಿ. ತಿಲಕರ ಪತ್ರಗಳು – ಎಂ. ಡಿ. ವಿದ್ವಾಂಸ್ ರವರಿಂದ ಸಂಪಾದಿಸಲ್ಪಟ್ಟಿದೆ. ಸರ್ದಾರ್ ವಲ್ಲಭಭಾಯ್ ಪಟೇಲ್ (ಅಕ್ಟೋಬರ್ ೩೧, ೧೮೭೫ – ಡಿಸೆಂಬರ್ ೧೫, ೧೯೫೦) ಉಕ್ಕಿನ ಮನುಷ್ಯ – ಭಾರತದ ಪ್ರಮುಖ ಗಣ್ಯರಲ್ಲಿ ಒಬ್ಬರು, ರಾಜಕೀಯ ಮುತ್ಸದ್ಧಿ. ಇವರು ಗಾಂಧೀಜಿಯವರ ಕೆಳಗೆ ಭಾರತೀಯ ರಾಷ್ಟೀಯ ಕಾಂಗ್ರೆಸ್‌ನ ಮುಖ್ಯ ನಿರ್ವಾಹಕರು ಇವರೇ ಆಗಿದ್ದರು. ಇವರ ಪ್ರಯತ್ನಗಳಿಂದಲೇ ೧೯೩೭ರ ಮತದಾನದಲ್ಲಿ ಕಾಂಗ್ರೆಸ್ ೧೦೦% ಜಯವನ್ನು ಸಾಧಿಸಿತು. ವಸ್ತುಶಃ ಸರ್ದಾರ್ ಪಟೇಲ್‌ರವರೇ ಕಾಂಗ್ರೆಸ್ ಸದಸ್ಯರಿಂದ ಪ್ರಧಾನಿ ಹುದ್ದೆಗೆ ಬೆಂಬಲಿಸಲ್ಪಟ್ಟಿದ್ದರು, ಆದರೆ ಗಾಂಧೀಜಿಯವರ ಒತ್ತಾಯದ ಮೇಲೆ ಇವರು ಪ್ರಧಾನಿ ಹುದ್ದೆಗೆ ಹಿಂದಕ್ಕೆ ಸರಿದು ಜವಾಹರ್ ಲಾಲ್ ನೆಹರುರವರಿಗೆ ದಾರಿ ಮಾಡಿಕೊಟ್ಟರು. ಗುಜರಾತಿನ ಜನರಿಂದ ಗೌರವಾರ್ಥ ‘ಸರ್ದಾರ್’ ಎಂಬ ಬಿರುದು ಪಡೆದರು. ಭಾರತದಲ್ಲಿದ್ದ ಪುಟ್ಟ ಪುಟ್ಟ ರಾಜರಿಂದಾಳಲ್ಪಟ್ಟ ರಾಜ್ಯಗಳನ್ನು ಒಂದುಗೂಡಿಸುವಲ್ಲಿ ಪ್ರಮುಖ ಪಾತ್ರ ವಹಿಸಿದ ಇವರು ‘ಉಕ್ಕಿನ ಮನುಷ್ಯ’ ರೆಂದೇ ಅಮರರಾದರು. ಸರ್ದಾರ್ ಪಟೇಲರಿಗೆ ೧೯೯೧ ರಲ್ಲಿ ಭಾರತ ರತ್ನ ಪ್ರಶಸ್ತಿಯನ್ನು ನೀಡಿ ಗೌರವಿಸಲಾಯಿತು. Young Vallabhbhai, when a student. ವಲ್ಲಭಭಾಯ್ ಝವೇರಭಾಯ್ ಪಟೇಲ್ ಹುಟ್ಟಿದ್ದು ಗುಜರಾತಿನ ನಡಿಯಾದ್ ಎಂಬಲ್ಲಿ ಅವರ ಸೋದರಮಾವನ ಮನೆಯಲ್ಲಿ. ಖೇಡಾ ಜಿಲ್ಲೆಯ ಕರಮಸಾಡ್ ಎಂಬ ಹಳ್ಳಿಯ ನಿವಾಸಿ ಝವೇರಭಾಯ್ ಮತ್ತು ಲಾಡಬಾ ಇವರ ನಾಲ್ಕನೆಯ ಮಗನಾಗಿ ಜನಿಸಿದ ವಲ್ಲಭಭಾಯಿಯ ಹುಟ್ಟಿದ ದಿನ, ಮುಂದೆ ಅವರು ಮ್ಯಾಟ್ರಿಕ್ ಪರೀಕ್ಷೆಯಲ್ಲಿ ಅಕ್ಟೋಬರ್ 31 ಎಂದು ನಮೂದಿಸಿದರೂ, ನಿಖರವಾಗಿ ದಾಖಲಾಗಿಲ್ಲ.ಸೋಮಾಭಾಯಿ, ನರಸೀಭಾಯಿ, ಮತ್ತು ,ರಾಜಕೀಯದಲ್ಲಿ ಮುಂದೆ ಪ್ರಸಿದ್ಧರಾದ, ವಿಠ್ಠಲಭಾಯಿ ಇವರ ಅಣ್ಣಂದಿರುಗಳು. ಕಾಶೀಭಾಯಿ ಎಂಬ ತಮ್ಮ ಹಾಗೂ ದಹೀಬಾ ಎಂಬ ತಂಗಿ ಇವರ ಇತರ ಒಡಹುಟ್ಟಿದವರು. ಪಟೇಲರು ಶಾಲೆ ಸೇರಿದ್ದು ತಡವಾಗಿ. ಇವರ ಕುಟುಂಬದವರು ಅವರ ವಿದ್ಯಾಭ್ಯಾಸದಲ್ಲಿ ಆಸಕ್ತಿಯನ್ನಾಗಲೀ, ಅದಕ್ಕೆ ಬೆಂಬಲವನ್ನಾಗಲೀ ಕೊಟ್ಟಂತೆ ಕಾಣುವುದಿಲ್ಲ. ನಡಿಯಾದಿನಿಂದ, ಪೇಟ್ಲಾಡ್, ಹಾಗೂ ಮುಂದೆ ಬೋರ್ಸಾಡ್ ಎಂಬಲ್ಲಿ ಅವರ ವಿದ್ಯಾಭ್ಯಾಸ ಮುಂದುವರಿಯಿತು. ಪಟೇಲರು ಮ್ಯಾಟ್ರಿಕ್ ಪರೀಕ್ಷೆ ಕಟ್ಟಿದಾಗ ಅವರಿಗೆ 22 ವರ್ಷ ! ಈ ಘಟ್ಟದಲ್ಲಿ ಅವರ ಸರೀಕರ ಅಭಿಪ್ರಾಯದಲ್ಲಿ ಪಟೇಲರು ಯಾವುದೇ ಮಹತ್ವಾಕಾಂಕ್ಷೆಯಿಲ್ಲದ ಜನಸಾಮಾನ್ಯರಲ್ಲಿ ಒಬ್ಬರಾಗಿದ್ದರು. ಸ್ವತಃ ಪಟೇಲರಿಗೆ ಪ್ಲೀಡರ್ ಪರೀಕ್ಷೆ ಪಾಸು ಮಾಡಿ ವಕೀಲರಾಗಬೇಕೆಂದು ಅಪೇಕ್ಷೆಯಿತ್ತು. ಅದಕ್ಕಾಗಿ ಹಣ ಒಟ್ಟುಮಾಡಿ , ಮುಂದೆ ಬ್ಯಾರಿಸ್ಟರಾಗಲು ಇಂಗ್ಲೆಂಡಿಗೆ ತೆರಳುತ್ತಾರೆ. ಪಟೇಲರು ಹಣಸಂಗ್ರಹಣೆಯಲ್ಲಿ ತೊಡಗಿದ್ದ ಕಾಲದಲ್ಲಿ ಅವರ ಅಣ್ಣ ವಿಠ್ಠಲಭಾಯಿ ವಕೀಲರಾಗಿ ಹೆಸರಾಗುತ್ತಿದ್ದರು. ನಂತರ ಪಟೇಲರು, ಹೇಂಡತಿ ಝವೇರಬಾರೊಂದಿಗೆ, ಅವರಿಗೆ ಚಿಕ್ಕವಯಸ್ಸಿನಲ್ಲಿಯೇ ಮದುವೆಯಾಗಿತ್ತು, ಸಂಸಾರ ಹೂಡಿದರು.ಅವರಿಗೆ ಇಬ್ಬರು ಮಕ್ಕಳಾದರು. 1904ರಲ್ಲಿ ಮಣಿ ಎಂಬ ಮಗಳು ಮತ್ತು 1906ರಲ್ಲಿ ದಹ್ಯಾ ಎಂಬ ಮಗ. ಬ್ಯುಬೋನಿಕ್ ಪ್ಲೇಗಿನಿಂದ ನರಳುತ್ತಿದ್ದ ಗೆಳೆಯನೊಬ್ಬನ ಆರೈಕೆ ಮಾಡುತ್ತ, ಪಟೇಲರು ಸ್ವತಃ ಆ ರೋಗಕ್ಕೆ ತುತ್ತಾದಾಗ, ತಮ್ಮ ಕುಟುಂಬವನ್ನು ಸುರಕ್ಷಿತ ಜಾಗಕ್ಕೆ ಕಳುಹಿಸಿ, ತಮ್ಮ ಮನೆಯನ್ನು ತ್ಯಜಿಸಿ , ನಡಿಯಾದಿನ ಮನೆಯೊಂದರಲ್ಲಿ ( ಪಾಳುಬಿದ್ದ ದೇವಸ್ಥಾನ ಎಂದೂ ಕೆಲವರು ಹೇಳುತ್ತಾರೆ) ಚೇತರಿಕೊಳ್ಳುವವರೆಗೆ ನೆಲೆಸಿದರು. 1909ರಲ್ಲಿ ಅವರ ಪತ್ನಿ ತೀರಿಕೊಂಡರು. ಪಟೇಲರ ಅಂತರ್ಮುಖಿ ಸ್ವಭಾವದಿಂದ ಅವರ ಹೆಂಡತಿಯ ಬಗ್ಯೆ ಸಾರ್ವಜನಿಕರಿಗೆ ತಿಳಿದಿರುವುದು ಅತ್ಯಲ್ಪ. ಪಟೇಲರು ಮರುಮದುವೆ ಮಾಡಿಕೊಳ್ಳಲಿಲ್ಲ. 1918ರಲ್ಲಿ ತಮ್ಮ ಚೆನ್ನಾಗಿ ನಡೆಯುತ್ತಿದ್ದ ವಕೀಲಿ ವೃತ್ತಿ, ಅದರ ಘನತೆ,ಗೌರವ, ದೊಡ್ಡ ಮನೆ,ಸಂಪತ್ತು ಎಲ್ಲವನ್ನೂ ತ್ಯಜಿಸಿ ಸ್ವಾತಂತ್ರ್ಯ ಹೋರಾಟದ ಸರಳ ಜೀವನ, ಕಷ್ಟಕಾರ್ಪಣ್ಯ ಗಳಿಗೆ ತಮ್ಮನ್ನು ಅರ್ಪಿಸಿಕೊಂಡರು. ಮೊದಮೊದಲು ತಮ್ಮ ಮಿತ್ರರೊಂದಿಗೆ ಗಾಂಧಿಯವರ ರೀತಿನೀತಿಗಳನ್ನೂ, ರಾಜಕೀಯ ನೀತಿಗಳನ್ನೂ ಲೇವಡಿ ಮಾಡಿದ್ದರೂ, ಅನ್ನಿ ಬೆಸಂಟರ ಬಂಧನಕ್ಕೆ ಸಹಿಹಾಕಿದ ಪಿಟಿಷನ್ ಬದಲು ಸಾರ್ವಜನಿಕ ಪ್ರತಿಭಟನೆಮಾಡಬೇಕು ಎಂದು ಗಾಂಧಿ ಸೂಚಿಸಿದಾಗ,ಅವರ ಮನಃಪರಿವರ್ತನೆಯಾಯಿತು. ಗಾಂಧಿಯವರ ಚಂಪಾರಣ್ಯದ ಸತ್ಯಾಗ್ರಹದ ನಂತರ ಪಟೇಲರಿಗೆ ಭಾರತದ ಸ್ವಾತಂತ್ರ್ಯ ಹೋರಾಟದಲ್ಲಿ ಜಯ ಗಳಿಸಲು ಗಾಂಧಿ ಸಮರ್ಥರು ಎಂದು ನಂಬಿಕೆಯುಂಟಾಯಿತು. ಆ ಹಿರಿಯ ವ್ಯಕ್ತಿ ಭಾರತೀಯ ಮೌಲ್ಯಗಳಲ್ಲಿಟ್ಟಿದ್ದ ಶ್ರದ್ಧೆ, ಅತಿ ಸರಳ ಜೀವನ ಇವುಗಳಿಂದ ಆಕರ್ಷಿತರಾದ ಪಟೇಲರು ಗಾಂಧಿಯವರ ಆಪ್ತರಾದರು. ಪಟೇಲರು ಕಾಂಗ್ರೆಸ್ ಪಕ್ಷ ಸೇರಿದ್ದು 1918ರ ನಂತರ. ಅವರು ಕಾರ್ಯದರ್ಶಿಯಾಗಿದ್ದ ಗುಜರಾತ್ ಸಭಾ ೧೯೨೦ ರಲ್ಲಿ ಗುಜರಾತ್ ಪ್ರದೇಶ ಕಾಂಗ್ರೆಸ್ ಕಮಿಟಿಯಾಗಿ ಬದಲಾಯಿತು. ಅದರ ಅಧ್ಯಕ್ಷರಾಗಿ ನೇಮಕಗೊಂಡ ಅವರು 1947ರವರೆಗೂ ಅಲ್ಲಿ ಸೇವೆ ಸಲ್ಲಿಸಿದರು. ಖೇಡಾ ಹೋರಾಟದೊಂದಿಗೆ ಪಟೇಲರು ಸ್ವಾತಂತ್ರ್ಯ ಹೋರಾಟಕ್ಕೆ ಕಾಲಿಟ್ಟರು. ಗುಜರಾತಿನ ಖೇಡಾ ವಿಭಾಗವು ತೀವ್ರ ಕ್ಷಾಮದಿಂದ ತತ್ತರಿಸುತ್ತಿದ್ದು, ಅಲ್ಲಿಯ ರೈತರು ಕರ ವಿನಾಯಿತಿಗೆ ಬೇಡಿಕೆಯಿಟ್ಟರು. ಗಾಂಧಿ ಈ ಹೋರಾಟಕ್ಕೆ ಒಪ್ಪಿದ್ದರೂ ಸ್ವತಃ ಚಂಪಾರಣ್ಯದ ಚಟುವಟಿಕೆಗಳಲ್ಲಿ ತೊಡಗಿಸಿಕೊಂಡಿದ್ದರ ಕಾರಣ, ಈ ಹೋರಾಟದ ಮುಖಂಡತ್ವವನ್ನು ವಹಿಸಲು ಅಸಾಧ್ಯವಾಗಿತ್ತು. ಖೇಡಾ ವಿಷಯಕ್ಕಾಗಿ ಪೂರ್ಣಾವಧಿ ಸಮಯವನ್ನು ಮೀಸಲಿಡುವ ಸ್ವಯಂಸೇವಕನಿಗಾಗಿ ಗಾಂಧಿ ಕೇಳಿದಾಗ ಪಟೇಲರು ಕೈಯೆತ್ತಿ , ಎದ್ದು ನಿಂತರು. ಹಿಂದೆ ವಕೀಲರೂ, ಗಾಂಧಿಯವರ ಅನುಯಾಯಿಗಳೂ ಆಗಿದ್ದ ನರಹರಿ ಪಾರೀಖ್ ಮತ್ತು ಮೋಹನಲಾಲ್ ಪಂಡ್ಯರೊಂದಿಗೆ ಪಟೇಲರು ಹಳ್ಳಿಹಳ್ಳಿ ಪ್ರವಾಸ ಕೈಗೊಂಡು, ಗ್ರಾಮಸ್ಥರ ತೊಂದರೆಗಳನ್ನು ಪರಿಶೀಲಿಸಿ, ರಾಜ್ಯವ್ಯಾಪಿ ಆಂದೋಳನದಲ್ಲಿ ಅವರೆಲ್ಲರ ಬೆಂಬಲವನ್ನು ಬೇಡಿದರು. ರಾಜ್ಯದ ಎಲ್ಲೆಡೆಗಳಲ್ಲಿ ಹಿಂದೂ, ಮುಸ್ಲಿಂ ಎನ್ನದೆ, ಬಹುತೇಕ ಪ್ರತಿಯೊಬ್ಬರೂ ಪಟೇಲರ ಪರಿಶ್ರಮ ಮತ್ತು ನಾಯಕತ್ವವನ್ನು ಒಪ್ಪಿಕೊಂಡರು. ಪಟೇಲರು ಈ ಹೋರಾಟವು ಸಂಪೂರ್ಣ ಅಹಿಂಸಾತ್ಮಕವಾಗಿದ್ದು, ಹಳ್ಳಿಗರು ಒಗ್ಗಟ್ಟನ್ನು ಮುರಿಯಬಾರದೆಂದು ಸಾರಿಹೇಳಿದರು. ಪಟೇಲರ ಈ ಕಾರ್ಯದಲ್ಲಿ ರಾಷ್ಟ್ರೀಯವಾದಿಗಳಾದ ಅಬ್ಬಾಸ್ ತ್ಯಾಬ್ಜೀ ಮತ್ತು ಅಹಮದಾಬಾದಿನ ಸಾರಾಭಾಯ್ ಕೈಗೂಡಿಸಿದರು. ಹಳ್ಳಿಗರ ಕರನಿರಾಕರಣೆಯ ಸತ್ಯಾಗ್ರಹವನ್ನು ಮುರಿಯಲು ಸರಕಾರ ಪೋಲಿಸ್ ಪಡೆಗಳನ್ನು ಕಳುಹಿಸಿ, ಜಮೀನು, ಸಾಕುಪ್ರಾಣಿಗಳನ್ನೊಳಗೊಂಡು, ಆಸ್ತಿಪಾಸ್ತಿಗಳನ್ನು ಮುಟ್ಟುಗೋಲು ಹಾಕಿಕೊಳ್ಳಲು ಪ್ರಾರಂಭಿಸಿತು. ಸಾವಿರಾರು ಸಂಖ್ಯೆಯಲ್ಲಿ ಕಾರ್ಯಕರ್ತರು, ಗ್ರಾಮಸ್ಥರು, ಬಂಧಿತರಾದರೂ ಹಳ್ಳಿಗರ ಕಡೆಯಿಂದ ಹಿಂಸಾತ್ಮಕ ಪ್ರತಿಕ್ರಿಯೆ ಇಲ್ಲವೇಇಲ್ಲವೆನ್ನುವಷ್ಟು ಅಪರೂಪವಾಗಿತ್ತು. ಸತ್ಯಾಗ್ರಹಿಗಳಿಗೆ ರಾಜ್ಯಾದ್ಯಂತ ಜನಸಾಮಾನ್ಯರು, ಆಹಾರ, ಬಟ್ಟೆ ಮತ್ತು ಇತರ ಅವಶ್ಯಕತೆಗಳನ್ನು ಪೂರೈಸಿ, ಬೆಂಬಲ ಸೂಚಿಸಿದರು.ತೆರಿಗೆ ಸಲ್ಲಿಸಿದ ,ಸರಕಾರಕ್ಕೆ ಬೆಂಬಲವಿತ್ತ ಹಳ್ಳಿಗಳಿಗೆ ಗುಜರಾತಿನ ಜನ ಬಹಿಷ್ಕಾರ ಹಾಕಿದರು. ಈ ಪ್ರತಿಭಟನೆಗೆ ಭಾರತದಾದ್ಯಂತ ಸಹಾನುಭೂತಿ ವ್ಯಕ್ತವಾದರೂ, ಈ ಪ್ರತಿಭಟನೆ ಸ್ಥಳೀಯ ಸಮಸ್ಯೆಗಾಗಿತ್ತೇ ಹೊರತು, ಭಾರತದ ಸ್ವಾತಂತ್ರ್ಯಕ್ಕಾಗಿ ಆಗಿರಲಿಲ್ಲ ಎಂಬುದನ್ನು ಗಮನಿಸಬೇಕು. 1919ರಲ್ಲಿ ಸರಕಾರ ಮಣಿದು, ಕರವನ್ನು ಮುಂದೂಡಿದ್ದಷ್ಟೇ ಅಲ್ಲ, ಅದರ ದರವನ್ನೂ ಕಡಿಮೆ ಮಾಡುವುದರೊಂದಿಗೆ ಈ ಹೋರಾಟ ಮುಕ್ತಾಯ ಕಂಡಿತು. ಪಟೇಲರು ಈ ಸತ್ಯಾಗ್ರಹದಿಂದ ಮಹಾನಾಯಕ ಎಂದು ಗುಜರಾತಿ ಜನಮನ್ನಣೆಯನ್ನು ಪಡೆದು, ಭಾರತದಾದ್ಯಂತ ರಾಜಕೀಯ ಧುರೀಣರ ಮೆಚ್ಚುಗೆಯನ್ನು ಗಳಿಸಿದರು.1919 ರಿಂದ 1928ರವರೆಗೆ, ಪಟೇಲರು, ಅಸ್ಪ್ರಶ್ಯತೆ, ಮದ್ಯಪಾನ, ಬಡತನ ಹಾಗೂ ಅಜ್ಙಾನದ ವಿರುದ್ಧ ವ್ಯಾಪಕ ಚಳುವಳಿ ನಡೆಸಿದರು. 1922ರಲ್ಲಿ ಅಹಮದಾಬಾದಿನ ಮುನಿಸಿಪಾಲಿಟಿಯ ಅಧ್ಯಕ್ಷರಾಗಿ ಚುನಾಯಿತರಾದರು. ಇದರಿಂದ ಪಟೇಲರಿಗೆ ಸಾರ್ವಜನಿಕ ಸೇವೆಯೊಂದಿಗೆ ರಾಜನೀತಿ ಮತ್ತು ಆಡಳಿತರಂಗಗಳಲ್ಲಿ ಹೆಚ್ಚಿನ ಅನುಭವ ಪಡೆದುಕೊಳ್ಳುವ ಅವಕಾಶ ದೊರಕಿತು. ಇವರ ಆಡಳಿತಾವಧಿಯಲ್ಲಿ ಅಹಮದಾಬಾದಿಗೆ ವಿದ್ಯುತ್ ಸರಬರಾಜು, ಚರಂಡಿ ಹಾಗೂ ನೈರ್ಮಲ್ಯ ವ್ಯವಸ್ಥೆ, ಹಾಗೂ ಶಿಕ್ಷಣ ವ್ಯವಸ್ಥೆಗಳಲ್ಲಿ ಭಾರೀ ಸುಧಾರಣೆಗಳನ್ನು ತಂದರು. ಹಿಂದೂ-ಮುಸ್ಲಿಮ್ ವಿವಾದದಂತಹ ನಾಜೂಕು ವಿಷಯಗಳನ್ನೂ ಕೈಗೆತ್ತಿಕೊಂಡು, ನಗರದ ಬಹುತೇಕ ಜನಸಂಖ್ಯೆಯ ಹಿತದೃಷ್ಟಿಯನ್ನು ಗಮನದಲ್ಲಿಟ್ಟುಕೊಂಡು ನಿರ್ಧಾರಗಳನ್ನು ಕೈಗೊಂಡರು. 1928ರಲ್ಲಿ ಬಾರ್ಡೋಲಿಯು ದುರವಸ್ಥೆಗೀಡಾಯಿತು. ಗುಜರಾತಿನ ಬಹುತೇಕ ಭಾಗಗಳು ಕ್ಷಾಮದಿಂದ ತತ್ತರಿಸುವುದರೊಂದಿಗೇ, ಸರಕಾರ ಕಂದಾಯವನ್ನು ಹೆಚ್ಚು ಮಾಡಿತು. ಇದರ ವಿರುದ್ಧವಾಗಿ ಪಟೇಲರು ಜನಸಮೂಹವನ್ನು ಒಟ್ಟುಗೂಡಿಸಿ ನಡೆಸಿದ ಪ್ರತಿಭಟನೆ ದೇಶದಲ್ಲೆಲ್ಲ ಹೆಸರುಮಾಡಿತು.ಖೇಡಾ ಸತ್ಯಾಗ್ರಹಕ್ಕಿಂತ ಉಗ್ರವಾಗಿದ್ದ ಈ ಪ್ರತಿಭಟನೆಗೆ ಬೆಂಬಲವಾಗಿ ಗುಜರಾತಿನ ಅನೇಕ ಕಡೆಗಳಲ್ಲಿ ಜನರು ಸತ್ಯಾಗ್ರಹ ಹೂಡಿದರು. ಈ ಎರಡೂ ಹೋರಾಟಗಳು ಮುಗಿದ ನಂತರ ಪಟೇಲರು, ಜನಸಾಮಾನ್ಯರು ಕಳೆದುಕೊಂಡಿದ್ದ ಭೂಮಿಕಾಣಿ ಹಾಗೂ ಆಸ್ತಿಪಾಸ್ತಿಗಳನ್ನು ಮತ್ತೆ ಅವರಿಗೆ ವಾಪಸು ದೊರಕಿಸಿಕೊಡಲು ಬಹಳಷ್ಟು ಪರಿಶ್ರಮಪಟ್ಟರು. ಬಾರ್ಡೋಲಿಯ ಸತ್ಯಾಗ್ರಹದಿಂದ ಪಟೇಲರಿಗೆ ಸರದಾರ್ ಎಂಬ ಬಿರುದು ಪ್ರಾಪ್ತವಾಯಿತು. ಗುಜರಾತಿನ ಲಕ್ಷಾಂತರ ಜನರಿಗೆ ಪಟೇಲರು ಆರಾಧ್ಯದೈವವಾದರು. ಪಾರ್ಟಿಷನ್ ಕೌನ್ಸಿಲ್ಲಿನ, ಭಾರತದ ಪರವಾದ ಸದಸ್ಯರಾಗಿ ಪಟೇಲರು ಸರಕಾರಿ ಆಡಳಿತ ಯಂತ್ರಗಳ, ಆಸ್ತಿಪಾಸ್ತಿಗಳ ಸೂಕ್ತಹಂಚಿಕೆಯ ಮೇಲುಸ್ತುವಾರಿ ಮಾಡಿದರು ಭಾರತಕ್ಕಿಂತ ಗಾತ್ರದಲ್ಲೂ, ಜನಸಂಖ್ಯೆಯಲ್ಲೂ ಚಿಕ್ಕದಾಗಿದ್ದ ಪಾಕಿಸ್ತಾನಕ್ಕೆ, ಅದರ ಗಾತ್ರಕ್ಕನುಗುಣವಾಗಿ ಸಿಗಬೇಕಾಗಿದ್ದ ಸಂಪನ್ಮೂಲಗಳ ಭಾಗಕ್ಕಿಂತ ಹೆಚ್ಚಾಗಿ ಜಿನ್ನಾ ಪಡೆದುಕೊಳ್ಳದಂತೆ ಪಟೇಲರು ಎಚ್ಚರ ವಹಿಸಿದರು. ನೆಹರೂ ಮತ್ತು ಪಟೇಲರು ಜಂಟಿಯಾಗಿ ಕೇಂದ್ರ ಮಂತ್ರಿಮಂಡಲವನ್ನು ನಿರ್ಣಯಿಸಿ, ಪಟೇಲರು ಉಪಪ್ರಧಾನಿಯಾಗಿ ಗೃಹಖಾತೆಯನ್ನು ವಹಿಸಿಕೊಂಡರು. ತಮ್ಮ ಎಪ್ಪತ್ತೆರಡನೆಯ ವಯಸ್ಸಿನಲ್ಲಿ , ೫೬೫ ರಾಜ ಸಂಸ್ಥಾನಗಳನ್ನು ಭಾರತದಲ್ಲಿ ವಿಲೀನಗೊಳಿಸಿ, ಅಲ್ಲಿ ಪ್ರಜಾಪ್ರಭುತ್ವವನ್ನು ಜಾರಿಗೊಳಿಸುವ, ದೇಶದ ರಕ್ಷಣೆಯ ವ್ಯವಸ್ಥೆಯನ್ನು ರೂಪಿಸುವ, ಹಾಗೂ ಭಾರತವನ್ನು ಒಗ್ಗಟ್ಟಾದ ದೇಶವನ್ನಾಗಿ ಕಟ್ಟುವ ಮಹತ್ತರ ಜವಾಬ್ದಾರಿಯನ್ನು ಪಟೇಲರು ಹೊತ್ತುಕೊಂಡರು. ಅಷ್ಟೇ ಅಲ್ಲ, ಅಧಿಕಾರದ ವಿಕೇಂದ್ರೀಕರಣ, ಧಾರ್ಮಿಕ ಸಮಾನತೆ ಮತ್ತು ಸ್ವಾತಂತ್ರ್ಯ , ಆಸ್ತಿ ಹಕ್ಕು ಇತ್ಯಾದಿ ವಿಷಯಗಳನ್ನು ವಿಷದೀಕರಿಸಿ, ಭಾರತದ ಸಂವಿಧಾನದ ರಚನೆಯಲ್ಲಿ ಮಹತ್ವದ ಕೊಡುಗೆ ನೀಡಿದರು. 565 ಅರೆ-ಸ್ವತಂತ್ರ ಸಂಸ್ಥಾನಗಳಲ್ಲಿ ಹಂಚಿಹೋಗಿದ್ದ ಭಾರತವನ್ನು ಒಗ್ಗೂಡಿಸುವ ಮಹತ್ಕಾರ್ಯಕ್ಕೆ ಪಟೇಲರೇ ಸೂಕ್ತ ವ್ಯಕ್ತಿ ಎಂದು ಕಾಂಗ್ರೆಸ್ ಪಕ್ಷದ , ಮೌಂಟ್ ಬ್ಯಾಟನ್ನರ ಹಾಗೂ ಹಿರಿಯ ಬ್ರಿಟಿಷ್ ಅಧಿಕಾರಿಗಳ ಒಮ್ಮತದ ಅಭಿಪ್ರಾಯವಾಗಿತ್ತು. “ರಾಜ್ಯಗಳ ಈ ಸಮಸ್ಯೆ ಎಷ್ಟು ಸಂಕೀರ್ಣವಾಗಿದೆಯೆಂದರೆ ನೀವೊಬ್ಬರೇ ಅದನ್ನು ಬಗೆಹರಿಸಲು ಸಮರ್ಥರು” ಎಂದು ಗಾಂಧೀಜಿ ಕೂಡಾ ಪಟೇಲರಿಗೆ ಹೇಳಿದ್ದರು. ಈ ಗುರುತರ ಕಾರ್ಯವನ್ನು ಯಶಸ್ವಿಯಾಗಿ ಕೈಗೂಡಿಸುವ ಮನಃ ಸ್ಥೈರ್ಯ , ಚಾಣಾಕ್ಷತನ ಹಾಗೂ ಅಚಲತೆ ಇದ್ದವರಾದ ಪಟೇಲರು, ರಾಷ್ಟ್ರಹಿತಕ್ಕಾಗಿ ಮುಂದೆ ನಿಂತು ಸರ್ಕಾರದ ನಿರ್ಧಾರಗಳನ್ನು ಜಾರಿಮಾಡುವುದಕ್ಕೆ ತಯಾರಿದ್ದರೂ, ಸಂಸ್ಥಾನಿಕರೊಂದಿಗೆ ಸಂಧಾನ ನಡೆಸಲು ಬೇಕಾದ ಅನುಭವವನ್ನೂ, ಮುತ್ಸದ್ದಿತನವನ್ನೂ ಪಡೆದುಕೋಡಿದ್ದರು. ಬಹಳಷ್ಟು ಸಂಸ್ಥಾನಿಕ ರಾಜರುಗಳನ್ನು ತಮ್ಮ ಮನೆಗೆ ಆಹ್ವಾನಿಸಿ ಭೋಜನ, ಅಥವಾ ಚಹಾ ಸತ್ಕಾರ ಏರ್ಪಡಿಸಿದ ಪಟೇಲರು, ಈ ಸಾಮಾಜಿಕ ಹಾಗೂ ಅನಧಿಕೃತ ಭೇಟಿಗಳ ಮೂಲಕ ಅವರನ್ನು ವಿಲೀನದ ಪ್ರಕ್ರಿಯೆಯಲ್ಲಿ ತೊಡಗಿಸಿದರು.ಕಾಂಗ್ರೆಸ್ ಹಾಗೂ ಈ ರಾಜಕುಮಾರರಲ್ಲಿ ಮೂಲಭೂತವಾದ ಯಾವುದೇ ಚಕಮಕಿಯಿಲ್ಲ ಎಂದು ಪಟೇಲರು ಸ್ಪಷ್ಟಪಡಿಸಿದರೂ , ೧೯೪೭ ಆಗಸ್ಟ್ ೧೫ರ ಒಳಗಾಗಿ ಭಾರದಲ್ಲಿ ವಿಲೀನವಾಗುವಂತೆ ಅವರನ್ನು ಆಗ್ರಹಿಸಿದರು.ತಮ್ಮ ಪ್ರಜೆಗಳ ಭವಿಷ್ಯದ ಹಿತಕ್ಕಾಗಿ ರಾಜ್ಯವನ್ನು ಭಾರತಕ್ಕೆ ಬಿಟ್ಟುಕೊಡುವಂತೆಯೂ, ಭಾರತದಿಂದ ಸ್ವತಂತ್ರವಾಗಿ ರಾಜ್ಯಭಾರ ಮಾಡುವುದರ , ಅದರಲ್ಲೂ ಮುಖ್ಯವಾಗಿ ಹೆಚ್ಚುತ್ತಿದ್ದ ಪ್ರತಿಭಟನೆಯ ವಿರುದ್ಧ, ನಿರರ್ಥಕತೆಯನ್ನೂ ಈ 565 ರಾಜರುಗಳಿಗೆ ಮನದಟ್ಟು ಮಾಡಿಕೊಟ್ಟರು. ವಿಲೀನವಾದವರ ಪೀಳಿಗೆಯವರಿಗೆ ರಾಜಧನದ ಆಶ್ವಾಸನೆಯನ್ನೂ ಅವರು ನೀಡಿದರು. ಬರಿಯ ಮೂರು, ಕಾಶ್ಮೀರ, ಹೈದರಾಬಾದು ಹಾಗೂ ಜುನಾಘಢ, ರಾಜ್ಯಗಳನ್ನು ಹೊರತುಪಡಿಸಿ, ಬಾಕಿ ಎಲ್ಲಾ ಸಂಸ್ಥಾನಗಳೂ ವಿಲೀನಕ್ಕೆ ಒಪ್ಪಿದವು. ತಮ್ಮ ಸ್ವಂತ ರಾಜ್ಯ ಗುಜರಾತಿನಲ್ಲಿದ್ದ ಜುನಾಘಡ ಸಂಸ್ಥಾನ ಪಟೇಲರಿಗೆ ಸಹಜವಾಗಿಯೇ ಮಹತ್ವದ್ದಾಗಿತ್ತು. ಅಲ್ಲಿಯ ನವಾಬರ ಮೇಲೆ ಪಾಕಿಸ್ತಾನ ಸೇರುವಂತೆ ಸರ್ ಶಾ ನವಾಜ್ ಭುಟ್ಟೋ ಒತ್ತಡ ಹೇರಿದ್ದರು. ಜುನಾಗಡ ಪಾಕಿಸ್ತಾನದಿಂದ ಸಾಕಷ್ಟು ದೂರವಿದ್ದದ್ದಷ್ಟೇ ಅಲ್ಲ ಅಲ್ಲಿಯ ಜನಸಂಖ್ಯೆಯ ಶೇಕಡಾ ೮೦ ಹಿಂದೂಗಳಾಗಿದ್ದರು. ಪಟೇಲರು ಮುತ್ಸದ್ದಿತನದೊಡನೆ, ಬಲಪ್ರದರ್ಶನವನ್ನೂ ಮಾಡಿ ಪಾಕಿಸ್ತಾನ ಜುನಾಘಡದಿಂದ ದೂರವಿರುವಂತೆಯೂ, ಹಾಗೂ ಜುನಾಘಡವು ಭಾರತದೊಂದಿಗೆ ವಿಲೀನವಾಗಬೇಕೆಂದೂ ಒತ್ತಡ ಹಾಕಿದರು. ಇದರೊಂದಿಗೆ ಸೇನೆಯ ತುಕಡಿಗಳನ್ನು ಜುನಾಘಡದ ಮೂರು ಪ್ರದೇಶಗಳಿಗೆ ಕಳುಹಿಸಿ ತಮ್ಮ ಧೃಢನಿರ್ಧಾರವನ್ನು ಪ್ರಕಟಪಡಿಸಿದರು. ವ್ಯಾಪಕ ಪ್ರತಿಭಟನೆಯ ನಂತರ ಜನಪರ ಸರ್ಕಾರ (ಆರ್ಜೀ ಹುಕುಮತ್) ರಚನೆಯಾದ ಮೇಲೆ ಭುಟ್ಟೋ ಮತ್ತು ನವಾಬ ಇಬ್ಬರೂ ಪಾಕಿಸ್ತಾನಕ್ಕೆ ಪಲಾಯನ ಮಾಡಿದರು. Hyderabad state in 1909. Its area stretches over the present Indian states of Andhra Pradesh, Karnataka, Maharashtra. ಪಟೇಲರ ಆದೇಶದ ಮೇರೆ ಭಾರತೀಯ ಸೇನೆ ಹಾಗೂ ಪೋಲೀಸ್ ಪಡೆಗಳು ಜುನಾಘಡವನ್ನು ಪ್ರವೇಶಿಸಿದವು. ಮುಂದೆ ನಡೆದ ಜನಮತಗಣನೆಯಲ್ಲಿ ಶೇಕಡಾ ೯೯.೫ ಮಂದಿ ಭಾರತದೊಂದಿಗೆ ವಿಲೀನದ ಪರವಾಗಿ ಮತವಿತ್ತರು. ಇಂದಿನ ಕರ್ನಾಟಕ, ಮಹಾರಾಷ್ಟ್ರ ಮತ್ತು ಆಂಧ್ರದ ಭಾಗಗಳನ್ನೊಳಗೊಂಡ ಹೈದರಾಬಾದ್ ಭಾರತದ ಸಂಸ್ಥಾನಗಳಲ್ಲಿಯೇ ಅತಿ ದೊಡ್ಡದಾಗಿತ್ತು. ಅಲ್ಲಿನ ನಿಜಾಮ ಮುಸ್ಲಿಮರಾಗಿದ್ದರೂ ಜನಸಂಖ್ಯೆಯ ಶೇಕಡಾ ೮೦ ಹಿಂದೂಗಳಾಗಿದ್ದರು.ಜಿನ್ನಾ ಮೊದಲಾದ ಪಾಕಿಸ್ತಾನ ನಾಯಕರು ಹಾಗೂ ಬ್ರಿಟೀಷ್ ರ ಬೆಂಬಲದಿಂದ, ಹೈದರಾಬಾದ್ ಸಂಸ್ಥಾನವನ್ನು ಸ್ವತಂತ್ರ ರಾಷ್ಟ್ರವೆಂದು ನಿಜಾಮ ಘೋಷಿಸಿದ. ಆತನ ಸೇನೆಗೆ ಅತ್ಯಾಧುನಿಕ ಸಿಡ್ನಿ ಕಾಟನ್ ಬಂದೂಕುಗಳು, ಮದ್ದುಗುಂಡುಗಳನ್ನು ಮತ್ತು ತರಬೇತಿಯನ್ನು ಬ್ರಿಟೀಷ್ ರು ನೀಡಿದರು.ಕಾಸೀಂ ರಜ್ವಿಯಂಬ ಮತಾಂಧ ಮತ್ತು ಉಗ್ರವಾದಿಯ ಮುಂದಾಳುತ್ವದಲ್ಲಿ ಸಾವಿರಾರು ಜನ ರಜಾಕಾರರು, ಹೈದರಾಬಾದ್ ಸಂಸ್ಥಾನದಲ್ಲಿ ಜನಸಾಮಾನ್ಯರ ಮೇಲೆ ಆಕ್ರಮಣ ನೆಡೆಸಿದರು. ಮಹಿಳೆಯರ ಮಾನಭಂಗ, ಮಕ್ಕಳ ಹತ್ಯೆ, ಜನರ ಹತ್ಯೆ ಇವು ಸಾವಿರಾರು ಕಡೆ ನೆಡೆದವು. ಸ್ವಾಮಿ ರಮಾನಂದತೀರ್ಥರ ನೇತೃತ್ವದಲ್ಲಿ ಹೈದರಾಬಾದ್ ಪ್ರಾಂತ್ಯ ವಿಮೋಚನಾ ಹೋರಾಟ ನೆಡೆಯಿತು. ಕರ್ನಾಟಕದ ಮುಂಡರಗಿಯ ಶಿಬಿರಕ್ಕೆ ಕೇಂದ್ರ ಮಂತ್ರಿ ಗಾಡ್ಗೀಳರನ್ನು ಕಳುಹಿಸಿದ ಪಟೇಲ್ ರು, ಈ ಹೋರಾಟಕ್ಕೆ ಬೆಂಬಲ ನೀಡಿ ಪ್ರೋತ್ಸಾಹಿಸಿದರು. ಯುದ್ಧ ಭೀತಿಯಿಂದ ಹತಾಶರಾಗಿದ್ದ ಮೌಂಟ್ ಬ್ಯಾಟನ್ನರ ಪ್ರಯತ್ನದಿಂದ ತಟಸ್ಥ ಒಪ್ಪಂದವಾದರೂ, ನಿಜಾಮ ತನ್ನ ನಿಲುವನ್ನು ಬದಲಾಯಿಸಿ, ಈ ಒಪ್ಪಂದವನ್ನು ತಿರಸ್ಕರಿಸಿದ. ವಿಶ್ವಸಂಸ್ಥೆಗೆ ಈ ವಿವಾದವನ್ನು ಒಪ್ಪಿಸುವ ಕುತಂತ್ರ ಅವನದಾಗಿತ್ತು. 1948ರ ಸೆಪ್ಟೆಂಬರಿನಲ್ಲಿ ಪಟೇಲರು ಭಾರತ ಇನ್ನು ಕಾಯಲಾಗದು ಎಂದು ರಾಜಾಜಿಯವರನ್ನು ಒಪ್ಪಿಸಿ, ಹೈದರಾಬಾದನ್ನು ವಶಕ್ಕೆ ತೆಗೆದುಕೊಳ್ಳಲು ಭಾರತದ ಸೇನೆಯನ್ನು ಕಳುಹಿಸಿದರು. ಆಪರೇಷನ್ ಪೋಲೋ ಎಂಬ ಈ ಕಾರ್ಯಾಚರಣೆಯಲ್ಲಿ ಸಾವಿರಾರು ರಜಾಕಾರರು ಕೊಲ್ಲಲ್ಪಟ್ಟರು. ೧೯೪೮ ಸೆಪ್ಟೆ೦ಬರ್ ೧೭ ರ೦ದು ಈಗಿನ ಬೀದರ್ ಜಿಲ್ಲೆಯ ಹುಮುನಾಬಾದಿನಲ್ಲಿ ನಿಜಾಮರ ಸೈನ್ಯ ಶರಣಾಯಿತು. ಹೈದರಾಬಾದು ಪ್ರಾ೦ತ್ಯ ಸುರಕ್ಷಿತವಾಗಿ ಭಾರತದ ಭಾಗವಾಯಿತು. ಕೇವಲ ಎರಡುದಿನವಷ್ಟೇ ನಡೆದ ಕಾರ್ಯಚರಣೆಯನ್ನು, ಭಾರತ ಸರಕಾರದ ದಾಖಲೆಗಳಲ್ಲಿ ಪೋಲೀಸ್ ಕಾರ್ಯಚರಣೆಯೆ೦ದು ಕರೆಯಲಾಗಿದೆ. ನಿಜಾಮರ ಸೈನ್ಯದ ಸೈನ್ಯಾಧಿಕಾರಿ ಒಬ್ಬ ಬ್ರಿಟಿಷ್ ಆಗಿದ್ದನೆ೦ಬುವುದು ಇಲ್ಲಿ ಗಮನಾರ್ಹ. ಬಲಪ್ರಯೋಗದಿಂದ ಹೈದರಾಬಾದನ್ನು ವಶಪಡಿಸಿಕೊಂಡಲ್ಲಿ ಅದು ಹಿಂದೂ-ಮುಸ್ಲಿಮ್ ದಂಗೆಗಳಿಗೆ ಅವಕಾಶ ಕೊಡಬಹುದು ಎಂದು ಮೌಂಟ್ ಬ್ಯಾಟನ್ ಮತ್ತು ನೆಹರೂ ಶಂಕಿಸಿ ಹಿಂಜರಿದರೂ, ಪಟೇಲರು ಹೈದರಾಬಾದನ್ನು ಹಾಗೆಯೇ ಬಿಟ್ಟಲ್ಲಿ ಅದು ಭಾರತದ ಪ್ರತಿಷ್ಟೆಗೇ ಸವಾಲಾಗುವುದಷ್ಟೇ ಅಲ್ಲ, ಅದರಿಂದಾಗಿ ಹಿಂದೂಗಳಾಗಲೀ, ಮಸಲ್ಮಾನರಾಗಲೀ ಆ ರಾಜ್ಯದಲ್ಲಿ ಸುರಕ್ಷಿತವಾಗಿರಲು ಸಾಧ್ಯವಿಲ್ಲ ಎಂದು ಪ್ರತಿಪಾದಿಸಿದರು. ಯಾವುದೇ ನಾಗರೀಕ ಪ್ರತಿಭಟನೆಯಿಲ್ಲದೇ ಯಶಸ್ವಿಯಾದ ಹೈದರಾಬಾದಿನ ವಿಲೀನವನ್ನು ಅನೇಕ ಭಾರತೀಯ ಮುಸ್ಲಿಮರು ಕೊಂಡಾಡಿದರು. ನಿಜಾಮರ ಮೇಲೆ ಸಂತಾಪವಿದ್ದರೂ, ಪಟೇಲರು ಅವರನ್ನು ರಾಜ್ಯದ ಅಲಂಕಾರಿಕ ಮುಖ್ಯಸ್ಥನನ್ನಾಗಿ ನೇಮಿಸಿದರು. ಮುಂದೆ ನಡೆದ ಮಾತುಕತೆಯಲ್ಲಿ ನಿಜಾಮರು ಪಟೇಲರನ್ನು ಕ್ಷಮಾಪಣೆ ಕೇಳಿದ್ದರಿಂದ ಪಟೇಲರು ದೊಡ್ಡ ಮನಸ್ಸಿನಿಂದ ವೈರವನ್ನು ತಮ್ಮ ಮನಸ್ಸಿನಿಂದ ತೆಗೆದುಹಾಕಿದರು. ಹೈದರಾಬಾದು ಮತ್ತು ಜುನಾಘಡವನ್ನು ಭಾರತಕ್ಕೆ ಜಿನ್ನಾ ಬಿಟ್ಟುಕೊಟ್ಟರೆ , ಕಾಶ್ಮೀರ ಪಾಕಿಸ್ತಾನಕ್ಕೆ ಹೋಗುವುದಕ್ಕೆ ಅಡ್ಡಿಯಿಲ್ಲ ಎಂಬ ವಿಚಾರ ಪಟೇಲರ ಮನಸ್ಸಿನಲ್ಲಿ ಇರಬಹುದು ಎಂದು ರಾಜಮೋಹನ ಗಾಂಧಿ ಊಹಿಸುತ್ತಾರೆ. ತಮ್ಮ ಪಟೇಲ್ : ಎ ಲೈಫ್ ಎಂಬ ಪುಸ್ತಕದಲ್ಲಿ ಹೈದರಾಬಾದು ಮತ್ತು ಜುನಾಘಡವನ್ನು ಜಿನ್ನಾ ತಮ್ಮ ಸಂಘರ್ಷದ ಭಾಗವಾಗಬಯಸಿದ್ದರು ಎಂದು ಪ್ರತಿಪಾದಿಸುತ್ತಾರೆ. ಭಾರತ ಹೈದರಾಬಾದು ಮತ್ತು ಜುನಾಘಡಗಳಲ್ಲಿ ಜನಮತಗಣನೆ ಮಾಡಬೇಕು ಎಂಬ ಬೇಡಿಕೆಯನ್ನಿಟ್ಟ ಜಿನ್ನಾರ ಉದ್ದೇಶ, ಮುಂದೆ ಇದೇ ತತ್ವವನ್ನು ಕಾಶ್ಮೀರಕ್ಕೂ ಅನ್ವಯಿಸಬೇಕಾಗುತ್ತದೆ ಹಾಗೂ ಜಿನ್ನಾರ ನಂಬಿದ್ದಂತೆ, ಅಲ್ಲಿಯ ಮುಸ್ಲಿಮ್ ಬಹುಸಂಖ್ಯಾತರು ಪಾಕಿಸ್ತಾನದ ಪರವಾಗಿ ಒಲವು ತೋರಿಸುವರು , ಎಂದಿತ್ತು ಎಂಬ ಅಭಿಪ್ರಾಯವೂ ಇದೆ. ” ಹೈದರಾಬಾದು ಎಚ್ಚರಿಕೆಯಿಂದಿಲ್ಲದಿದ್ದರೆ, ಜುನಾಘಡದ ಗತಿಯೇ ಅದಕ್ಕೂ ಆದೀತು. ಪಾಕಿಸ್ತಾನ ಕಾಶ್ಮೀರವನ್ನು ಜುನಾಘಡದ ವಿರುದ್ಧ ದಾಳವಾಗಿ ಉಪಯೋಗಿಸಲು ನೋಡಿದೆ. ಜನಾಭಿಪ್ರಾಯದ ತಳಹದಿಯ ಮೇಲೆ ಈ ವಿಷಯವನ್ನು ಬಗೆಹರಿಸಲು ನಾವು ಪಾಕಿಸ್ತಾನಕ್ಕೆ ಸೂಚಿಸಿದಾಗ, ಕಾಶ್ಮೀರಕ್ಕೆ ಈ ನೀತಿಯನ್ನು ಅನುಸರಿಸುವಂತೆ ಅವರಿಂದ ತಕ್ಷಣದ ಪ್ರತಿಕ್ರಿಯೆ ಬಂತು. ನೀವು ಹೈದರಾಬಾದಿನಲ್ಲಿ ಈ ನೀತಿಗೆ ಒಪ್ಪಿದರೆ ನಾವು ಕಾಶ್ಮೀರದಲ್ಲಿ ಒಪ್ಪಬಹುದು ಎಂದು ಅದಕ್ಕೆ ನಾವು ಜವಾಬು ಕೊಟ್ಟೆವು.” ಭಾರತವನ್ನು ಒಟ್ಟುಗೂಡಿಸುವುದು ಸುಲಭದಕೆಲಸವೇನಾಗಿರಲಿಲ್ಲ. ಪಟೇಲರ ಗಣನೀಯಸೇವೆಯನ್ನು ಗಮನದಲ್ಲಿಟ್ಟು ಅವರನ್ನು ಭಾರತದ ಬಿಸ್ಮಾರ್ಕ್ ಎ೦ದು ಕರೆಯಲಾಗುತ್ತದೆ. ಪಟೇಲರು ಭಾರತದ ಕಾನ್ಸ್ಟಿಟ್ಯುಯೆಂಟ್ ಅಸೆಂಬ್ಲಿಯ ಹಿರಿಯ ಸದಸ್ಯರಾಗಿದ್ದರು. ಭಾರತದ ಸಂವಿಧಾನದಲ್ಲಿ ನಾಗರಿಕ ಸ್ವಾತಂತ್ರ್ಯದ ರೂಪರೇಷೆಗಳನ್ನು ನಿರ್ಧರಿಸುವುದಕ್ಕಾಗಿ ರಚಿಸಲಾಗಿದ್ದ ಅನೇಕ ಮಹತ್ವದ ಸಮಿತಿಗಳ ನಾಯಕರಾಗಿದ್ದರು. ಸರಕಾರದ ರಕ್ಷಣಾತ್ಮಕ ಅಧಿಕಾರವಿರುವ, ವ್ಯಾಪಕ ವೈಯಕ್ತಿಕ ಸ್ವಾತಂತ್ರ್ಯಕ್ಕೆ ಅವರು ಬೆಂಬಲ ನೀಡಿದರು. ರಾಷ್ಟ್ರೀಕೃತ ಸಿವಿಲ್ ಸರ್ವೀಸನ್ನು ಅವರು ಬಲವಾಗಿ ಬೆಂಬಲಿಸಿದ್ದಲ್ಲದೇ , ಆಸ್ತಿ ಹಕ್ಕು ಮತ್ತು ರಾಜಧನದ ಕಲಮುಗಳನ್ನೂ ಸೇರಿಸಿದರು. ಮೋಹನ್ ದಾಸ್ ಕರಮ್‍ಚಂದ್ ಗಾಂಧಿ (ಅಕ್ಟೋಬರ್ ೨, ೧೮೬೯ – ಜನವರಿ ೩೦, ೧೯೪೮), ಜನಪ್ರಿಯವಾಗಿ ಮಹಾತ್ಮ ಗಾಂಧಿ, ಆಧುನಿಕ ಭಾರತ ದೇಶದ ಪಿತಾಮಹರಲ್ಲಿ ಒಬ್ಬರು, ಮತ್ತು ಭಾರತೀಯ ಸ್ವಾತಂತ್ರ್ಯ ಚಳುವಳಿಯ ಪ್ರಭಾವಶಾಲಿ ನಾಯಕರು ಮತ್ತು ಸತ್ಯಾಗ್ರಹಿಗಳು. ಬ್ರಿಟಿಷ್ ಆಡಳಿತದಿಂದ ಭಾರತ ಸ್ವಾತಂತ್ರ್ಯ ಪಡೆಯುವುದರಲ್ಲಿ ಮುಖ್ಯ ಪಾತ್ರ ವಹಿಸಿದರಲ್ಲದೆ, ಪರದೇಶದ ಆಡಳಿತಕ್ಕೆ ಒಳಗಾಗಿದ್ದ ಇತರ ದೇಶಗಳಲ್ಲಿಯೂ ಸ್ವಾತಂತ್ರ್ಯ ಚಳುವಳಿಗೆ ಸ್ಫೂರ್ತಿ ತಂದರು. ಮಾರ್ಟಿನ್ ಲೂಥರ್ ಕಿಂಗ್, ನೆಲ್ಸನ್ ಮಂಡೇಲಾ ಮೊದಲಾದ ಅಹಿಂಸಾವಾದಿ ಹೋರಾಟಗಾರರು ಗಾಂಧೀಜಿಯವರ ಸತ್ಯಾಗ್ರಹದ ತತ್ವದಿಂದ ಆಳವಾಗಿ ಪ್ರಭಾವಿತರಾದವರು. ಗಾಂಧೀಜಿಯವರ ಹೇಳಿಕೆಯಂತೆ, ಅವರ ಮೌಲ್ಯಗಳು ಸರಳ ಧಾರ್ಮಿಕ ನಂಬಿಕೆಗಳಿಂದ ಬಂದಂಥವು: ಸತ್ಯ ಮತ್ತು ಅಹಿಂಸೆ. ಮೋಹನದಾಸ್ ಕರಮ್‍ಚಂದ್ ಗಾಂಧಿಯವರು ಅಕ್ಟೋಬರ್ ೨, ೧೮೬೯ ರಲ್ಲಿ ಭಾರತದ ಗುಜರಾತ್ ರಾಜ್ಯದ ಪೋರಬಂದರ್ ನಲ್ಲಿ ಜನಿಸಿದರು. ಆಗಿನ ಪೋರಬಂದರಿನ ದಿವಾನರಾಗಿದ್ದ ಕರಮ್ಚಂದ್ ಗಾಂಧಿ ಇವರ ತಂದೆ, ಮತ್ತು ತಾಯಿ ಪುತಲೀಬಾಯಿ. ೧೩ ನೆಯ ವಯಸ್ಸಿನಲ್ಲಿ ಗಾಂಧೀಜಿ ಅದೇ ವಯಸ್ಸಿನ ಕಸ್ತೂರ್ಬಾ ರನ್ನು ವಿವಾಹಗೊಂಡರು. ನಂತರ ಇವರಿಗೆ ನಾಲ್ಕು ಮಕ್ಕಳು: ಹರಿಲಾಲ್ ಗಾಂಧಿ (ಜ: ೧೮೮೮), ಮಣಿಲಾಲ್ ಗಾಂಧಿ (ಜ: ೧೮೯೨), ರಾಮದಾಸ್ ಗಾಂಧಿ (ಜ: ೧೮೯೭) ಮತ್ತು ದೇವದಾಸ್ ಗಾಂಧಿ (ಜ: ೧೯೦೦). ೧೯ ನೆಯ ವಯಸ್ಸಿನಲ್ಲಿ ಗಾಂಧೀಜಿ ಲಂಡನ್ ನಗರದ ಯೂನಿವರ್ಸಿಟಿ ಕಾಲೇಜಿನಲ್ಲಿ ವಕೀಲಿ ವೃತ್ತಿಗಾಗಿ ತರಬೇತು ಪಡೆಯಲು ತೆರಳಿದರು. ಭಾರತಕ್ಕೆ ಮರಳಿದ ನಂತರ ಮುಂಬೈ ನಗರದಲ್ಲಿ ವಕೀಲಿ ವೃತ್ತಿಯನ್ನು ಆರಂಭಿಸಲು ಬಹಳ ಪ್ರಯತ್ನಿಸಿದರು. ಹೆಚ್ಚು ಯಶಸ್ಸು ಕಾಣದಿದ್ದರೂ, ಎರಡು ವರ್ಷಗಳ ನಂತರ ದಕ್ಷಿಣ ಆಫ್ರಿಕಾ ಕ್ಕೆ ಕೆಲಸದ ಮೇಲೆ ತೆರಳಿದರು. ಅಲ್ಲಿ ಭಾರತೀಯ ಮೂಲದ ನಿವಾಸಿಗಳಿಗೆ ಸಮಾನ ಹಕ್ಕುಗಳನ್ನು ನೀಡದ ಬ್ರಿಟಿಷ್ ಸರ್ಕಾರದ ವರ್ಣಭೇದ ನೀತಿಯನ್ನು ನೋಡಿ ಬೇಸರಗೊಂಡ ಗಾಂಧೀಜಿ ಅಲ್ಲಿನ ವರ್ಣಭೇದ ನೀತಿಯನ್ನು ಅಳಿಸಲು ಚಳುವಳಿಯನ್ನು ಆರಂಭಿಸಿದರು. ಅಲ್ಲಿನ ಪೀಟರ್ ಮ್ಯಾರಿಟ್ಸ್ ಬರ್ಗ್ ಎಂಬ ನಗರದಲ್ಲಿ ರೈಲಿನಲ್ಲಿ ಮೊದಲ ದರ್ಜೆ ಟಿಕೆಟ್ ತೆಗೆದುಕೊಂಡಿದ್ದರೂ ಅಲ್ಲಿ ಕೂರಲು ಬಿಡದೆ ರೈಲಿನಿಂದ ಹೊರಹಾಕಿದಾಗ ಅವರ ವರ್ಣಭೇದ ನೀತಿಯ ವಿರುದ್ಧ ಹೋರಾಡುವ ನಿಶ್ವಯ ಸ್ಥಿರವಾಯಿತು. ನವಂಬರ್ ೬, ೧೯೧೩ ರಲ್ಲಿ ಭಾರತೀಯ ಗಣಿಗಾರರ ಒಂದು ಮೆರವಣಿಗೆಯಲ್ಲಿ ಹೋಗುತ್ತಿದ್ದಾಗ ಗಾಂಧೀಜಿ ಬಂಧಿತರಾದರು. ಗಾಂಧೀಜಿವರ ತತ್ವಗಳಿಗೆ ಮುಖ್ಯ ಸ್ಫೂರ್ತಿ ಭಗವದ್ಗೀತೆ, ಮತ್ತು ರಷ್ಯದ ಪ್ರಸಿದ್ಧ ಸಾಹಿತಿ ಲಿಯೋ ಟಾಲ್‍ಸ್ಟಾಯ್ ಅವರ ಬರಹಗಳು. ೧೯೧೦ರಲ್ಲಿ ಟಾಲ್‍ಸ್ಟಾಯ್ ಅವರ ನಿಧನದವರೆಗೂ ಗಾಂಧೀಜಿ ಅವರೊಂದಿಗೆ ಪತ್ರವ್ಯವಹಾರವನ್ನು ಇಟ್ಟುಕೊಂಡಿದ್ದರು. ಟಾಲ್‍ಸ್ಟಾಯ್ ಅವರು ೧೯೦೮ರಲ್ಲಿ ಭಾರತದ ತೀವ್ರವಾದಿ ಸ್ವಾತಂತ್ರ್ಯಹೋರಾಟಗಾರರಿಗೆ ಬರೆದ ಪತ್ರವನ್ನು (ಹಿಂದೂ ಮಿತ್ರನಿಗೊಂದು ಪತ್ರ) ಗಾಂಧೀಜಿಯವರೇ ಭಾಷಾಂತರಿಸಿದರು. ಈ ಪತ್ರದಲ್ಲಿ ಟಾಲ್‍ಸ್ಟಾಯ್ ಅವರು ವೇದಗಳಲ್ಲಿನ ಹಿಂದೂ ತತ್ವಶಾಸ್ತ್ರ ಮತ್ತು ಕೃಷ್ಣನ ಕಥೆಗಳ ಮೂಲಕ ಅಂದಿನ ಭಾರತೀಯ ರಾಷ್ಟ್ರೀಯವಾದದ ಬಗೆಗೆ ತಮ್ಮ ಅಭಿಪ್ರಾಯಗಳನ್ನು ಮಂಡಿಸಿದ್ದರು. ಗಾಂಧೀಜಿಯವರು ಅಮೆರಿಕನ್ ಸಾಹಿತಿ ಹೆನ್ರಿ ಡೇವಿಡ್ ಥೋರ್ಯೂ ನ ಪ್ರಬಂಧಗಳಿಂದಲೂ ಪ್ರಭಾವಿತರಾಗಿದ್ದರು. ಮೊದಲನೆಯ ಮಹಾಯುದ್ಧದ ಸಮಯದಲ್ಲಿ ಗಾಂಧೀಜಿಯವರು ಭಾರತಕ್ಕೆ ಮರಳಿ ಭಾರತೀಯರು ಬ್ರಿಟಿಷರ ಪರವಾಗಿ ಯುದ್ಧದಲ್ಲಿ ಭಾಗವಹಿಸುವಂತೆ ಕೇಳಿಕೊಂಡು ಇದಕ್ಕಾಗಿ ಪ್ರಚಾರ ಮಾಡಿದರು. ಯುದ್ಧದ ನಂತರ ಗಾಂಧೀಜಿಯವರು ಭಾರತ ರಾಷ್ಟ್ರೀಯ ಕಾಂಗ್ರೆಸ್ ನ ಜೊತೆ ಸ್ವಾತಂತ್ರ್ಯ ಚಳುವಳಿಗೆ ಧುಮುಕಿದರು. ಉಪವಾಸ ಸತ್ಯಾಗ್ರಹ ಮತ್ತು ಅಸಹಕಾರ ಚಳುವಳಿಗಳ ಮೂಲಕ ಪ್ರಪಂಚದಾದ್ಯಂತ ಖ್ಯಾತಿ ಗಳಿಸಿದರು. ಹಲವಾರು ಬಾರಿ ಬ್ರಿಟಿಷ್ ಸರ್ಕಾರ ಇವರನ್ನು ಬಂಧನದಲ್ಲಿರಿಸಿತು. ಗಾಂಧೀಜಿಯವರ ಯಶಸ್ವಿ ಸತ್ಯಾಗ್ರಹಗಳಲ್ಲಿ ಇನ್ನೊಂದೆಂದರೆ ಸ್ವದೇಶಿ ಚಳುವಳಿ – ಪರದೇಶಗಳಲ್ಲಿ ಉತ್ಪಾದಿತವಾದ ವಸ್ತುಗಳನ್ನು, ಮುಖ್ಯವಾಗಿ ಬ್ರಿಟಿಷ್ ವಸ್ತುಗಳನ್ನು, ವರ್ಜಿಸಿ ಭಾರತದಲ್ಲಿ ಉತ್ಪಾದಿಸಲಾದ ವಸ್ತುಗಳನ್ನು ಮಾತ್ರ ಬಳಸುವಂತೆ ಕೇಳಿಕೊಂಡರು. ಈ ತತ್ವವೇ ಖಾದಿ ಉತ್ಪಾದಿಸಿ ಖಾದಿ ಬಟ್ಟೆಗಳನ್ನೇ ತೊಡುವ ಸಂಪ್ರದಾಯ ಜನಪ್ರಿಯವಾಯಿತು. ಭಾರತೀಯ ಮಹಿಳೆಯರಿಗೆ ಪ್ರತಿ ದಿನವೂ ಖಾದಿ ನೇಯುವಂತೆ ಕೇಳಿ ಗಾಂಧೀಜಿಯವರು ಮಹಿಳೆಯರಿಗೂ ಸ್ವಾತಂತ್ರ್ಯ ಚಳುವಳಿಯಲ್ಲಿ ಭಾಗವಹಿಸುವ ಅವಕಾಶ ಮಾಡಿಕೊಟ್ಟರು. ಅಮೃತಸರದಲ್ಲಿ ೧೯೨೦ ರಲ್ಲಿ ನಡೆದ ಜಲಿಯನ್ ವಾಲಾ ಬಾಗ್ ಹತ್ಯಾಕಾಂಡದ ನಂತರ ಗಾಂಧೀಜಿಯವರ ಸ್ವಾತಂತ್ರ್ಯ ಚಳುವಳಿ ಇನ್ನೂ ಹೆಚ್ಚು ವೇಗದಲ್ಲಿ ಸಾಗಲಾರಂಭಿಸಿತು. ಗಾಂಧೀಜಿಯವರ ಜೀವನದ ಪ್ರಸಿದ್ಧ ಕಾರ್ಯಗಳಲ್ಲಿ ಒಂದು ದಂಡಿ ಯಾತ್ರೆ. ಉಪ್ಪಿನ ಉತ್ಪಾದನೆಗೆ ಬ್ರಿಟಿಷ್ ಸರ್ಕಾರಕ್ಕೆ ಕರ ಕೊಡುವ ಬದಲು ಜನರು ತಾವಾಗಿಯೇ ಉಪ್ಪನ್ನು ಉತ್ಪಾದಿಸಲಿಕ್ಕಾಗಿ ಗಾಂಧೀಜಿ ಮಾರ್ಚ್ ೧೨, ೧೯೩೦ ರಂದು ಸಹಸ್ರಾರು ಜನರೊಡನೆ ಸಮುದ್ರತೀರಕ್ಕೆ ನಡೆದು ಉಪ್ಪನ್ನು ಉತ್ಪಾದಿಸಿದರು. ೧೯೩೧ ರಲ್ಲಿ ಇಂಗ್ಲೆಂಡಿಗೆ ಒಮ್ಮೆ ಭೇಟಿಯಿತ್ತರು. ಮೇ ೮, ೧೯೩೩ ರಂದು ಆರಂಭಗೊಂಡು ೨೧ ದಿನಗಳ ಕಾಲ ಬ್ರಿಟಿಷ್ ಆಡಳಿತವನ್ನು ವಿರೋಧಿಸಿ ಉಪವಾಸ ವ್ರತವನ್ನು ನಡೆಸಿದರು. ಮಾರ್ಚ್ ೩, ೧೯೩೯ ರಂದು ಆರಂಭಗೊಂಡು ಇನ್ನೊಂದು ಉಪವಾಸವನ್ನು ನಡೆಸಿದರು. ಗಾಂಧೀಜಿ ೧೯೨೪ರಲ್ಲಿ ಬೆಳಗಾವಿಯಲ್ಲಿ ನಡೆದ ಅಖಿಲ ಭಾರತ ಕಾಂಗ್ರೆಸ್ ಅಧಿವೇಶನದ ಅಧ್ಯಕ್ಷರಾಗಿದ್ದರು. ೧೯೩೯ ರಲ್ಲಿ ಜರ್ಮನಿ ಪೋಲೆಂಡ್ ದೇಶವನ್ನು ಆಕ್ರಮಿಸಿಕೊಂಡಾಗ ಎರಡನೆ ಮಹಾಯುದ್ಧ ಆರಂಭವಾಯಿತು. ಹಿಟ್ಲರನ ತುಳಿತಕ್ಕೆ ಒಳಗಾದ ಜನರಿಗೆ ಸಾಂತ್ವನವನ್ನು ಗಾಂಧೀಜಿ ವ್ಯಕ್ತಪಡಿಸಿದರು. ಆದರೆ ಬ್ರಿಟಿಷರು ಭಾರತೀಯರ ಸ್ವಾತಂತ್ರ್ಯವನ್ನು ಕಸಿದುಕೊಂಡಿರುವಾಗ ಅವರ ಪರವಾಗಿಯೇ ಹೋರಾಡುವುದರಲ್ಲಿ ಗಾಂಧೀಜಿಯವರು ಅರ್ಥ ಕಾಣಲಿಲ್ಲ. ಬ್ರಿಟಿಷರು ಭಾರತಕ್ಕೆ ಸ್ವಾತಂತ್ರ್ಯ ನೀಡುವುದಾದಲ್ಲಿ ಅವರ ಸಹಾಯಕ್ಕೆ ತಾವು ನಿಲ್ಲುವುದಾಗಿ ತಿಳಿಸಿದರು. ಆದರೆ ಇದಕ್ಕೆ ಬ್ರಿಟಿಷರಿಂದ ಉತ್ತಮ ಪ್ರತಿಕ್ರಿಯೆ ಬರಲಿಲ್ಲ. ಇದೇ ಕಾಲದಲ್ಲಿಯೇ ಸ್ವಾತಂತ್ರ್ಯ ಚಳುವಳಿಯು ಇನ್ನೂ ತೀವ್ರಗೊಂಡು “ಭಾರತ ಬಿಟ್ಟು ತೊಲಗಿರಿ” ಚಳುವಳಿ ೧೯೪೨ ರಲ್ಲಿ ಆರಂಭವಾಯಿತು. ಆಗಸ್ಟ್ ೯, ೧೯೪೨ ರಂದು ಬ್ರಿಟಿಷರು ಗಾಂಧೀಜಿಯನ್ನು ಮತ್ತೆ ಬಂಧಿಸಿ ಎರಡು ವರ್ಷಗಳ ಕಾಲ ಬಂಧನದಲ್ಲಿರಿದರು. ಭಾರತದ ಸ್ವಾತಂತ್ರ್ಯ ಸಮಯದಲ್ಲಿ ಭಾರತವನ್ನು ಎರಡು ದೇಶಗಳಾಗಿ ಒಡೆಯಬೇಕೆಂಬ ಪ್ರಸ್ತಾಪ ಬಂದಿತು. ಈ ಪ್ರಸ್ತಾಪಕ್ಕೆ ಗಾಂಧೀಜಿ ವಿರುದ್ಧವಾಗಿದ್ದರೂ ಭಾರತವನ್ನು ಜಾತ್ಯತೀತ ಭಾರತ ಮತ್ತು ಮುಸ್ಲಿಮ್ ದೇಶವಾದ ಪಾಕಿಸ್ತಾನವಾಗಿ ಒಡೆಯಲಾಯಿತು. ಸ್ವಾತಂತ್ರ್ಯ ದಿನದಂದು ಗಾಂಧೀಜಿ ಮಿಕ್ಕೆಲ್ಲರಂತೆ ಸಮಾರಂಭದಲ್ಲಿ ಉಪಸ್ಥಿತರಾಗಲಿಲ್ಲ. ಭಾರತದ ಬೇರ್ಪಡೆಯ ಬಗ್ಗೆ ಶೋಕಾಚರಣೆ ನಡೆಸಿದರು. ಜನವರಿ ೩೦ ರಂದು, ನಾಥೂರಾಮ್ ಗೋಡ್ಸೆ ಎಂಬ ಹಿಂದೂ ತೀವ್ರವಾದಿ, ಪಾಕಿಸ್ತಾನಕ್ಕೆ ೫೫ ಕೋಟಿ ರೂಪಾಯಿಗಳ ಮೊತ್ತವನ್ನು ಭಾರತ ಸಂದಾಯಿಸಬೇಕೆಂದು ಗಾಂಧೀಜಿ ಒತ್ತಾಯಿಸಿದ್ದಕ್ಕಾಗಿ ಅವರನ್ನು ದೂಷಿಸಿ ಅವರನ್ನು ಗುಂಡಿಕ್ಕಿ ಹತ್ಯೆ ಮಾಡಿದನು. ಗಾಂಧೀಜಿಯವರ ಕೊನೆಯ ಮಾತುಗಳು “ಹೇ ರಾಮ್!”. ನಂತರ ನಾಥೂರಾಮ್ ಗೋಡ್ಸೆಗೆ ಮರಣದಂಡನೆ ವಿಧಿಸಲಾಯಿತು. ಗಾಂಧೀಜಿಯವರ ತತ್ವಗಳು ಭಗವದ್ಗೀತೆ ಮತ್ತು ಜೈನ ಧರ್ಮದಿಂದ ರೂಪುಗೊಂಡಂಥವು. ಅವರ ಮುಖ್ಯ ತತ್ವಗಳು ಸತ್ಯ ಮತ್ತು ಅಹಿಂಸೆ. ಅಹಿಂಸೆಯ ತತ್ವ ಭಾರತೀಯ ಧಾರ್ಮಿಕ ವಿಚಾರದಲ್ಲಿ ಅನೇಕ ಶತಮಾನಗಳಿಂದ ಅಸ್ತಿತ್ವದಲ್ಲಿರುವ ತತ್ವ. ತಮ್ಮ ಆತ್ಮಚರಿತ್ರೆಯಾದ ಸತ್ಯದೊಂದಿಗೆ ನನ್ನ ಪ್ರಯೋಗಗಳು ಪುಸ್ತಕದಲ್ಲಿ ಗಾಂಧಿಜಿ ತಮ್ಮ ತತ್ವಗಳನ್ನು ವಿಶದವಾಗಿ ವಿವರಿಸಿದ್ದಾರೆ. ಗಾಂಧೀಜಿಯವರು ಕಟ್ಟಾ ಸಸ್ಯಾಹಾರಿಗಳು. ಲಂಡನ್ ನಲ್ಲಿ ಓದುತ್ತಿದ್ದಾಗ ಅವರು ಸಸ್ಯಾಹಾರದ ಬಗೆಗೆ ಪುಸ್ತಕಗಳನ್ನೂ ಬರೆದಿದ್ದರು. ಹಿಂದೂ ಮತ್ತು ಜೈನ ಸಮಾಜಗಳಲ್ಲಿ ಸಸ್ಯಾಹಾರದ ತತ್ವ ಶತಮಾನಗಳಿಂದಲೂ ಆಳವಾಗಿ ಬೇರೂರಿರುವುದು. ವಿವಿಧ ರೀತಿಯ ಆಹಾರ ಕ್ರಮಗಳೊಂದಿಗೆ ಪ್ರಯೋಗಗಳನ್ನು ಕೈಗೊಂಡ ಗಾಂಧೀಜಿಯವರ ನಂಬಿಕೆ ನಮ್ಮ ಆಹಾರ ಕ್ರಮ ನಮ್ಮ ಮೂಲಭೂತ ಅಗತ್ಯಗಳನ್ನು ಪೂರೈಸಬೇಕೇ ಹೊರತು ಅದಕ್ಕಿಂತ ಹೆಚ್ಚು ಆಹಾರವನ್ನು ಸೇವಿಸುವ ಅಗತ್ಯವಿಲ್ಲವೆಂಬುದು. ಕಾಲಕಾಲಕ್ಕೆ ಉಪವಾಸ ವ್ರತವನ್ನೂ ಕೈಗೊಳ್ಳುತ್ತಿದ್ದ ಗಾಂಧೀಜಿಯವರು ಉಪವಾಸ ಸತ್ಯಾಗ್ರಹವನ್ನು ಸ್ವಾತಂತ್ರ್ಯ ಚಳುವಳಿಯಲ್ಲೂ ಉಪಯೋಗಿಸಿದವರು. ೩೬ ನೆಯ ವಯಸ್ಸಿನಲ್ಲಿ ಗಾಂಧೀಜಿಯವರು ಬ್ರಹ್ಮಚರ್ಯ ವ್ರತವನ್ನು ಸ್ವೀಕರಿಸಿದರು. ಹಾಗೆಯೇ ವಾರದಲ್ಲಿ ಒಂದು ದಿನ ಮೌನವ್ರತವನ್ನು ಆಚರಿಸುತ್ತಿದ್ದರು. ಇದರಿಂದ ಆತ್ಮಶಾಂತಿ ಸಿಕ್ಕುತ್ತದೆಂಬುದು ಗಾಂಧೀಜಿಯವರ ನಂಬಿಕೆ. ದಕ್ಷಿಣ ಆಫ್ರಿಕಾದಿಂದ ಭಾರತಕ್ಕೆ ಹಿಂದಿರುಗಿದ ಮೇಲೆ ಶ್ರೀಮಂತ ಉಡುಪುಗಳನ್ನು ಗಾಂಧೀಜಿ ಎಂದಿಗೂ ಧರಿಸಲಿಲ್ಲ. ಭಾರತದ ಅತ್ಯಂತ ಬಡ ಮನುಷ್ಯ ಒಪ್ಪಿಕೊಳ್ಳಬಹುದಾದ ಉಡುಪುಗಳನ್ನು ಮಾತ್ರ ಅವರು ಧರಿಸುತ್ತಿದ್ದರು. ಮನೆಯಲ್ಲಿಯೇ ನೇಯ್ದ ಖಾದಿ ಬಟ್ಟೆಗಳನ್ನು ಧರಿಸುವುದನ್ನು ಗಾಂಧೀಜಿ ಪ್ರೋತ್ಸಾಹಿಸುತ್ತಿದ್ದರು. ಗಾಂಧೀಜಿಯವರ ಚರಕ ನಂತರ ಭಾರತ ರಾಷ್ಟ್ರೀಯ ಕಾಂಗ್ರೆಸ್ ನ ಬಾವುಟದಲ್ಲಿಯೂ ಸೇರಿತು.ಸತ್ಯದೊಂದಿಗೆ ನನ್ನ ಪ್ರಯೋಗಗಳು ಮಹಾತ್ಮ ಗಾಂಧಿಯವರ ಆತ್ಮ ಚರಿತ್ರೆ. ಶಾಂತಿಗಾಗಿ ಕೊಡಲ್ಪಡುವ ನೊಬೆಲ್ ಬಹುಮಾನ ಗಾಂಧೀಜಿಯವರಿಗೆ ಎಂದಿಗೂ ಲಭಿಸಲಿಲ್ಲ. ೧೯೩೭ ಮತ್ತು ೧೯೪೮ ರ ನಡುವೆ ಗಾಂಧೀಜಿಯವರು ಈ ಪ್ರಶಸ್ತಿಗಾಗಿ ಐದು ಬಾರಿ ಪರಿಗಣಿತರಾಗಿದ್ದರು. ೧೯೮೯ ರಲ್ಲಿ ದಲಾಯ್ ಲಾಮಾ ಅವರಿಗೆ ನೊಬೆಲ್ ಬಹುಮಾನವನ್ನು ಕೊಟ್ಟಾಗ ನೊಬೆಲ್ ಪ್ರಶಸ್ತಿ ಸಮಿತಿಯವರು ಗಾಂಧೀಜಿಯವರಿಗೆ ಈ ಪ್ರಶಸ್ತಿ ಕೊಡದ್ದಕ್ಕಾಗಿ ಪಶ್ಚಾತ್ತಾಪವನ್ನು ವ್ಯಕ್ತಪಡಿಸಿದ್ದಲ್ಲದೆ ದಲಾಯ್ ಲಾಮಾ ಅವರಿಗೆ ಕೊಟ್ಟ ಪ್ರಶಸ್ತಿ ಭಾಗಶಃ ಗಾಂಧೀಜಿಯವರ ಸ್ಮರಣೆಗಾಗಿ ಎಂದು ಘೋಷಿಸಿದರು. ಜವಾಹರಲಾಲ್ ನೆಹರು (ನವೆಂಬರ್ ೧೪, ೧೮೮೯ – ಮೇ ೨೭, ೧೯೬೪) – ಭಾರತದ ಮೊದಲ ಪ್ರಧಾನ ಮಂತ್ರಿ, ಸ್ವಾತಂತ್ರ್ಯ ಹೋರಾಟಗಾರರು. ಆಗಸ್ಟ್ ೧೫, ೧೯೪೭ ರಿಂದ ಪ್ರಾರಂಭಿಸಿ ಇವರು ಮರಣಕಾಲದವರೆಗೂ ಭಾರತದ ಪ್ರಧಾನಿಯಾಗಿದ್ದರು. ಪ್ರಮುಖ ಕಾಂಗ್ರೆಸ್ ನಾಯಕರಾದ ಮೋತಿಲಾಲ್ ನೆಹರು ಅವರ ಮಗ, ನೆಹರೂ ಇಂಗ್ಲೆಂಡ್‌ನ ಹ್ಯಾರ್ರೊ ಸ್ಕೂಲ್ ಹಾಗು ಕೇಂಬ್ರಿಡ್ಜ್ ವಿಶ್ವವಿದ್ಯಾಲಯದಿಂದ ಓದು ಮುಗಿಸಿ, ತಂದೆಯೊಂದಿಗೆ ರಾಜಕೀಯದಲ್ಲಿ ಸಕ್ರಿಯರಾದರು. ಇಂಗ್ಲೆಂಡ್‌ನಲ್ಲಿದ್ದಾಗ ನೆಹರು ಅವರು ಫೇಬಿಯನ್ ಸಾಮಾಜಿಕ ವಿಧಾನಗಳನ್ನು ಬಹುವಾಗಿ ಮೆಚ್ಚಿದ್ದರು. ೧೯೧೬ರ ವಸಂತ ಪಂಚಮಿಯ ದಿನದಂದು ನೆಹರು ಅವರು ಕಮಲಾ ಕೌಲ್‌ರವರನ್ನು ಮದುವೆಯಾದರು. ೧೯೧೯ ರಲ್ಲಿ ಮಗಳು ಇಂದಿರಾ ಪ್ರಿಯದರ್ಶಿನಿ ಜನಿಸಿದಳು. ರಾಜಕೀಯದಲ್ಲಿ, ಮಹಾತ್ಮ ಗಾಂಧಿಯವರ ಶಿಷ್ಯನಾದ ಇವರು, ಮೊದಲ ಬಾರಿಗೆ ೧೯೨೯ ರಲ್ಲಿ ಭಾರತ ರಾಷ್ಟ್ರೀಯ ಕಾಂಗ್ರೆಸ್‌ನ ಅಧ್ಯಕ್ಷರಾಗಿ ಮೇಲೇರಿದರು. ಈ ದಿನಗಳನ್ನು ಇವರು ಬಹುವಾಗಿ ಕಾರಾವಸದಲ್ಲಿ ಪುಸ್ತಕಗಳು, ಪತ್ರಗಳನ್ನು ಬರೆಯುತ್ತಾ ಕಳೆದರು. ‘ಭಾರತ ಬಿಟ್ಟು ತೊಲಗಿ’ (Quit India Movement) ಪರ್ಯಾಯ ೧೯೪೨ರಲ್ಲಿ ೩೨ ತಿಂಗಳಿಗೆ ಕಾರಾಗೃಹವಾಸ ಅನುಭವಿಸಿದ ಇವರು, ಭಾರತದ ಮೊದಲ ಸರಕಾರವನ್ನು ೧೯೪೬ರಲ್ಲಿ ರಚಿಸಿದರು. ನೆಹರೂರವರು ೧೮ ವರ್ಷಗಳ ಕಾಲ ಭಾರತದ ಪ್ರಧಾನಿಯಾಗದ್ದರು. ಇವರು ೧೯೬೪ರ ಮೇ ೨೭ರಂದು ನಿಧನರಾದರು. ಪಂಡಿತ ಜವಹರಲಾಲ್ ನೆಹರೂರವರು ಆಗಸ್ಟ್ ೧೪ ರ ರಾತ್ರಿ ಸಂಸತ್ತನ್ನುದ್ದೇಶಿಸಿ ಮಾಡಿದ ಎ ಟ್ರಿಸ್ಟ್ ವಿಥ್ ಡೆಸ್ಟಿನಿ ಭಾಷಣದ ಕನ್ನದ ಅನುವಾದ. ಸಂಸ್ಕೃತ ವಿದ್ವಾಂಸರ ಪೀಳಿಗೆಯಲ್ಲಿ ಹುಟ್ಟಿದ ಸಾವರ್ಕರರಿಗೆ ಇತಿಹಾಸ, ರಾಜನೀತಿ, ಸಾಹಿತ್ಯ, ಬಾರತೀಯ ಸಂಸ್ಕೃತಿಗಳಲ್ಲಿ ಅತ್ಯಂತ ಆಸಕ್ತಿ. ಅವರು ಬರೆದ ಪುಸ್ತಕ “ಭಾರತದ ಪ್ರಥಮ ಸ್ವಾತಂತ್ರ್ಯ ಸಂಗ್ರಾಮ – 1857” ಅಸಂಖ್ಯಾತ ಸ್ವಾತಂತ್ರ್ಯ ಯೋಧರಿಗೆ ಸ್ಪೂರ್ತಿದಾಯಕವಾಗಿತ್ತು. ದಾಮೋದರಪಂತ ಮತ್ತು ರಾಧಾಬಾಯಿಯ ನಾಲ್ಕು ಮಕ್ಕಳಲ್ಲಿ ಒಬ್ಬರಾದ ವಿನಾಯಕ ಹುಟ್ಟಿದ್ದು ಮಹಾರಾಷ್ಟ್ರದ ನಾಸಿಕ ಪಟ್ಟಣದ ಹತ್ತಿರದ ಭಾಗೂರು ಎಂಬಲ್ಲಿ. ನಾಸಿಕದ ಶಿವಾಜಿ ಶಾಲೆಯಲ್ಲಿ ಪ್ರಾಥಮಿಕ ಶಿಕ್ಷಣವಾಯಿತು. ಒಂಭತ್ತನೆಯ ವಯಸ್ಸಿನಲ್ಲಿ ತಾಯಿಯನ್ನು ಕಳೆದುಕೊಂಡು, ತಂದೆಯ ಪೋಷಣೆಯಲ್ಲಿ ಬೆಳೆದ ವಿನಾಯಕ ಬ್ರಿಟಿಷರ ವಿರುಧ್ಧದ ಸ್ವಾತಂತ್ರ್ಯ ಹೋರಾಟದತ್ತ ಆಕರ್ಷಿತನಾದ. 1899ರಲ್ಲಿ ದೇಶವನ್ನು ಮುತ್ತಿದ ಪ್ಲೇಗ್ ಪಿಡುಗಿಗೆ ಅವನ ತಂದೆ ತುತ್ತಾದರು. 1901ರಲ್ಲಿ ಯಮುನಾಬಾಯಿಯೊಂದಿಗೆ ಮದುವೆಯಾಯಿತು. 1902ರಲ್ಲಿ ಪುಣೆಯ ಫರ್ಗ್ಯೂಸನ್ ಕಾಲೇಜನ್ನು ಹೆಚ್ಚಿನ ವಿದ್ಯಾಭ್ಯಾಸಕ್ಕಾಗಿ ಸೇರಿದರು. ಜೂನ್ 1906ರಲ್ಲಿ ಶಿಷ್ಯವೃತ್ತಿ ದೊರೆತದ್ದರಿಂದ , ಕಾನೂನು ಶಾಸ್ತ್ರ ವ್ಯಾಸಂಗಕ್ಕಾಗಿ ಲಂಡನ್ ತೆರಳಿದರು. ಸಾವರ್ಕರ್ ವಿದ್ಯಾರ್ಥಿಯಾಗಿದ್ದಾಗ ಸ್ವದೇಶಿ ಚಳುವಳಿಯಲ್ಲಿ ಭಾಗವಹಿಸಿದ್ದರು. ನಂತರ ಅವರು ತಿಲಕರ ಸ್ವರಾಜ್ಯ ಪಕ್ಷದ ಸದಸ್ಯರಾದರು. ಲಂಡನ್ನಿನಲ್ಲಿದ್ದಾಗ “ಸ್ವತಂತ್ರ ಭಾರತ ಸಮಾಜ” (Free India Society)ವನ್ನು ಸ್ಥಾಪಿಸಿದರು. ಈ ಸಂಸ್ಥೆ ಭಾರತೀಯ ಪಂಚಾಂಗದ ಹಬ್ಬಗಳೇ ಮೊದಲಾದ ಮುಖ್ಯ ತಿಥಿಗಳನ್ನು , ಸ್ವಾತಂತ್ರ್ಯ ಸಂಗ್ರಾಮದ ಮೈಲಿಗಲ್ಲುಗಳನ್ನೂ ಆಚರಿಸುತ್ತಿತ್ತು. ಭಾರತದ ಸ್ವಾತಂತ್ರ್ಯದ ಬಗ್ಯೆ ಮಾತುಕತೆಗಳಿಗಾಗಿ ಮುಡಿಪಾಗಿದ್ದ ಈ ಸಂಸ್ಥೆಯ ಮೇಲೆ ಬ್ರಿಟಿಷ್ ಸತ್ತೆಯ ಕೆಂಗಣ್ಣು ಬೀಳಲು ತಡವಾಗಲಿಲ್ಲ. “ಬ್ರಿಟಿಷ್ ಅಧಿಕಾರಿಗಳ ಬಗೆಗೇ ಆಗಲಿ, ಅವರ ಕಾನೂನುಗಳ ಬಗೆಗೇ ಆಗಲಿ, ಗೋಣಗುವುದರಲ್ಲಿ ಅರ್ಥವಿಲ್ಲ. ಅದಕ್ಕೆ ಕೊನೆಯೂ ಇಲ್ಲ. ನಮ್ಮ ಚಳುವಳಿ ಯಾವುದೇ ನಿರ್ದಿಷ್ಟ ಕಾನೂನನ್ನು ವಿರೋಧಿಸುವುದಕ್ಕಷ್ಟೇ ಸೀಮಿತವಾಗದೆ, ಆ ಕಾನೂನುಗಳನ್ನು ರಚಿಸಿ, ಜಾರಿಗೆ ತರುವ ಹಕ್ಕಿಗಾಗಿ ಇರಬೇಕು. ಅರ್ಥಾತ್, ಸಂಪೂರ್ಣ ರಾಜಕೀಯ ಸ್ವಾತಂತ್ರ್ಯವೇ ನಮ್ಮ ಗುರಿಯಾಗಬೇಕು” ಎಂದು ಸಾವರ್ಕರರು ಹೇಳಿದ್ದರೆಂದು ನಂಬಲಾಗಿದೆ. 1908ರಲ್ಲಿ “ಭಾರತದ ಪ್ರಥಮ ಸ್ವಾತಂತ್ರ್ಯ ಸಂಗ್ರಾಮ- 1857 ” ಬರೆದಾಗ, ಬ್ರಿಟಿಷ್ ಸರಕಾರವು ತಕ್ಷಣವೇ ಭಾರತ ಮತ್ತು ಬ್ರಿಟನ್ನುಗಳಲ್ಲಿ ಅದರ ಪ್ರಕಾಶನವನ್ನು ನಿರ್ಬಂಧಿಸಿತು. ಮುಂದೆ ಭಿಕಾಜಿ ಕಾಮಾ ಅದನ್ನು ಹಾಲೆಂಡಿನಲ್ಲಿ ಪ್ರಕಾಶಿಸಿದರು. ಅಲ್ಲಿಂದ ಅದನ್ನು ಗುಪ್ತವಾಗಿ ಭಾರತಕ್ಕೆ ಸಾಗಿಸಿ ಬ್ರಿಷರ ವಿರುಧ್ಧ ಸಕ್ರಿಯರಾಗಿದ್ದ ಕ್ರಾಂತಿಕಾರಿಗಳಿಗೆ ಹಂಚಲಾಯಿತು. 1909ರಲ್ಲಿ , ಸಾವರ್ಕರರ ನಿಕಟ ಅನುಯಾಯಿ, ಮದನಲಾಲ್ ಧಿಂಗ್ರಾ, ಆಗಿನ ವೈಸರಾಯ್ ಲಾರ್ಡ್ ಕರ್ಜನ್ನನ ವಧೆಯ ಪ್ರಯತ್ನ ವಿಫಲವಾದ ನಂತರ, ಸರ್ ವಾಯ್ಲೀ ಎಂಬ ಅಧಿಕಾರಿಯನ್ನು ಗುಂಡಿಕ್ಕಿ ಕೊಂದ. ಇದರ ಫಲವಾಗಿ ಉಂಟಾದ ರಾಜಕೀಯ ಗೊಂದಲದಲ್ಲಿ, ಸಾವರ್ಕರ್ ಈ ಘಟನೆಯನ್ನು ಖಂಡಿಸಲು ನಿರಾಕರಿಸಿ , ಎದ್ದು ಕಾಣಿಸಿಕೊಂಡರು. ನಾಸಿಕ್ ಪಟ್ಟಣದ ಕಲೆಕ್ಟರ್ ಎ.ಎಂ.ಟಿ. ಜಾಕ್ಸನ್ ಯುವಕನೊಬ್ಬನ ಗುಂಡಿಗೆ ಬಲಿಯಾದಾಗ, ಸಾವರ್ಕರ್ ಕೊನೆಗೂ ಬ್ರಿಟಿಷ್ ಅಧಿಕಾರಿಗಳ ಬಲೆಯಲ್ಲಿ ಸಿಕ್ಕಿದರು. ಇಂಡಿಯಾ ಹೌಸ್ ನೊಂದಿಗೆ ಸಾವರ್ಕರರ ಸಂಪರ್ಕವನ್ನೇ ನೆಪಮಾಡಿ ಅವರನ್ನು ಈ ಕೊಲೆಯಲ್ಲಿ ಅಪರಾಧಿ ಎಂದು ನಿರ್ಣಯಿಸಲಾಯಿತು. 13ನೇ ಮಾರ್ಚ್ 1910ರಂದು ಅವರ ವಿರುದ್ಧ ಬಂಧನದ ವಾರಂಟ್ ಹೊರಡಿಸಿ, ನಂತರ ಪ್ಯಾರಿಸಿನಲ್ಲಿ ಅವರನ್ನು ಬಂಧಿಸಲಾಯಿತು. ಮಾರ್ಸೇಲ್ಸ್ ನಿಂದ ಪರಾರಿಯಾಗುವ ಅವರ ಧೀರ ಪ್ರಯತ್ನ ವಿಫಲವಾಯಿತು. ಅವರನ್ನು ಹಿಡಿದು ಮುಂಬಯಿಗೆ “ ಎಸ್.ಎಸ್.ಮೊರಿಯಾ” ಹಡಗಿನಲ್ಲಿ ತಂದು, ಯೆರವಡಾ ಜೈಲಿನಲ್ಲಿ ಬಂಧಿಸಲಾಯಿತು. ಅವರ ವಿರುದ್ಧದ ಮೊಕದ್ದಮೆಯಲ್ಲಿ , ಆಗಿನ್ನೂ 27ರ ತರುಣನಾಗಿದ್ದ ಅವರಿಗೆ, ಕುಪ್ರಸಿದ್ಧ ಅಂಡಮಾನಿನ ಜೈಲಿನಲ್ಲಿ 50 ವರ್ಷಗಳ ಕಾರಾಗೃಹ ಶಿಕ್ಷೆ ವಿಧಿಸಲಾಯಿತು. ನಾಲ್ಕು ಜುಲೈ, 1911ರಂದು, ಅವರನ್ನು ಅಂಡಮಾನಿಗೆ ಸಾಗಿಸಲಾಯಿತು. ಸಾವರ್ಕರ್ 1911ರಲ್ಲಿ , ಮತ್ತೆ 1913ರಲ್ಲಿ, ಸರ್ ರೆಜಿನಾಲ್ಡ್ ಕ್ರಾಡ್ಡಾಕ್ ನ ಭೆಟಿಯ ಸಮಯದಲ್ಲಿ ಕ್ಷಮೆಗಾಗಿ ಬ್ರಿಟಿಷ್ ಸರ್ಕಾರಕ್ಕೆ ಅರ್ಜಿ ಸಲ್ಲಿಸಿದರು. ಆಗಿನ ಬ್ರಿಟಿಷ್ ಆಡಳಿತ ರಾಜಕೀಯ ಖೈದಿಗಳಿಗೆ ಸೆರೆಮನೆಯಲ್ಲಿ ನೀಡುತ್ತಿದ್ದ ಚಿತ್ರಹಿಂಸೆ ಹಾಗೂ ಸಾವರ್ಕರರ ಕೆಡುತ್ತಿದ್ದ ಆರೋಗ್ಯ ಈ ಹಿನ್ನೆಲೆಯಲ್ಲಿ ಸಾವರ್ಕರರ ಕ್ಷಮಾ ಅರ್ಜಿಯನ್ನು ನೋಡಬೇಕು ಎಂದು ಅವರ ಸಮರ್ಥಕರು ಅಭಿಪ್ರಾಯಪಡುತ್ತಾರೆ. ಮತ್ತೆ ಭಾರತದ ಭೂಮಿಗೆ ಹಿಂದಿರುಗಿ , ಬ್ರಿಟಿಷರ ವಿರುದ್ಧ ಹೋರಾಟಕ್ಕೆ ತೊಡಗುವ ಚಾಣಾಕ್ಷ ಉದ್ದೇಶದಿಂದ ಅವರು ಕ್ಷಮೆ ಕೇಳಿರಬಹುದು ಎಂಬ ಅಭಿಪ್ರಾಯವೂ ಇದೆ. ಇದಕ್ಕೆ ವಿರುದ್ಧವಾಗಿ, ಈ ಕ್ರಿಯೆ ಬ್ರಿಟಿಷರ ವಿರುದ್ಧ ಸಾವರ್ಕರರ ಶರಣಾಗತಿ ಎಂದು ಅವರ ಟೀಕಾಕಾರರು ಭಾವಿಸುತ್ತಾರೆ. ಅದು ಹೇಗೇ ಇದ್ದರೂ, ಸಾವರ್ಕರರ ಈ ಕ್ರಮ ಮುಂದೆ ಬಹಳಷ್ಟು ಕಾಲದವರೆಗೆ ವಿವಾದವನ್ನು ಸೃಷ್ಟಿಸಿದ ವಿಷಯಗಳಲ್ಲಿ ಮೊದಲನೆಯದಾಗಿತ್ತು. 1920ರಲ್ಲಿ ವಿಠ್ಠಲಭಾಯಿ ಪಠೇಲ್, ಮಹಾತ್ಮ ಗಾಂಧಿ, ಬಾಲ ಗಂಗಾಧರ ತಿಲಕ ಮುಂತಾದ ಹಿರಿಯ ಧುರೀಣರು ಕೇಂದ್ರೀಯ ಸಂಸತ್ತಿನಲ್ಲಿ ಸಾವರ್ಕರ್ ಹಾಗೂ ಅವರ ಬಿಡುಗಡೆಗಾಗಿ ಒತ್ತಾಯಿಸಿದರು. ಮೇ 12, 1921ರಂದು ಸಾವರ್ಕರರನ್ನು ರತ್ನಾಗಿರಿ ಜೈಲಿಗೆ, ಮತ್ತೆ ಅಲ್ಲಿಂದ ಯೆರವಡಾ ಜೈಲಿಗೆ, ಸಾಗಿಸಲಾಯಿತು. ಅವರು “ಹಿಂದುತ್ವ” ಕೃತಿ ಬರೆದದ್ದು ರತ್ನಾಗಿರಿಯ ಜೈಲಿನಲ್ಲಿದ್ದಾಗ. ಅವರ ಚಟುವಟಿಗಳಿಗೆ ಹಾಗೂ ತಿರುಗಾಟಕ್ಕೆ ತೀವ್ರ ನಿರ್ಬಂಧಗಳನ್ನು ಹಾಕಿ, ಜನವರಿ 6,1924ರಂದು ಅವರನ್ನು ಜೈಲಿನಿಂದ ಬಿಡುಗಡೆ ಮಾಡಲಾಯಿತು. ಸಾವರ್ಕರ್ ಸ್ವತಃ ನಾಸ್ತಿಕರಾಗಿದ್ದರೂ ಕೂಡಾ, ಇಷ್ಟವಿಲ್ಲದಿದ್ದರೂ ಹಿಂದೂ ಮಹಾಸಭೆಯ ಅಧ್ಯಕ್ಷ ಪದವನ್ನು ಒಪ್ಪಿಕೊಳ್ಳಬೇಕಾಯಿತು. ಅವರು ಆ ಪದವಿಯಲ್ಲಿ ಇದ್ದ ಏಳು ವರ್ಷಗಳಲ್ಲಿ , ಮಹಾಸಭೆಯನ್ನು ಸ್ವತಂತ್ರ ರಾಜಕೀಯ ಪಕ್ಷವನ್ನಾಗಿ ಬೆಳೆಸಲು ಅಗಾಧ ಕೊಡುಗೆ ನೀಡಿದರು. ಬ್ರಿಟಿಷರು ಜರ್ಮನಿಯ ಮೇಲೆ ಯುದ್ಧ ಹೂಡಿ ಅದರಲ್ಲಿ ಭಾರತವನ್ನೂ ಎಳೆದುಕೊಂಡಾಗ, ಸಾವರ್ಕರ್ “ ಮಾನವ ಸ್ವಾತಂತ್ರ್ಯದ ಹಕ್ಕನ್ನು ಕಾಪಾಡುವುದಾಗಿ ಹೇಳಿಕೊಳ್ಳುವ ಬ್ರಿಟಿಷರ ನೀತಿ ಅರ್ಥಹೀನ” ಎಂದರು. ಆದಾಗ್ಯೂ, ಬ್ರಿಟಿಷರಿಗೆ ಜರ್ಮನಿ ಮತ್ತು ಜಪಾನಿನ ವಿರುದ್ಧದ ಯುದ್ಧದಲ್ಲಿ ಸಃಅಯ ಮಾಡುವಂತೆ ಅವರು ಹಿಂದೂ ಸಮಾಜಕ್ಕೆ ಕರೆ ಕೊಟ್ಟರು. ಅವರ ಸಮರ್ಥಕರು ಈ ಕ್ರಮವನ್ನು ಹಿಂದೂ ಸಮಾಜಕ್ಕೆ ಮಿಲಿಟರಿ ತರಪೇತಿ ದೊರಕಿಸಿಕಂಡು ಮುಂದೆ ಬ್ರಿಟಿಷರ ಮೇಲೆ ಬೀಳುವ ಉದ್ದೇಶದಿಂದ ತೆಗೆದುಕೊಂಡದ್ದಾಗಿತ್ತು ಎಂದು ಅರ್ಥೈಸಿದರೂ, ಅವರ ವಿರೋಧಿಗಳು ಇದನ್ನು ಬ್ರಿಟಿಷ್ ಹಿತಾಸಕ್ತಿಗಳಿಗೆ ಹೊಂದಿಕೊಳ್ಳುವ ಸಾವರ್ಕರರ ಮತ್ತೊಂದು ಉದಾಹರಣೆಯಾಗಿ ಕಂಡರು. ಸಾವರ್ಕರರ ಅಧ್ಯಕ್ಷತೆಯಲ್ಲಿ ಮಹಾಸಭಾ, 1942 ರ ಭಾರತ ಬಿಟ್ಟು ತೊಲಗಿ ಅಂದೋಲನವನ್ನು ಬೆಂಬಲಿಸಲಿಲ್ಲ. ಕಮ್ಯೂನಿಸ್ಟ್ ಪಾರ್ಟಿ ಹಾಗೂ ಮುಸ್ಲಿಮ್ ಲೀಗ್ ಕೂಡಾ ಈ ಅಂದೋಲನವನ್ನು ಸಮರ್ಥಿಸಲಿಲ್ಲ. ಸ್ವಾತಂತ್ರ್ಯೋತ್ತರ ಭಾರತವು, ಸುಧೃಢವಾಗಿಯೂ, ಒಗ್ಗಟ್ಟಿನಿಂದಲೂ ಹಾಗೂ ಸ್ವಾವಲಂಬಿಯೂ ಆಗಿರಬೇಕೆಂಬ ಅಪೇಕ್ಷೆ ಅವರಿಗಿತ್ತು. ಸೆರೆಮನೆಯಲ್ಲಿದ್ದಾಗ ಅವರು ಅನೇಕ ಪುಸ್ತಕಗಳನ್ನು ಬರೆದರು.ರತ್ನಗಿರಿ ಜೈಲಿನಲ್ಲಿದ್ದಾಗ ಬರೆದ ಪುಸ್ತಕಗಳಲ್ಲೊಂದು “ಹಿಂದುತ್ವ”. ಭಾರತ ರಾಷ್ಟ್ರ ಹಾಗೂ ಹಿಂದೂ ಧರ್ಮ ಎಂಬ ಪರಿಕಲ್ಪನೆಗಳನ್ನು ಹಿಂದೂ ರಾಷ್ಟ್ರೀಯತಾವಾದದ ದೃಷ್ಟಿಕೋನದಿಂದ ನೋಡಿದ ಈ ಪುಸ್ತಕ ಅತ್ಯಂತ ಪ್ರಭಾವಿಯಾಗಿತ್ತು.. ಸಾವರ್ಕರ್ ಸ್ವತಃ ನಿರೀಶ್ವರವಾದಿಯಾಗಿದ್ದು, ಭಾರತದ ಭೂಖಂಡದಲ್ಲಿ ಬೇರು ಬಿಟ್ಟು, ಇಲ್ಲಿನ ಜೀವನದ ಪ್ರತಿಯೊಂದು ಅಂಗದಲ್ಲೂ ಹಾಸುಹೊಕ್ಕಾಗಿರುವ , ವಿಶೇಷ ಜೀವನಧರ್ಮ ಎಂದು ಹಿಂದುತ್ವದ ಪರಿಕಲ್ಪನೆಯನ್ನು ಅರ್ಥೈಸಿದ್ದಾರೆಂಬುದನ್ನು ಗಮನಿಸಬೇಕು. ಅವರ ಇತರ ಕೃತಿಗಳೆಂದರೆ “ಹಿಂದೂ ಪದಪಾದಶಾಹಿ” ಮತ್ತು “ನನ್ನ ಅಜೀವ ಸಾಗಾಟ” (My Transportation for Life). ಆಗಲೇ ಭಾರತದಲ್ಲಿ ಧಾರ್ಮಿಕ ಆಧಾರದ ಮೇಲೆ ಬಿರುಕುಗಳು ಗೋಚರವಾಗತೊಡಗಿತ್ತು. “ಮಾಪಿಳ್ಳೆಗಳ ಬಂದ್” (Muslims’ Strike) ಎಂಬ ಪುಸ್ತಕದಲ್ಲಿ ಕೇರಳದಲ್ಲಿ ಹಿಂದೂಗಳ ಮೇಲೆ ಅವರು ಕಂಡ ಬ್ರಿಟಿಷರ ಹಾಗೂ ಮುಸ್ಲಿಮರ ದೌರ್ಜನ್ಯವನ್ನು ಮತ್ತು “ಗಾಂಧೀ ಗೊಂದಲ” (Gandhi’s Nonsense), ಎಂಬ ಪುಸ್ತಕದಲ್ಲಿ ಗಾಂಧಿಯವರ ರಾಜಕೀಯ ಧೋರಣೆಗಳ ಬಗ್ಯೆ ಟೀಕೆಯನ್ನೂ ಅವರು ಮಾಡಿದರು. ಈಗಾಗಲೇ ಸಾವರ್ಕರರು ಭಾರತದ ಭವಿಷ್ಯದ ಬಗ್ಯೆ ಗಾಂಧಿಯವರ ಯೋಜನೆಗಳ ಬದ್ಧ ಟೀಕಾಕಾರರಾಗಿ ಹೋಗಿದ್ದರು. ಅವರ ಬೆಂಬಲಿಗರಷ್ಟೇ ಅಲ್ಲ, ಅವರ ಕೆಲವರು ಟೀಕಾಕಾರರು ಕೂಡಾ, ಮರಾಠಿ ಸಾಹಿತ್ಯದ ಅತ್ಯಂತ ಹೃದಯಸ್ಪರ್ಶೀ ಹಾಗೂ ಸ್ಪೂರ್ತಿದಾಯಕ ಕೃತಿಗಳಲ್ಲಿ ಪರಿಗಣಿಸುವ “ಸಾಗರಾ…. ಪ್ರಾಣ ತಳಮಳಲಾ..” ಮತ್ತು “ ಜಯೋಸ್ತುತೆ” (ಸ್ವಾತಂತ್ರ್ಯದ ಸ್ತುತಿ) ಎಂಬ ಮರಾಠೀ ಗೀತೆಗಳನ್ನು ಅವರು ಬರೆದರು. ಇವು ಜನಪ್ರಿಯವಾಗಿದ್ದು, ಇಂದಿಗೂ ಮಹಾರಾಷ್ಟ್ರದಲ್ಲಿ ಕೇಳಸಿಗುತ್ತವೆ. ಅಂಡಮಾನಿನ ಜೈಲಿನಲ್ಲಿದ್ದ ದೀರ್ಘಕಾಲದಲ್ಲಿ, ಅವರಿಗೆ ಪೆನ್ ಹಾಗೂ ಕಾಗದವನ್ನು ನಿಷೇಧಿಸಲಾಗಿತ್ತು. ಸಾವರ್ಕರ್ ತಮ್ಮ ಗೀತೆಗಳನ್ನು ಜೈಲಿನ ಗೋಡೆಗಳ ಮೇಲೆ ಮುಳ್ಳಿನಿಂದ, ಕಲ್ಲುತುಂಡುಗಳಿಂದ ಕೊರೆದರು. ಬಾಕಿ ಸೆರೆಯಾಳುಗಳು ಬಿಡುಗಡೆಯಾಗಿ ಭಾರತಕ್ಕೆ ಬರುವಾಗಿ ತಮ್ಮೊಂದಿಗೆ ತರುವವರೆಗೂ, ಹತ್ತು ಸಾವಿರಕ್ಕೂ ಹೆಚ್ಚಿನ ಪಂಕ್ತಿಗಳನ್ನು ವರ್ಷಾವಧಿ ನೆನಪಿಟ್ಟುಕೊಂಡಿದ್ದರು. ಹಿಂದೂ ಮಹಾಸಭೆಯ ಮೂಲಕ , ಸಾವರ್ಕರ್ ಅಲ್ಪಸಂಖ್ಯಾತರ ಹಿತಾಸಕ್ತಿಗಳಿಗಾಗಿ ಬಹಳ ಕಷ್ಟಪಟ್ಟರು ಎಂದು, ಇದು ವಿವಾದಾತ್ಮಕವಾಗಿದ್ದರೂ, ಹೇಳಲಾಗಿದೆ. ಹಿಂದೂ ಹಬ್ಬಗಳ ಆಚರಣೆಯ ಸಂಧರ್ಭಗಳಲ್ಲಿ, ಸೌಹಾರ್ದತೆಯನ್ನು ಬೆಳೆಸುವ ಉದ್ದೇಶದಿಂದ ಸಾವರ್ಕರ್ ಮುಸ್ಲಿಮರ ಹಾಗೂ ಕ್ರೈಸ್ತರ ಮನೆಗಳಿಗೆ ಭೇಟಿ ನೀಡುತ್ತಿದ್ದರು ಎಂದೂ ,ಅಂತರ್ಜಾತೀಯ ವಿವಾಹಗಳನ್ನು ಪ್ರೋತ್ಸಾಹಿಸಿ , ಅಸ್ಪೃಶ್ಯತೆಯನ್ನು ಹೋಗಲಾಡಿಸಲು ಬಿ.ಆರ್.ಅಂಬೇಡ್ಕರರಿಗೆ ಸಹಾಯ ಮಾಡಿದರು ಎಂದೂ ಹೇಳಲಾಗಿದೆ. (ಅಸ್ಪೃಶ್ಯರಿಗೆ ದೇವಾಲಯ ಪ್ರವೇಶ ನಿಷಿದ್ಧವಾದ ಆ ಕಾಲದಲ್ಲಿ , ಅದರ ವಿರುದ್ಧವಾಗಿ ಮುಂದೆ ನಿಂತು ಪ್ರವೇಶಕ್ಕೆ ದಾರಿ ಮಾಡಿಕೊಟ್ಟ, ಪತಿತ ಪಾವನ ಮಂದಿರವನ್ನು ಇಂದಿಗೂ ರತ್ನಾಗಿರಿಯಲ್ಲಿ ನೋಡಬಹುದು). ಸಾವರ್ಕರರ ಇತರ ವಿಷಯಗಳಂತೆ , ಇದೂ ಕೂಡಾ ವಿವಾದಾಸ್ಪದವಾಗಿದ್ದು, ಕೆಳ ವರ್ಗಗಳನ್ನು ಪ್ರತಿನಿಧಿಸುವ ರಾಜಕೀಯ ಪಂಗಡಗಳು ಇವನ್ನು ಪ್ರಶ್ನಿಸಿವೆ. ಹಿಂದಿಯನ್ನು ಮಾತೃಭಾಷೆಯಾಗಿ ಉಪಯೋಗಿಸಬೇಕೆಂದೂ, ದೇವನಾಗರಿ ಲಿಪಿಯನ್ನು ಮುದ್ರಣಕ್ಕೆ ಸಹಾಯವಾಗುವಂತೆ ಸುಧಾರಿಸಬೇಕೆಂದೂ ಅವರು ಕರೆ ಕೊಟ್ಟಿದ್ದರು. ಸ್ವಾತಂತ್ರ್ಯ ಬರುವ ಹಾಗೂ ಬಂದ ನಂತರದ ಅವಧಿಯಲ್ಲಿ, ಭಾರತ ಹಾಗೂ ಪಾಕಿಸ್ತಾನಗಳ ನಡುವೆ ಆಗಬೇಕಾಗಿದ್ದ ಆಸ್ತಿ ವಿಭಜನೆಯ ವಿಷಯದಲ್ಲಿ ಮಹಾತ್ಮಾ ಗಾಂಧಿಯವರು ತೆಗೆದುಕೊಂಡ ನಿಲುವು ಭಾರತದಾದ್ಯಂತ ತೀವ್ರ ವಿವಾದವನ್ನು ಸೃಷ್ಟಿಸಿತು. ಈಗಾಗಲೇ ಗಾಂಧಿಯವರ ಕಟು ಟೀಕಾಕಾರರಲ್ಲಿ ಒಬ್ಬರಾಗಿದ್ದ ಸಾವರ್ಕರ್ , ಗಾಂಧಿಯವರ ನಿಲುವನ್ನು ತೀವ್ರವಾಗಿ ವಿರೋಧಿಸಿದರು. ಮುಂದೆ ನಾಥೂರಾಮ್ ಗೋಡ್ಸೆ ಗಾಂಧಿಯವರಿಗೆ ಗುಂಡಿಕ್ಕಿದಾಗ, ಈ ಕಾರಸ್ಥಾನದ ಮುಖ್ಯಶಿಲ್ಪಿ ಸಾವರ್ಕರ್ ಎಂಬ ಆರೋಪಗಳು ಬಹುವಾಗಿ ಕೇಳಿಬಂದವು. ಗೋಡ್ಸೆ ಹಿಂದೂ ಮಹಾಸಭೆಯ ಸದಸ್ಯರಾಗಿದ್ಧು, ಸಾವರ್ಕರ್ ಅಧ್ಯಕ್ಷತೆಯಲ್ಲಿ ನಡೆಸುತ್ತಿದ್ದ ಮಹಾಸಭೆಯ ಸಭೆಗಳಲ್ಲಿ ಆತ ಭಾಗವಹಿಸುತ್ತಿದ್ದದ್ದೂ,. ಗಾಂಧಿ ಹತ್ಯೆ ಪ್ರಕರಣದಲ್ಲಿ ಮುಖ್ಯ ಆಪಾದಿತರಾಗಿದ್ದ ಗೋಡ್ಸೆ ಹಾಗೂ ನಾರಾಯಣ ಆಪ್ಟೆ ಸಾವರ್ಕರರಿಗೆ ಪರಿಚಿತರಾಗಿದ್ದು, ಅವರನ್ನು ಆಗಾಗ ಭೇಟಿಯಾಗುತ್ತಿದ್ದದ್ದೂ, ಈ ಆರೋಪಗಳಿಗೆ ಮೂಲವಾಗಿತ್ತು. ಗಾಂಧಿ ಹತ್ಯೆಗೆ ಹೋರಟ ಗೋಡ್ಸೆಗೆ ಸಾವರ್ಕರ್ “ ಯಶಸ್ವಿಯಾಗಿ ಬಾ” ಎಂದು ಹರಸಿದರು ಎಂಬ ಊಹಾಪೋಹ , ಗೋಡ್ಸೆ ಇದನ್ನು ಮುಂದೆ ನ್ಯಾಯಾಲಯದ ವಿಚಾರಣೆಯ ಸಮಯದಲ್ಲಿ ಸಂಪೂರ್ಣವಾಗಿ ಅಲ್ಲಗೆಳೆದರೂ, ಕೇಳಿಬಂತು. ಗಾಂಧಿ ಹತ್ಯೆಯ ನಂತರ ದೊಂಬಿ ಗುಂಪುಗಳು ಮುಂಬಯಿಯ ಸಾವರ್ಕರ್ ಮನೆಯ ಮೇಲೆ ( ಅವರು ರತ್ನಾಗಿರಿಯಿಂದ ಮನೆಯನ್ನು ಮುಂಬಯಿಗೆ ಬದಲಾಯಿಸಿದ್ದರು) ಕಲ್ಲುತೂರಾಟ ನಡೆಸಿದರು. ಭಾರತ ಸರ್ಕಾರ ಸಾವರ್ಕರರನ್ನು ಹತ್ಯೆ ಸಂಬಂಧದ ಆರೋಪದ ಮೇಲೆ ಬಂಧಿಸಿದರೂ, ಸರ್ವೋಚ್ಛ ನ್ಯಾಯಾಲಯವು, ಸಾಕ್ಷ್ಯಾಧಾರಗಳಿಲ್ಲದ್ದರಿಂದ, ಅವರನ್ನು ಬಿಡುಗಡೆ ಮಾಡಿತು. “ಸಾಕ್ಷ್ಯಾಧಾರಗಳಿಲ್ಲದ್ದರಿಂದ ಸಾವರ್ಕರರನ್ನು ನಿರ್ದೋಷಿ ಎಂದು ಘೋಷಿಸಿ ಬಿಡುಗಡೆ ಮಾಡಲಾಯಿತು” ಎಂದು ಆಗಾಗ ಹೇಳಲಾಗುತ್ತಿದೆ. ಆದರೂ, ಈ ಪ್ರಕರಣವನ್ನು ಆಲಿಸಿದ ನ್ಯಾಯಮೂರ್ತಿ ಆತ್ಮ ಚರಣರು , ತಪ್ಪೊಪ್ಪಿಕೊಂಡ ( approver) ದಿಗಂಬರ ಬಡಗೆಯ ಸಾಕ್ಷ್ಯ ಈ ವಿಷಯದಲ್ಲಿ “ನೇರವೂ, ನಿಚ್ಚಳವೂ ಆಗಿತ್ತು” ಎಂದು ಕಂಡುಕೊಂಡಿದ್ದಾರೆ. ಆದರೆ ಈ ವಿಷಯವನ್ನು ಸಮರ್ಥಿಸಲು 1948-49ರ ವಿಚಾರಣೆಯ ಕಾಲದಲ್ಲಿ ಸ್ವತಂತ್ರ ಅಭಿಪ್ರಾಯ ಲಭ್ಯವಿರಲಿಲ್ಲ. ಅದು ಲಭ್ಯವಾದದ್ದು 1966ರಲ್ಲಿ ಸಾವರ್ಕರ್ ತೀರಿಕೊಂಡ ನಂತರ. ಅವರ ಸೆಕ್ರೆಟರಿ ಗಜಾನನ ವಿಷ್ಣು ದಾಮ್ಲೆ ಹಾಗೂ ಅಂಗರಕ್ಷಕ ಅಪ್ಪಾ ರಾಮಚಂದ್ರ ಕಾಸರ , ನ್ಯಾಯಮೂರ್ತಿ ಕಪೂರ್ ರ ಮುಂದೆ “ಗೋಡ್ಸೆ ಮತ್ತು ಆಪ್ಟೆ , ಸಾವರ್ಕರರನ್ನು ಜನವರಿ 17ರಂದು ಭೇಟಿಯಾಗಿದ್ದಷ್ಟೇ ಅಲ್ಲ, ದೆಹಲಿಯಿಂದ ಹಿಂತಿರುಗಿದ ನಂತರ , ಜನವರಿ 23 / 24 ರಂದು ಮತ್ತೆ ಭೇಟಿಯಾಗಲು ಬಂದಿದ್ದರು” ಎಂದು ಹೇಳಿಕೆ ಕೊಟ್ಟರು. ಇದಾದ ಕೆಲವೇ ದಿನಗಳಲ್ಲಿ ಗಾಂಧಿಯವರ ಹತ್ಯೆಯಾಯಿತು. ‘Frontline’ ಪತ್ರಿಕೆಯ ಎ.ಜಿ.ನೂರಾನಿ ಈ ವಿಷಯದಲ್ಲಿ ವಿವರವಾದ ತನಿಖಾತ್ಮಕ ವರದಿಗಳನ್ನು ಮಾಡಿದ್ದಾರೆ. ಸಾವರ್ಕರ್ ಮರಣದ ನಂತರ, 1967ರಲ್ಲಿ ಪ್ರಕಟವಾದ , “ಗಾಂಧಿ ಹತ್ಯಾ ಆಣಿ ಮಿ” ( ಗಾಂಧಿ ಹತ್ಯೆ ಮತ್ತು ನಾನು) ಎಂಬ ಮರಾಠಿ ಪುಸ್ತಕದಲ್ಲಿ ಅವರ ತಮ್ಮ ಗೋಪಾಲ್, ಈ ಗಾಢ ಸಂಬಂಧದ ಬಗ್ಯೆ ಬೆಳಕು ಚೆಲ್ಲುತ್ತಾರೆ.. ಈ ವಿಷಯದ ತನಿಖೆಯ ಜವಾಬ್ದಾರಿ ಹೊತ್ತಿದ್ದ ನ್ಯಾಯಮೂರ್ತಿ ಕಪೂರ್ ಆಯೋಗ “ (ಗಾಂಧಿ) ಹತ್ಯೆಯ ಷಡ್ಯಂತ್ರದಲ್ಲಿ ಸಾವರ್ಕರ್ ಮತ್ತು ಇತರರ ಪಾತ್ರದ ಹೊರತಾದ ಎಲ್ಲಾ ವಿಚಾರಧಾರೆಗಳನ್ನೂ ಈ ಎಲ್ಲ ತಥ್ಯಗಳು ನಾಶ ಮಾಡುತ್ತವೆ” ಎಂದು ಅಭಿಪ್ರಾಯ ಪಟ್ಟರು. ಹಿಂದುತ್ವದ ಪರಿಕಲ್ಪನೆಯನ್ನು ಸಾವರ್ಕರ್ ಮೊಟ್ಟಮೊದಲು ಜಾಹೀರು ಮಾಡಿ, ಅದರ ವಿಷಯವಾಗಿ ಬಹಳಷ್ಟು ಬರೆದರು. ಸಾವರ್ಕರ್ “ಯಾರು ಸಿಂಧೂ ನದಿಯಿಂದ, ಸಾಗರದವರೆಗಿನ ಈ ಭರತವರ್ಷವನ್ನು ತನ್ನ ಪಿತೃದೇಶ ಎಂದೂ, ಹಾಗೂ ತನ್ನ ಧರ್ಮದ ತೊಟ್ಟಿಲಾಗಿರುವ ಪವಿತ್ರ ಭೂಮಿ ಎಂದೂ ಪರಿಗಣಿಸುತ್ತಾರೆಯೋ ಅವರೇ ಹಿಂದೂಗಳು” ಎಂದು ವ್ಯಾಖ್ಯಿಸುತ್ತಾರೆ. ಆತ್ಮಾಹುತಿ – ಸಾವರ್ಕರರ ಜೀವನದ ಕುರಿತು ಕನ್ನಡದಲ್ಲಿ ಕಾದಂಬರಿ. ಮಧ್ಯಾಹ್ನ ತರಗತಿಗಳೇ ಇರಲಿಲ್ಲ. ಹೆಚ್‍ಓಡಿ ಮಹಾಶಯ ಅದ್ಯಾವನೋ ಒಬ್ಬ ತನ್ನ ಪರಿಚಯದವನನ್ನು ಹಿಡಿದುಕೊಂಡು ಬಂದು ‘ಗೆಸ್ಟ್ ಲೆಕ್ಚರ್’ ಎಂಬ ಹೆಸರಿನಲ್ಲಿ ಅದೆಂಥದೋ ಕೆಲಸಕ್ಕೆ ಬಾರದ ವಿಷಯದ ಬಗ್ಗೆ ಇಡೀ ಮಧ್ಯಾಹ್ನ ಕೊರೆಸಿದ. ವಿದ್ಯಾರ್ಥಿಗಳಿರಲಿ, ನನ್ನ ಸಹೋದ್ಯೋಗಿಗಳೂ ತೂಕಡಿಸುತ್ತಿದ್ದರು. ನಮಗೆ ನಿದ್ದೆ ಬರಿಸುವುದಕ್ಕಾಗಿ ಅವನಿಗೆ ಯೂನಿವರ್ಸಿಟಿ ತೆತ್ತದ್ದು ವಿಮಾನಯಾನದ ಟಿಎ, ಜತೆಗೆ ಡಿಎ, ಅದೂ ಸಾಲದು ಎಂಬಂತೆ ಒಂದೂವರೆ ಗಂಟೆಗಳ ಒಂದು ‘ಸೆಷನ್’ಗೆ ಐನೂರು ರೂಪಾಯಿಗಳಂತೆ ಎರಡು ಸೆಷನ್‍ಗಳ ಲಬೋಲಬೋಗಳಿಗೆ ಒಂದು ಸಾವಿರ ರೂಪಾಯಿಗಳು! ಮುಂದಿನ ತಿಂಗಳು ಹೆಚ್‍ಓಡಿಯನ್ನು ಅವನು ತನ್ನ ಯೂನಿವರ್ಸಿಟಿಗೆ ಕರೆಯುತ್ತಾನೆ. ಇವನಿಗೂ ಅಷ್ಟೇ ದುಡ್ಡು ಸಿಗುತ್ತದೆ. ಎಲ್ಲಾ “ನನ್ನ ಬೆನ್ನನ್ನ ನೀ ಕೆರೆ, ನಿನ್ನ ಬೆನ್ನನ್ನ ನಾ ಕೆರೀತೀನಿ” ಅನ್ನೋ ಥರಾ. ಅವರಿಬ್ಬರ ಪರ್ಸುಗಳು ದಪ್ಪವಾಗುವುದರ ಹೊರತಾಗಿ ಇನ್ನಾರಿಗೂ ಮೂರು ಕಾಸಿನ ಪ್ರಯೋಜನವೂ ಇಲ್ಲ. ತೆರಿಗೆದಾರನ ಹಣ ಪೋಲಾಗುವುದೇ ಹೀಗೆ. ‘ಗೆಸ್ಟ್’ನ ಪ್ರಲಾಪ, ಅದನ್ನು ಹೊಗಳಿ ಅಟ್ಟಕ್ಕೇರಿಸಿದ ಹೆಚ್‍ಓಡಿಯ ‘ಪ್ರೆಸಿಡೆಂಷಿಯಲ್ ಅಡ್ರೆಸ್’, ಅದ್ಯಾರೋ ಒಂದಿಬ್ಬರು ಅರೆನಿದ್ದೆಯಲ್ಲೇ ಗೊಣಗಿದ ಒಂದೆರಡು ಪ್ರಶ್ನೆಗಳು, ಅವಕ್ಕೆ ಉತ್ತರ (?) ಅಂತೂ ಪ್ರಹಸನ ಮುಗಿದು ಮನೆ ಸೇರಿ ಶವರ್‍ ಕೆಳಗೆ ನಿಂತಾಗ ಅದೆಷ್ಟೋ ನೆಮ್ಮದಿ.ಛಳಿಗಾಲ, ಆರುಗಂಟೆಗೂ ಮೊದಲೇ ಕತ್ತಲಾಗಿಬಿಡುತ್ತದೆ. ಆದು ಬಿಟ್ಟರೆ ಛಳಿಗಾಲದ ಮತ್ತಾವ ಕುರುಹೂ ಇಲ್ಲ. ವಾಸ್ತವವಾಗಿ ಪಾಂಡಿಚೆರಿಯಲ್ಲಿ ಛಳಿಯೇ ಇಲ್ಲ. ನಾವು ತಮಾಷೆಗೆ ಹೇಳುವಂತೆ ಇಲ್ಲಿರುವುದು ಮೂರೇ ಸೀಜ಼ನ್‍ಗಳು ಬೇಸಗೆ, ಉರಿಬೇಸಗೆ, ಬಿರುಬೇಸಗೆ! ಹಾಟ್, ಹಾಟರ್, ಹಾಟೆಸ್ಟ್! ಚಾಯ್ ಮಾಡಿ ಬಾಲ್ಕನಿಯ ಕತ್ತಲಲ್ಲಿ ಕುಳಿತು ಲೋಟಕ್ಕೆ ತುಟಿಯೊತ್ತುವಷ್ಟರಲ್ಲಿ ಫೋನ್ ಕಿಣಿಕಿಣಿಗುಟ್ಟಿತು. ಬಿಸಿಬಿಸಿ ಚಾಯ್‍ನ ಆಕರ್ಷಣೆಗೆ ಯಾವಾಗಲೂ ಸೋಲುವ ನಾನು ಆರಾಮವಾಗಿ ಒಂದೆರಡು ಗುಟುಕು ಕುಡಿದು ನಿಧಾನವಾಗಿಯೇ ಎದ್ದುಹೋಗಿ ಎತ್ತಿಕೊಂಡೆ. ಸದ್ಯ, ಅಲ್ಲಿಯವರೆಗೂ ಅದು ಬಡಿದುಕೊಳ್ಳುತ್ತಲೇ ಇತ್ತು. ಕಿವಿಗಳನ್ನೇ ನಂಬಲಾಗಲಿಲ್ಲ. ‘ಎಷ್ಟು ದಿನ ಆಗಿತ್ತೇ ನಿನ್ನ ದನಿ ಕೇಳಿ! ಎಲ್ಲಿಂದ ಮಾತಾಡ್ತಿದಿಯೇ?’ ಅಚ್ಚರಿ ಸಂತೋಷದಲ್ಲಿ ಕೂಗಿಯೇಬಿಟ್ಟೆ. “ಇಲ್ಲೇ ಹಾಸ್ಟೆಲ್‍ನಲ್ಲೇ. ಸಣ್ಣ ರೂಮು. ಕುರಿ ತುಂಬಿದ ಹಾಗೆ ತುಂಬಿದ್ದಾರೆ. ಐದು ಜನ ಇದೀವಿ. ಇರೋದು ಮೂರು ಮಂಚಗಳು. ಕಬ್ಬಿಣದವು. ಒಬ್ಬರು ಕೂತರೇ ಕಿಂಯ್ಯೋ ಅಂತ ಕಿರುಚ್ತವೆ. ಇನ್ನು ಇಬ್ಬರು ಮಲಗಿದರೆ ಹೇಗೋ.” ನಕ್ಕಳು. “ಇನ್ನೂ ಇಲ್ಲ ಕಣೋ. ಇಲ್ಲಿ ಮೆಸ್ ಇಲ್ಲವಂತಲ್ಲ. ಪಕ್ಕದ ಲೇಡೀಸ್ ಹಾಸ್ಟೆಲ್‍ನಲ್ಲಿ ಊಟಕ್ಕೆ ವ್ಯವಸ್ಥೆ ಮಾಡಿದ್ದಾರೆ. ಯಾಕೆ ನಿಂಗೊತ್ತಿಲ್ವಾ ನಿಮ್ಮ ಯೂನಿವರ್ಸಿಟಿ ಬಂಡವಾಳ? ಅರ್ಧ ಗಂಟೆಯಿಂದ ಕಾದು ನಿಂತಿದ್ದೀವಿ. ಒಳಗೆ ಕಾಲಿಡೋದಿಕ್ಕೇ ಆಗ್ತಾ ಇಲ್ಲ. ಅದೇನು ಹುಡುಗೀರೋ.” ದನಿಯಲ್ಲಿ ಬೇಸರವಿತ್ತು. “ಇಲ್ಲೇ ಇರೇ ಮಾರಾಯ್ತೀ? ಈ ಬೆಡ್ ಸಾಕಾಗಲ್ವಾ?” ದೀಪ ಹಾಕಿ ನನ್ನ ಬೃಹದಾಕಾರದ ಮಂಚ ಹಾಸಿಗೆ ತೋರಿಸಿದೆ. ಅದರ ಗಾತ್ರ ನೋಡಿ ಬೆಚ್ಚಿದಳು. “ನಿಮ್ಮ ಮನೇ ಓನರ್‍‍ಗೆ ನಾಕೈದು ಜನ ಹೆಂಡತಿಯರಿದ್ದಾರೇನೋ?” ಅವಳ ಕಣ್ಣುಗಳು ಇನ್ನೂ ಮಂಚದ ಮೇಲೇ ಓಡಾಡುತ್ತಿದ್ದವು. “ಇದ್ದರೋ ಏನೋ, ಅಂದಕಾಲತ್ತಿಲೇ. ಈಗಂತೂ ಅವನು ಒಂಟಿ. ಮಕ್ಕಳೆಲ್ಲಾ ಫ್ರಾನ್ಸ್ ಲ್ಲಿದ್ದಾರೆ. ಹೆಂದತಿ ಸಹಾ ಅವರೊಂದಿಗೆ ಓಡಿಹೋಗಿದ್ದಾಳೆ.” ನಕ್ಕೆ. “ಸ್ನಾನ ಆಯ್ತೇನೇ? ಇಲ್ಲಾ ಇನ್ನೂ ಮೈಸೂರು ಮಣ್ಣನ್ನ ಮೈಗೆ ಅಂಟಿಸಿಕೊಂಡೇ ಇದ್ದೀಯೇನು?” ಕೇಳಿದೆ. “ಚಪಾತಿ ಪೂರಿ ಪರೋಟಾವನ್ನ ಈ ಜನ ಹೇಳೋದು ಹಾಗೆ.” ನಕ್ಕುಬಿಟ್ಟೆ. “ಇರಲಿ, ಅದು ಬೇಡ, ಅನ್ನಾನೇ ಬೇಕು ಅಂದ್ರೆ ಮುನಿಯಾಂಡಿ ವಿಲಾಸ್‍ಗಳಿಗೆ ಹೋಗೋಣ. ಅವೋ ಬೀದಿಗೊಂದು ಇವೆ. ಅಲ್ಲಿ ಬಣ್ಣದ ಅನ್ನ ಸಿಗತ್ತೆ. ಅನ್ನದಲ್ಲಿ ಕೋಳಿ ಕುರಿ ಮಾಂಸದ ತುಂಡುಗಳೂ ಇರುತ್ವೆ. ಅದನ್ನ ಬಿರಿಯಾನಿ ಅಂತಾರೆ.” ನಕ್ಕೆ. ದುರುಗುಟ್ಟಿಕೊಂಡು ನೋಡಿದಳು. “ಈ ಊರಿಗೆ ಬಂದು ಏನೇನು ಕಲಿತಿದ್ದೀಯೋ? ನೀನಂತೂ ಮೊದಲೇ ಕಪಿ. ಬಾಲ ಒಂದಿಲ್ಲ ಅಷ್ಟೇ.” ಮುಖ ಸಿಂಡರಿಸಿದವಳ ತುಟಿಗಳು ಮಾತಿನ ಕೊನೆಗೆ ತೆಳುನಗೆಯಲ್ಲಿ ಬಿರಿದವು. ಜೋರಾಗಿ ನಕ್ಕುಬಿಟ್ಟೆ. “ಬಿಡೇ ಮಾರಾಯ್ತಿ. ನಿನ್ನನ್ನೇನು ಜಾತಿಗೆಡಿಸೋದಿಲ್ಲ ನಾನು. ಹೋಗು, ನೆಮ್ಮದಿಯಾಗಿ ಸ್ನಾನ ಮಾಡಿ ಬಾ. ನಾನು ಒಂದಷ್ಟು ಅನ್ನ ಬೇಯಿಸ್ತೀನಿ. ಬೇಳೆ ಜತೆಗೆ ನುಗ್ಗೇಕಾಯಿನೂ ಬೇಯಿಸಿರ್ತೀನಿ. ನೀನೇ ಬಂದು ಸಾರು ಮಾಡೊವಂತೆ.” ಬಾತ್‍ರೂಮಿನ ದೀಪ ಹಾಕಿದೆ. “ಹ್ಞುಹ್” ಎಂದು ಒಮ್ಮೆ ಹೂಂಕರಿಸಿ ತನ್ನ ಸೂಟ್‍ಕೇಸಿನತ್ತ ಧಪಧಪ ಹೆಜ್ಜೆಹಾಕಿದಳು. ಅದನ್ನು ತೆರೆದಂತೇ ಬಿಟ್ಟು ಬಾತ್‍ರೂಮಿಗೆ ನುಗ್ಗಿದಳು. ಎರಡು ಕ್ಷಣದಲ್ಲಿ ಶವರ್‍‍ನ “ಸುಂಯ್” ಹಿನ್ನೆಲೆ ಸಂಗೀತದೊಡನೆ ಗುನುಗು ಹಾಡು ಕೇಳಿಬರತೊಡಗಿತು. ಅವಳು ಇಡೀ ಅರ್ಧಗಂಟೆ ಸ್ನಾನ ಮಾಡಿ ಹೊಚ್ಚಹೊಸ ನೈಟಿ ಧರಿಸಿ ಬಾತ್‍ರೂಮಿನಿಂದ ಬೆಡ್‍ರೂಮಿಗೆ ನಾಕು ಸಲ ಧಸಬಸ ಸದ್ದು ಮಾಡಿಕೊಂಡು ಓಡಾಡಿ ಹಾಲ್‍ನ ನಟ್ಟನಡುವೆ ನಡುಬಗ್ಗಿಸಿ ನಿಂತು ಕೆಳಗೆ ತೂಗಿದ ಕೂದಲ ಜಲಪಾತಕ್ಕೆ ಟವಲ್‍ನಿಂದ ಫಟ್‍ಫಟ್ ಹೊಡೆದಳು. ನೂರು ನೂರು ನೆನಪುಗಳು ಎದೆಯಾಳದಿಂದ ಒದ್ದುಕೊಂಡು ಮೇಲೆದ್ದು ಬಂದವು. ಅವಳು ಕೂದಲಿಗೆ ಟವಲ್ ಸುತ್ತಿ ಶಿವನ ಶಿಖೆಯಂತೆ ಮೇಲೆತ್ತಿ ನಿಲ್ಲಿಸುವಷ್ಟರಲ್ಲಿ ಅನ್ನ ಆಗಿ ಬೇಳೆಸಾರು ಕುದಿಯುತ್ತಿತ್ತು. ಇನ್ನೊಂದು ಬರ್ನರ್‍‍ನಲ್ಲಿ ನಾನು ಆಲೂಗೆಡ್ಡೆಯ ತುಂಡುಗಳನ್ನು ಹುರಿಯುತ್ತಿದ್ದೆ. “ಏನು ಮಾಡಿದೀಯೋ? ಸಾರು ಗಮಗಮ ಅಂತಿದೆ” ಎನ್ನುತ್ತಾ ಅಡಿಗೆಮನೆಯೊಳಗೆ ಬಂದಳು. “ಇನ್ನು ನೀನು ಹೋಗಿ ಕೈತೊಳಕೊಂಡು ಕೂರು” ಎನ್ನುತ್ತಾ ತಾನೇ ಡೈನಿಂಗ್ ಟೇಬಲ್ ಅಣಿಗೊಳಿಸಿದಳು. ನನ್ನ ತಟ್ಟೆಗೆ ಬಡಿಸಿ ತಾನೂ ಬಡಿಸಿಕೊಂಡಳು. ತುತ್ತು ಬಾಯಿಗಿಟ್ಟು ಕಣ್ಣರಳಿಸಿದಳು. “ನುಗ್ಗೆಕಾಯಿಹುಳಿಯ ರುಚಿ ಥೇಟ್ ನಿಮ್ಮಮ್ಮ ಮಾಡ್ತಾ ಇದ್ದಂಗೇ ಇದೆ ಕಣೋ” ಎನ್ನುತ್ತಾ ಮತ್ತಷ್ಟು ಸಾರು ಸುರಿದುಕೊಂಡು ಸೊರಸೊರ ಹೀರಿದಳು. “ನೀನು ಇಷ್ಟು ಚೆನ್ನಾಗಿ ಅಡಿಗೆ ಮಾಡ್ತೀಯ ಅಂತ ಗೊತ್ತಿದ್ರೆ ನಿನ್ನನ್ನೇ ಮದುವೆ ಮಾಡಿಕೊಳ್ತಾ ಇದ್ದೆನಲ್ಲೋ” ಎನ್ನುತ್ತಾ ನಕ್ಕು ಸಟಕ್ಕನೆ ಮುಖ ಸಪ್ಪಗಾಗಿಸಿಕೊಂಡಳು. ಊಟವಾದ ಮೇಲೆ ಬಾಲ್ಕನಿಯಲ್ಲಿ ಕುಳಿತೆವು. “ದೀಪ ಆರಿಸೋ. ಕಣ್ಣಿಗೇ ಚುಚ್ಚುತ್ತೆ” ಎನ್ನುತ್ತಾ ಬೆಡ್‍ರೂಮಿನ ಕಿಟಕಿಯಿಂದ ಹರಿದುಬರುತ್ತಿದ್ದ ಬೆಳಕಿಗೆದುರಾಗಿ ಕೈ ಅಡ್ಡತಂದಳು. ಎದ್ದುಹೋಗಿ ದೀಪ ಆರಿಸಿ ಬಂದೆ. ಬಾಲ್ಕನಿ ಕತ್ತಲುಗಟ್ಟಿತು. ಐವತ್ತು ಅರವತ್ತು ಅಡಿಗಳಾಚೆಯ ತಾಳೆಮರಗಳ ತೋಪಿನಲ್ಲಿ ಗಾಳಿ ಮೆಲುವಾಗಿ ಸುಂಯ್‍ಗುಡುತ್ತಾ ತನ್ನ ಪಾಡಿಗೆ ತಾನು ಆಟವಾಡಿಕೊಳ್ಳುತ್ತಿತ್ತು. ಅದರಾಚೆ ಬಂಗಾಳಕೊಲ್ಲಿಯ ಅಲೆಗಳ “ಧೂ…ಪ್ ಧೊಪ್” ಬಡಿತ. ಅದರ ಹೊರತಾಗಿ ಎಲ್ಲೆಡೆ ನಿಶ್ಶಬ್ದ. ನೀರವ ನಿಶೆಯಲ್ಲಿ ನೆನಪುಗಳು ಅಲೆಯಂತೆ ಎದ್ದುಬಂದು ನಮ್ಮೆದೆಗೆಳಿಗೆ ಬಡಿದು ಇಬ್ಬರನ್ನೂ ಅತ್ತಿತ್ತ ತಳ್ಳಾಡತೊಡಗಿದವು. ಬೆಳಕಿನಲ್ಲಿ ತಂತಾನೇ ಮೂಡಿ ಮುಖದ ಮೇಲೆಲ್ಲಾ ಕವಿದುಕೊಂಡಿದ್ದ ಮುಖವಾಡಗಳೆಲ್ಲಾ ಕತ್ತಲಲ್ಲಿ ಅದೆತ್ತಲೋ ಕರಗಿಹೋಗಿ ಮನಸ್ಸು, ಕಣ್ಣುಗಳು ಬತ್ತಲಾದವು. “ನೀವೆಲ್ಲ ಇದ್ದಕ್ಕಿದ್ದ ಹಾಗೆ ಮನೆ ಬಿಟ್ಟು ಬೇರೆ ಕಡೆ ಹೊರಟುಹೋದದ್ದು ಯಾಕೆ? ಅದೂ ನಾವು ಎರಡುದಿನಕ್ಕೆ ಅಂತ ಶೃಂಗೇರಿಗೆ ಹೋಗಿದ್ದು ಬರೋದರ ಒಳಗೆ?” ಇಡೀ ಹತ್ತು ವರ್ಷಗಳಿಂದ ಶವವಾಗಿ ಕೊಳೆಯುತ್ತಿದ್ದ ಪ್ರಶ್ನೆ ಕತ್ತಲಲ್ಲಿ ಜೀವ ತಳೆದು ಎದ್ದುಕೂತು ನರಳಿತು. ಅವಳು ಮೌನವಾದಳು. ನಾನು ಕಾದೆ. ಗಾಳಿಗೆದುರಾಗಿ ಪ್ರಯಾಸದಿಂದ ಹೊರಳಿಬರುವ ಸಮುದ್ರದ ಪುಟ್ಟ ಅಲೆಯಂತೆ ಕೊನೆಗೂ ಅವಳ ಉತ್ತರ ಮೆಲ್ಲಮೆಲ್ಲನೆ ಬಂತು. ನಾನು ದಂಗಾಗಿಹೋದೆ. ಪ್ರತಿಕ್ರಿಯಿಸಲಾರದೇ ಕತ್ತಲಲ್ಲಿ ಅವಳ ಮುಖದ ಬಣ್ಣಗಳನ್ನು ಹುಡುಕಿದೆ. ಅವಳ ದನಿ ಸಾಗಿತ್ತು: “ಏನು ನಡೀತು ಅಂತ ನಾನೇ ನಿಮ್ಮಮ್ಮನ್ನ ಕೇಳಿದೆ. ಅವರು ಮೊದಲೇ ಮಹಾ ಮೌನಿ. ಏನೂ ಹೇಳಲೇ ಇಲ್ಲ. ಸುಮ್ಮನೆ ಸಣ್ಣಗೆ ನಕ್ಕುಬಿಟ್ಟರು. ನಾನೇ ಒತ್ತಾಯಿಸಿದಾಗ’ಎಲ್ಲಾದ್ರೂ ಸುಖವಾಗಿ ಬಾಳು ಮಗೂ’ ಅಂತ ಹೇಳಿ ತಲೆ ಸವರಿದರು. ಸರಸಕ್ಕನ್ನ ಕೇಳೋಣಾಂದ್ರೆ ಅವಳು ಸಿಗ್ಲೇ ಇಲ್ಲ. ಅದ್ಯಾಕೋ ಹಿಂಜರಿಕೆಯಾಗಿ ನಿನ್ನ ಜತೆ ಮಾತು ತೆಗೆಯಲು ಆಗಲೇ ಇಲ್ಲ. ಅದೇನು ಮರುಳೋ, ಆದದ್ದಾಗಲೀ ಅಂತ ಸುಮ್ಮನಿದ್ದುಬಿಟ್ಟೆ. ವಾರ ಕಳೆಯುವುದರೊಳಗೆ ದೆಹಲಿಯಲ್ಲಿ ರೀಸರ್ಚ್ ಮಾಡುತ್ತಿದ್ದ ಸೋದರಮಾವ ರಜಕ್ಕೆ ಅಂತ ಬಂದ. ಮಾರನೇ ದಿನವೇ ಅವನ ಜತೆ ನನ್ನ ಎಂಗೇಜ್‍ಮೆಂಟು. ತಿಂಗಳಲ್ಲಿ ಮದುವೆಯೂ ಆಗಿಹೋಯ್ತು. ತಾಳಿಕಟ್ಟಿ ಅವನು ಮತ್ತೆ ದೆಹಲಿಗೆ ಹೊರಟುಹೋದ. ಅವನನ್ನು ಅಷ್ಟು ಅರ್ಜೆಂಟಾಗಿ ಅಮ್ಮ ಕರೆಸಿದ್ದೇ ಅದಕ್ಕಾಗಿ ಅಂತ ಆಮೇಲೆ ಗೊತ್ತಾಯ್ತು. ‘ಏನೇ ಈಗ ತಾನೆ ಮದುವೆಯಾಗಿರೋ ನಿನ್ನ ಮಗಳ ಮುಖದ ಕಳೆಗಿಂತ ನಿನ್ನ ಮುಖದ ಕಳೆಯೇ ಜೋರಾಗಿದೆಯಲ್ಲೇ?’ ಅಂತ ಮದುವೆಗೆ ಬಂದಿದ್ದ ದೊಡ್ಡತ್ತೆ ಅಮ್ಮನನ್ನ ಕೆಣಕಿದಾಗ ನಾ ಕಳಕೊಂಡದ್ದೇನು ಅಮ್ಮ ಗಳಿಸಿದ್ದೇನು ಅಂತ ಲೆಕ್ಕ ಹಾಕೋದಿಕ್ಕೆ ಶುರು ಮಾಡ್ದೆ.” ನಿಡುಸುಯ್ದಳು. ಮುಂದಿನ ಐದಾರು ನಿಮಿಷಗಳು ನಮ್ಮ ನಡುವೆ ಮೌನವಿತ್ತು. ಇಡೀ ಒಂದು ದಶಕದ ಹಿಂದೆ ಇದ್ದಕ್ಕಿದ್ದಂತೆ ದೂರ ಸರಿದುಹೋದವಳು ಈಗ ಕತ್ತಲಿನಲ್ಲಿ ಎದುರು ಕೂತು ‘ನನ್ನೆದೆಯ ಗೀರುಗಳನ್ನು ಲೆಕ್ಕಹಾಕೋ’ ಎಂದು ಕೇಳುತ್ತಿದ್ದಳು. ನನಗೆ ಮತ್ತೆ ಮತ್ತೆ ಲೆಕ್ಕ ತಪ್ಪುತ್ತಿತ್ತು. “ಕೆಲಸಕ್ಕೆ ಯಾವಾಗ ಸೇರಿದೆ?” ವಿಷಯ ಬದಲಾಯಿಸಲು ಪ್ರಯತ್ನಿಸಿದೆ. “ಐದಾರು ತಿಂಗಳಾಯ್ತು ಅಷ್ಟೇ. ತಾಳಿ ಕಟ್ಟಿದ ಆ ಮಹಾರಾಯ ತನ್ನ ಕೆಲಸವಾಯ್ತು ಅಂತ ಮತ್ತೆ ದೆಹಲಿಗೆ ಓಡಿಹೋದ. ಅವನು ಕಟ್ಟಿಹೋದ ಮೂಗುದಾರವನ್ನ ಅಮ್ಮ ಭದ್ರವಾಗಿ ಹಿಡಿದಿದ್ದೇನೋ ನಿಜ. ಆದರೂ ನನ್ನ ಓದು ಮುಂದುವರೀತು ಸಧ್ಯ. ಅವನು ಪಿಹೆಚ್‍ಡಿ ಮುಗಿಸೋವಷ್ಟರಲ್ಲಿ ನನ್ನ ಎಂಎನೂ ಮುಗೀತು. ಅದೀಗ ಅನುಕೂಲಕ್ಕೆ ಬಂತು ನೋಡು.” ನಕ್ಕಳು. ನಗೆಯಲ್ಲಿ ನಲಿವಿರಲಿಲ್ಲ. “ಯಾಕೆ ಏನಾಯ್ತು?” ನನಗರಿವಿಲ್ಲದಂತೇ ಪ್ರಶ್ನೆ ಹೊರಬಿದ್ದಿತ್ತು. “ಏನ್ ಹೇಳ್ಲಿ? ಅವನಿಗೆ ತುಂಬಾ ಹಣ ಬೇಕಂತೆ. ಅದನ್ನ ಸಂಪಾದಿಸೋದಿಕ್ಕೆ ಯಾವಾಗ್ಲೂ ದುಡೀತಾನೇ ಇರಬೇಕಂತೆ. ಕೆಲಸ ಕೆಲಸ ಅಂತ ಅವನು ಮೂರುಹೊತ್ತೂ ಅದೇ ಗುಂಗಿನಲ್ಲಿರ್ತಾನೆ. ಅಮೆರಿಕಾ ಇಂಗ್ಲೆಂಡು ಅಂತ ಹಾರಾಡ್ತಿರ್ತಾನೆ. ಮೊನ್ನೇನೂ ಅದೆಲ್ಲಿಗೋ ಹಾರಿಹೋದ. ಇನ್ನು ಅದ್ಯಾವಾಗ ಮುಖ ತೋರಿಸ್ತಾನೋ. ನನಗೆ ಒಂಟಿತನ ಸಾಕು ಅನಿಸಿಬಿಡ್ತು. ಇಲ್ಲಿಗೆ ಸೇರ್ಕೊಂಡೆ. ಪ್ರೈವೇಟ್ ಕಾಲೇಜು. ಯುಜಿಸಿ ಸ್ಕೇಲಿಗೆ ಸೈನ್ ಮಾಡಿಸಿಕೊಂಡು ಅದರ ಅರ್ಧ ಕೊಡ್ತಾರೆ. ಇರಲಿ, ನನಗೆ ಬೇಕಾಗಿರೋದು ಅದಲ್ಲ. ತಿಂಗಳು ತಿಂಗಳು ನನ್ನ ಕೈಯಿಂದಲೇ ಅವರಿಗೆ ದುಡ್ಡು ಕೊಟ್ಟು ದುಡಿಯೋದಕ್ಕೂ ಸಿದ್ದ ನಾನು.” ಮತ್ತೊಮ್ಮೆ ಅಗಿದುಗಿದ ಕಬ್ಬಿನ ಸಿಪ್ಪೆಯಂತಹ ನಗೆ. “ನಾನು ಇಲ್ಲಿದೀನಿ ಅಂತ ನಿಮ್ಮಮ್ಮನಿಗೆ ಗೊತ್ತಾ?” ಕೇಳಬೇಕೋ ಬೇಡವೋ ಎಂದುಕೊಳ್ಳುತ್ತಲೇ ಕೇಳಿಬಿಟ್ಟೆ. ಬಿಕ್ಕಿದ್ದು ಅವಳೋ ಇಲ್ಲಾ ಕತ್ತಲೆಯೋ ಗೊತ್ತಾಗಲಿಲ್ಲ. ಥಟ್ಟನೆ ಮೇಲೆದ್ದೆ. ಅವಳ ಕೈಹಿಡಿದು ಎಬ್ಬಿಸಿದೆ. ನಿಧಾನವಾಗಿ ಎದ್ದಳು. ಒಳಗೆ ಬಂದು ಲೈಟ್ ಹಾಕುವವರೆಗೂ ಅವಳ ಕೈ ನನ್ನ ಕೈಯಲ್ಲಿತ್ತು. ದೀಪ ಹತ್ತಿಕೊಳ್ಳುತ್ತಿದ್ದಂತೇ ಛಕ್ಕನೆ ಕೈಬಿಡಿಸಿಕೊಂಡಳು. ಅತ್ತ ಮುಖ ತಿರುಗಿಸಿಕೊಂಡು ಸರಸರನೆ ಬಾತ್‍ರೂಮಿನತ್ತ ಓಡಿದಳು. ನಾನು ಅಲ್ಲೇ ಮಂಚದ ಅಂಚಿನಲ್ಲಿ ಕುಸಿದೆ. ಐದು ನಿಮಿಷದ ನಂತರ ಅವಳು ಟವಲ್‍ನಲ್ಲಿ ಮುಖ ಒರೆಸುತ್ತಾ ಬಂದಾಗ ತುಂಬಾ ಫ್ರೆಶ್ ಆಗಿ ಕಂಡಳು. ಬಾಲ್ಕನಿಯ ಕತ್ತಲಲ್ಲಿ ಹೊರಚೆಲ್ಲಾಡಿದ್ದ ಬಣ್ಣಗಳೆಲ್ಲಾ ಈಗ ಬೆಳಕಿನಲ್ಲಿ ಒಂದಾಗಿ ಸೇರಿ ಬಿಳಿಯ ಬಣ್ಣವಾಗಿಬಿಟ್ಟಿದ್ದವು. “ಹ್ಞಾ ಮರೆತೇಹೋಗಿತ್ತು. ಜಾನಕಿ ಅಕ್ಕನೂ ಇಲ್ಲೇ ಇದ್ದಾಳಂತಲ್ಲ! ಸರಸಕ್ಕ ಹೇಳಿದ್ಲು.” ಟವಲ್‍ನ ಒಂದು ತುದಿಯಿಂದ ಹುಬ್ಬುಗಳನ್ನು ಒತ್ತುತ್ತಾ ಮಾತು ತೆಗೆದಳು. ನಕ್ಕು ಎರಡು ಗುಟುಕು ನೀರು ಕುಡಿದೆ. ಹರಡಿದ ಟವಲ್‍ನ ಒಂದು ತುದಿಯಿಂದ ಹುಬ್ಬುಗಳನ್ನು ಮತ್ತೊಮ್ಮೆ ಒತ್ತಿಕೊಂಡು ನನ್ನತ್ತ ಬಂದಳು. “ನೀನೆಲ್ಲಿ ಮಲಗ್ತೀಯೋ?” ಪಕ್ಕ ನಿಂತು ಕೇಳಿದಳು. “ಏಯ್ ಏನೋ ಹೇಳ್ತಾ ಇದೀಯ ನೀನು?” ಬೆನ್ನಿಗೆ ಗುದ್ದಿದಳು. ಕಣ್ಣುಗಳಲ್ಲಿ ಫಕ್ಕನೆ ಲಜ್ಜೆ ಇಣುಕಿತ್ತು. ಹತ್ತುವರ್ಷ ಚಿಕ್ಕವಳಾಗಿ ಕಂಡಳು. ನನ್ನ ನೆನಪಿನಲ್ಲಿ ಅಚ್ಚಳಿಯದೇ ಉಳಿದಿದ್ದ `ಅಮ್ಮ ಎಲ್ಲೋ ಕಾಣ್ತಾ ಇಲ್ಲ, ನಿಮ್ಮಮ್ಮನೂ ಹತ್ರ ಇಲ್ಲ, ನಂಗೆ ಜಡೆ ಹೆಣೆದುಕೊಡೋ’ ಎಂದು ಕೇಳುತ್ತಿದ್ದ ಅದೇ ಆಸೆಗಳ ವಯಸ್ಸಿನ ಹುಡುಗಿಯಾಗಿಬಿಟ್ಟಿದ್ದಳು. “ನಾನು ತಮಾಷೆ ಮಾಡ್ತಿಲ್ವೇ. ಇನ್ನೂ ಇಬ್ಬರು ಬಂದರೂ ಇಲ್ಲಿ ಜಾಗ ಇರತ್ತೆ.” ಮಂಚದ ಮೇಲೆ ಕುಳಿತಂತೇ ಅವಳ ಕೈ ಹಿಡಿದೆಳೆದೆ. ಧೊಪ್ಪನೆ ಕುಕ್ಕರಿಸಿದವಳು ನನ್ನನ್ನೇ ನೇರವಾಗಿ ನೋಡಿದಳು. “ಇಬ್ರೂ ಇಲ್ಲೇ ಮಲಗೋದು ಅಂತೀಯ?” ಪಿಸುಗುದನಿಯಲ್ಲಿ ಪ್ರಶ್ನಿಸಿದಳು. ನಾನು ಉತ್ತರಿಸಲಿಲ್ಲ. ಮೈಮೇಲಿದ್ದ ಜುಬ್ಬಾವನ್ನು ತಲೆಯ ಮೇಲಿಂದ ಸೆಳೆದು ಹಾಕಿ ಕುರ್ಚಿಯ ಮೇಲೆಸೆದೆ. “ಏಯ್ ಇಲ್ಲಿ ಕೇಳೋ.” ಸಣ್ಣಗೆ ಕರೆದಳು. ಅತ್ತ ತಿರುಗಿದೆ. “ನಂಗೆ… ನಂಗೆ… ಅದಾಗಿಬಿಟ್ಟಿದೆ ಕಣೋ.” ನನ್ನತ್ತ ನೋಡದೇ ದನಿ ಎಳೆದು ತಪ್ಪಿತಸ್ಥಳಂತೆ ತಲೆತಗ್ಗಿಸಿದಳು. “ಅಯ್ ತಂದ್ಲು ಸುದ್ದೀನ! ಮಲಗೇ ತೆಪ್ಪಗೆ.” ಹೇಳುತ್ತ ಅವಳ ಎರಡೂ ಭುಜಗಳಿಗೆ ಕೈಹಾಕಿ ಹಾಸಿಗೆಯ ಮೇಲೆ ಕೆಡವಿದೆ. ಕೈಗಳನ್ನು ಎರಡೂ ದಿಕ್ಕಿಗೆ ವಿಶಾಲವಾಗಿ ಹರಡಿ ಪಿಳಿಪಿಳಿ ಕಣ್ಣುಬಿಟ್ಟಳು. “ಜಾಣಮರಿ. ಗೋಡೆ ಪಕ್ಕಕ್ಕೆ ಉರುಳಿಹೋಗು ಮತ್ತೆ.” ಮಗುವಿಗೆ ಹೇಳುವ ಹಾಗೆ ಹೇಳಿದೆ. “ನನಗೆ ಜಾಗ ಬೇಡವಾ?” ಛಕ್ಕನೆ ದನಿ ಎತ್ತರಿಸಿದೆ. ಥೇಟ್ ಮಕ್ಕಳಾಟದಂತೇ ಎರಡು ಸುತ್ತು ಉರುಳಿ ಗೋಡೆ ಸೇರಿದಳು. ಮೊನ್ನೆ ತಾನೆ ಒಗೆದು ಒಣಗಿಸಿಟ್ಟಿದ್ದ, ನುಸಿಗುಳಿಗೆಗಳ ಪರಿಮಳ ಸೂಸುತ್ತಿದ್ದ ಹೊದಿಕೆಯನ್ನು ಬೀರುವಿನಿಂದ ಹೊರತೆಗೆದೆ. ಅದನ್ನು ಕೈಗಳಲ್ಲಿ ಹಿಡಿದಂತೇ ಮಂಚದ ಮೇಲೆ ಮಂಡಿಗಳನ್ನೂರಿ ಅವಳನ್ನು ಸಮೀಪಿಸಿದೆ. ಬಟ್ಟಲುಗಣ್ಣುಗಳನ್ನು ಅರಳಿಸಿಕೊಂಡು ನನ್ನನ್ನೇ ನೋಡುತ್ತಿದ್ದವಳ ಮೈನ ಉದ್ದಕ್ಕೂ ಹೊದಿಕೆ ಹೊದಿಸಿದೆ. “ಈ ಮಂಚದಲ್ಲಿ ಸೊಗಸಾದ ನಿದ್ದೆ ಬರುತ್ತೆ ರುಕ್ಕೂ. ನೆಮ್ಮದಿಯಾಗಿ ಮಲಗು.” ಪಿಸುಗಿ ಮಂಚದಿಂದ ಕೆಳಗಿಳಿದೆ. ಮತ್ತೆ ಅವಳತ್ತ ತಿರುಗದೇ ದೀಪ ಆರಿಸಿ ಕೋಣೆಯಿಂದ ಹೊರಬಂದು ಕತ್ತಲುಗಟ್ಟಿದ್ದ ಪ್ಯಾಸೇಜ್‍ನಲ್ಲಿ ಹೆಜ್ಜೆ ಎಳೆದೆ. ಹಾಲ್ ಸೇರಿ ಸೋಫಾದಲ್ಲಿ ಅಂಗಾತ ಉರುಳಿದೆ. ಕತ್ತಲಲ್ಲಿ ಕೈ ಕಣ್ಣುಗಳತ್ತ ಸರಿಯಿತು. ಬೆರಳುಗಳಿಗೆ ತೇವ ಹತ್ತಿತು. ಲೆಕ್ಕದ ಮೇಷ್ಟ್ರು ಶಿವಲಿಂಗಯ್ಯನ ಲೆಕ್ಕ ತಪ್ಪುತ್ತಾ ಇದೆ ಅನ್ನುವುದು ಮೊದಲು ಗೊತ್ತಾದದ್ದು ಅವರ ಗೆಳೆಯ ಪುಟ್ಟಲಿಂಗಯ್ಯನಿಗೆ. ಸದಾ ಸಂಜೆ ವಾಕಿಂಗಿಗೆ ಶಿವಲಿಂಗಯ್ಯನ ಜೊತೆ ಹೋಗುತ್ತಿದ್ದ ಪುಟ್ಟಲಿಂಗಯ್ಯ ಮಾರನೇ ಸಂಜೆ ಬಂದಾಗ ಶಿವಲಿಂಗಯ್ಯ ಟೆಲಿಫೋನಿನ ಮುಂದೆ ಕೂತಿದ್ದರು. ವಾಕಿಂಗ್ ಬರೋಲ್ವಾ ಅಂತ ಕೇಳಿದ್ದಕ್ಕೆ, ಇಲ್ಲ ಯಾವುದೋ ಫೋನ್ ಬರೋದಿದೆ ಅಂತ ಹೇಳಿ, ಅವನನ್ನು ಸಾಗಹಾಕಿದರು. ಫೋನಿನ ಮುಂದೆ ಪ್ರತಿಷ್ಠಾಪಿತರಾಗಿ ಅಹೋರಾತ್ರಿ ಕಾದರು. ಟೆಲಿಫೋನಿನ ಮುಂದೆ ಕೂತು ಅದೇನು ತಪಸ್ಸು ಮಾಡ್ತಿದ್ದೀರಿ ಅನ್ನುವ ಹೆಂಡತಿ ಗಿರಿಜೆಯ ಪ್ರಶ್ನೆಗೆ ಅವರ ಬಳಿ ಉತ್ತರ ಇರಲಿಲ್ಲ. ತಾನೇಕೆ ಫೋನಿನ ಮುಂದೆ ಕಾಯುತ್ತಿದ್ದೇನೆ ಅನ್ನುವುದು ಅವರಿಗೂ ಗೊತ್ತಿರಲಿಲ್ಲ. ಅದೆಲ್ಲ ಶುರುವಾದದ್ದು ಒಂದೇ ಒಂದು ಫೋನ್ ಕಾಲ್‌ನಿಂದ. ನಿವೃತ್ತ ಲೆಕ್ಕದ ಮೇಷ್ಟ್ರು ಶಿವಲಿಂಗಯ್ಯನವರಿಗೆ ಆ ಮುಸ್ಸಂಜೆ ಇದ್ದಕ್ಕಿದ್ದಂತೆ ಹಾಸನದಲ್ಲಿರುವ ತಮ್ಮನ ಜೊತೆ ಮಾತಾಡಬೇಕು ಅನ್ನಿಸಿತು. ಆಗಷ್ಟೇ ಸಂಜೆ ಕರಗಿತ್ತು, ರಾತ್ರಿ ಇಳಿದಿರಲಿಲ್ಲ. ಅವರ ಮನೆಯ ಹಜಾರದಲ್ಲಿ ಇನ್ನೂ ಬೆಳಕಾಡುತ್ತಿತ್ತು. ಆ ಹೊತ್ತಲ್ಲಿ ಮೇಷ್ಟರು ಕಿಟಕಿಯ ಬಳಿ ಕುಳಿತುಕೊಂಡು ಅಲ್ಲೇ ಪಕ್ಕದಲ್ಲಿಟ್ಟಿದ್ದ ಹಳೇ ಕಾಲದ ಫೋನಿನ ಮುಕ್ಕಾಲು ಕೇಜಿ ಭಾರದ ರಿಸೀವರ್ ಎತ್ತಿಕೊಂಡರು. ಆಮೇಲೆ ಅದರ ಪಕ್ಕದಲ್ಲಿದ್ದ ಟೆಲಿಫೋನ್ ಡೈರಿ ಎತ್ತಿಕೊಂಡು ಐ ಜೆ ಕೆ ಎಲ್ ಎಮ್ ಎಂದು ಹುಡುಕಾಡಿ, ಮಹೇಶ ಅನ್ನುವ ಹೆಸರನ್ನು ಹುಡುಕಿ, ಅದರ ಪಕ್ಕದಲ್ಲಿ ಚಿತ್ತುಚಿತ್ತಾಗಿ ಬರೆದಿದ್ದ ಹತ್ತು ಅಂಕಿಗಳ ನಂಬರನ್ನು ಟರ್ರ.. ಟ್‌ಟ್‌ರ್ರಾ… ಟರ್ರ್.. ಟರ್ರ್‌ರ್ರ್… ಎಂದು ಹತ್ತು ಸಲ ತೋರು ಬೆರಳಿನಿಂದ ತಿರುಗಿಸುತ್ತಾ ಡಯಲ್ ಮಾಡಿದರು. ಅವರಿಗೆ ಆ ಹಳೇ ಕಾಲದ ಡಯಲ್ ಫೋನೆಂದರೆ ಇಷ್ಟ. ಈ ಕಾಲದ ಒತ್ತುಗುಂಡಿ ಫೋನೆಂದರೆ ಅಷ್ಟಕ್ಕಷ್ಟೇ. ಅದು ಸಿಡಿಲು ಬಂದರೆ ಸುಟ್ಟು ಹೋಗುತ್ತೆ, ಮಳೆ ಬಂದರೆ ಕೆಟ್ಟು ಹೋಗುತ್ತದೆ. ಸರಿಯಾಗಿ ಕೇಳಿಸೋದಿಲ್ಲ ಅಂತ ನಂಬಿದ್ದರು ಅವರು. ಅದಕ್ಕೆ ಸರಿಯಾಗಿ ಮಳೆ ಬಂದಾಗೆಲ್ಲ ಆ ಹೊಸ ಫೋನುಗಳು ಸುಟ್ಟು ಹೋದ ಉದಾಹರಣೆಗಳು ಅವರ ಕಿವಿಗೆ ಬೀಳುತ್ತಿದ್ದವು. ಹೀಗಾಗಿ ಅವರು ಆ ಹಳೇ ಕಾಲದ ಫೋನೇ ವಾಸಿ ಅನ್ನುವ ಖಚಿತ ತೀರ್ಮಾನಕ್ಕೆ ಬಂದಿದ್ದರು. ಶಿವಲಿಂಗಯ್ಯ ಆ ಹಳೇ ಪೋನಿನಿಂದ ತಮ್ಮನ ಮೊಬೈಲಿಗೆ ಫೋನ್ ಮಾಡಿ ಕಾದರು. ಅತ್ತಲಿಂದ ಫೋನು ರಿಂಗಾಗುವ ಸದ್ದು ಕೇಳಿ ಬರಲಿಲ್ಲ. ಅದರ ಬದಲಿಗೆ ಕೇಳಿಬಂದದ್ದು ಶಿವಲಿಂಗಯ್ಯನವರು ತುಂಬ ಮೆಚ್ಚಿದ್ದ ಹಿಂದಿ ಹಾಡು: ಹಮೇ ತುಮ್‌ಸೇ ಪ್ಯಾರ್ ಕಿತ್‌ನಾ, ಯೇ ಹಮ್ ನಹೀ ಜಾನ್‌ತೇ.. ಮಗರ್ ಜೀ ನಹೀ ಸಕ್‌ತೇ.. ತುಮ್ಹಾರೇ ಬಿನಾ..
ಶಿವಲಿಂಗಯ್ಯನಿಗೆ ಅರೆಕ್ಷಣ ಆಶ್ಚರ್ಯವಾಯಿತು. ತಾವು ಫೋನ್ ಮಾಡಿದ್ದು ಮೊಬೈಲಿಗೋ ಯಾವುದಾದರೂ ರೇಡಿಯೋ ಸ್ಟೇಷನ್ನಿಗೋ ಎಂಬ ಅನುಮಾನ ಬಂತು. ಫೋನ್ ಲೈನಿಗೆ ಯಾವುದಾದರೂ ರೇಡಿಯೋ ಸ್ಟೇಷನ್ನು ಸಿಕ್ಕಿಬಿಟ್ಟಿದೆಯೋ ಎಂದುಕೊಂಡು ಫೋನ್ ಕಟ್ ಮಾಡೋಣ ಅಂದುಕೊಳ್ಳುವಳ್ಳುವಷ್ಟರಲ್ಲಿ ಅವರ ಕಿವಿಗೆ ಹಲೋ ಅನ್ನುವ ಮಧುರವಾದ ದನಿಯೊಂದು ಕೇಳಿಸಿತು. ಅಂಥ ಸುಮಧುರ ಕಂಠವನ್ನು ಅವರು ಕೇಳಿಯೇ ಇರಲಿಲ್ಲ. ಅದು ಕಿವಿಗೆ ಬೀಳುತ್ತಲೇ ಶಿವಲಿಂಗಯ್ಯ ಒಂದು ಸಾರಿ ದಂಗಾಗಿಹೋದರು. ಆ ಸ್ಥಿತಿಯಲ್ಲಿ ಅವರಿಗೆ ಮಾತೇ ಹೊರಡಲಿಲ್ಲ. ಆಗಷ್ಟೇ ಕೇಳಿದ ಹಮೇ ತುಮ್‌ಸೇ ಪ್ಯಾರ್ ಕಿತ್‌ನಾ ಹಾಡು, ಅದು ಕರೆದುಕೊಂಡು ಹೋದ ಯೌವನದ ದಿನಗಳ ನೆನಪು, ಆ ನೆನಪಿನ ಬೆನ್ನಿಗೇ ಎಂದೂ ಕೇಳಿರದ, ಎಲ್ಲಿಯೋ ಕೇಳಿದ್ದೇನೆ ಅನ್ನಿಸಿದ ಆ ಮಂಜುಳ ಧ್ವನಿ. ಶಿವಲಿಂಗಯ್ಯ ಕಂಪಿಸಿದರು. ಆ ಧ್ವನಿ ಮತ್ತೊಮ್ಮೆ ಉಲಿಯಿತು. ನಾನು ಅನ್ನುವುದಕ್ಕೆ ಯತ್ನಿಸಿದರು. ಧ್ವನಿ ಹೊರಗೆ ಬರಲು ನಿರಾಕರಿಸಿದಂತಿತ್ತು. ಆ ಸ್ವರದಲ್ಲಿರುವ ಆಪ್ತತೆ, ಮಾಧುರ್ಯ ಮತ್ತು ಅದು ಸೃಷ್ಟಿಸಿರುವ ಅಪೂರ್ವ ಜಗತ್ತು ತಮ್ಮ ಒಂದು ಮಾತಿನಿಂದ ಕರಗಿಹೋಗುತ್ತದೆ ಅನ್ನುವ ಆತಂಕದಲ್ಲಿ ಶಿವಲಿಂಗಯ್ಯ ಸುಮ್ಮನೆ ಉಳಿದುಬಿಟ್ಟರು. ಆಕೆ ಮತ್ತೆ ಮಾತಾಡಿದಳು. ಹಲೋ… ಮಾತಾಡಿ ಪ್ಲೀಸ್.. ಕೇಳಿಸ್ತಾ ಇದೆಯಾ. ಯಾರು ಬೇಕಾಗಿತ್ತು ನಿಮಗೆ.. ಎಲ್ಲಿಂದ ಮಾತಾಡ್ತಿದ್ದೀರಿ.. ಹಲೋ… ಹಲೋ..” ಹಲೋ ಅನ್ನುವ ದನಿ ಅವರ ಚಿತ್ತಪ್ರಥ್ವಿಯಲ್ಲಿ ಅನುರಣಿಸುತ್ತಾ ಸಾಗಿತು. ಆ ದನಿಯೆಂಬ ಮಾಯಾಜಿಂಕೆಯ ಹಿಂದೆ ಮನಸ್ಸು ವೈದೇಹಿಯಾಯಿತು. ಹಲೋ.. ಮಾತಾಡಿ… ಹಲೋ.. ಕೇಳಿಸ್ತಿಲ್ಲ.. ನಾನೇ ಮಾಡ್ತೀನಿ ಇರಿ… ಎಂದು ಮತ್ತೊಮ್ಮೆ ಕೊಂಚ ಎತ್ತರದ ದನಿಯಲ್ಲಿ ಮಾತಾಡಿ, ಆಮೇಲೆ ಫೋನ್ ಕಟ್ ಮಾಡಿದ್ದೂ ಶಿವಲಿಂಗಯ್ಯನವರಿಗೆ ಗೊತ್ತಾಗಲೇ ಇಲ್ಲ. ಅವರು ರಿಸೀವರ್ ಹಿಡಿದುಕೊಂಡು ಹಾಗೇ ಕೂತಿದ್ದರು. ಸ್ವಲ್ಪ ಹೊತ್ತಿನ ನಂತರ ಅವರ ಕಿವಿಗೆ ಕೇಳಿಸುತ್ತಿದ್ದದ್ದು ಡಿಸ್‌ಕನೆಕ್ಟ್ ಆದ ಫೋನ್ ಲೈನಿನ ಗುಯ್‌ಗುಡುವ ಸದ್ದು. ಶಿವಲಿಂಗಯ್ಯ ಹಾಗೇ ಕೂತುಬಿಟ್ಟರು. ಹಲೋ.. ಎಂಬ ಸುಸ್ವರದ ಅಲೆ ಅವರ ಮನಸ್ಸಿನೊಳಗೆ ಉಯ್ಯಾಲೆ ಆಡುತ್ತಿತ್ತು. ಮತ್ತೆ ಅವಳಿಗೆ ಫೋನ್ ಮಾಡೋಣ ಅಂದುಕೊಂಡರು. ಆದರೆ ತಾನು ಡಯಲ್ ಮಾಡಿದ ಆ ರಾಂಗ್ ನಂಬರ್ ಯಾವುದು ಅನ್ನುವುದು ಅವರಿಗೆ ನೆನಪಾಗಲೇ ಇಲ್ಲ. ಆವತ್ತಿನಿಂದ ಶಿವಲಿಂಗಯ್ಯ ತಾನಾಗಿ ಉಳಿಯಲಿಲ್ಲ. ಅವರನ್ನು ಆ ದನಿ ಹಗಲೂ ಇರುಳೂ ಕಾಡಿತು. ಯಾವ ದಿವ್ಯ ವೀಣೆಯಿದು.. ಯಾರೀ ಸುರವೈಣಿಕ ಎಂದು ಬೆಳಗ್ಗೆ ರೇಡಿಯೋ ಉಲಿಯುತ್ತಿದ್ದರೆ ಅವರ ಮನಸ್ಸು ಆ ಸ್ವರದತ್ತ ಹಾಯುತ್ತಿತ್ತು. ಎಲ್ಲಾದರೂ ಏನಾದರೂ ಸದ್ದಾದರೆ ಆ ದನಿ ಮರುಕಳಿಸುತ್ತಿತ್ತು. ಈ ಜನ್ಮವನ್ನು ಸಾರ್ಥಕಗೊಳಿಸುವುದಕ್ಕೆ ಬಂದ ಅಮರನಾದ ಅದು ಅನ್ನುವುದು ಅವರಿಗೆ ಕ್ರಮೇಣ ಖಾತ್ರಿಯಾಗತೊಡಗಿತು. ಆಗಷ್ಟೇ ಡಿಸೆಂಬರ್ ಕಾಲಿಡುತ್ತಿತ್ತು. ಶಿವಲಿಂಗಯ್ಯನನ್ನೂ ಮಂಜು ಮುಸುಕಿದ ಮುಂಜಾನೆ, ಇಬ್ಬನಿ ಹನಿಸುವ ಸಂಜೆ, ಚಂದಿರನೂ ಮಂಕಾಗಿ ಉರಿಯುವ ಬೆಳದಿಂಗಳ ರಾತ್ರಿ ಬಿಡಲಿಲ್ಲ. ಫೋನ್ ಮುಂದೆ ಕೂತು, ಊಟಕ್ಕೆ ಕುಳಿತಾಗ, ಸ್ನಾನ ಮಾಡುವ ಹೊತ್ತಿಗೆ, ದೇವರ ಮುಂದೆ ಪೂಜೆಗೆ ಕೂತಾಗ ಶಿವಲಿಂಗಯ್ಯ ಒಂದೇ ಒಂದು ಸಾರಿ ಫೋನ್ ಮಾಡು ಅಂತ ತಮ್ಮೊಳಗೇ ಕೇಳಿಕೊಂಡರು. ಮತ್ತೆ ಕುಳಿತು ಲೆಕ್ಕ ಹಾಕಿದರು. ನಾನು ಫೋನ್ ಮಾಡ್ತೀನಿ ಅಂತ ಹೇಳಿದಳಲ್ಲ. ಹಾಗಿದ್ದರೆ ಯಾಕೆ ಮಾಡಲಿಲ್ಲ. ತನ್ನ ನಂಬರು ಅವಳ ಮೊಬೈಲಿನಲ್ಲಿ ದಾಖಲಾಗಿರಲೇಬೇಕು. ಹಾಗಿದ್ದರೆ ಇಂದಲ್ಲ ನಾಳೆ ಫೋನ್ ಮಾಡೇ ಮಾಡುತ್ತಾಳೆ. ಮಾಡೇ ಮಾಡುತ್ತಾಳೆ. ಫೋನಿನ ಮುಂದೆ ಕುಳಿತು, ಅದು ರಿಂಗಾದಾಗೆಲ್ಲ ಉಲ್ಲಸಿತರಾಗುತ್ತಾ, ರಿಸೀವರ್ ಎತ್ತಿದಾಗೆಲ್ಲ ಅದೇ ಹಳೆಯ ದನಿಗಳು ಮುರುಕು ಮುರುಕಾಗಿ ಬಂದು ಕಿವಿಗೆ ಅಪ್ಪಳಿಸಿದಾಗ ಬೇಸರ ಪಡುತ್ತಾ ಶಿವಲಿಂಗಯ್ಯನ ದಿನಗಳು ಉರುಳಿದವು. ಮುಸ್ಸಂಜೆ ಫೋನ್ ರಿಂಗಣಿಸಿದರೆ ಅವಳದೇ ಇರಬೇಕು ಅನ್ನುವ ಊಹೆ. ಒಂದು ದಿನ ಅವರ ಗಿರಿಜೆ ಮುಸ್ಸಂಜೆಯ ಕರೆಯೊಂದಕ್ಕೆ ಉತ್ತರಿಸಿದ್ದು ಆಗಷ್ಟೇ ಮನೆಗೆ ಬರುತ್ತಿದ್ದ ಅವರಿಗೆ ಕೇಳಿಸಿತ್ತು. ಆಕೆ ಅಯ್ಯ… ರಾಂಗ್ ನಂಬರ್.. ಇಡಮ್ಮಾ ಫೋನು… ನೋಡ್ಕೊಂಡು ಮಾಡೋಕ್ಕಾಗಲ್ವಾ” ಅಂತ ರೇಗುವುದಷ್ಟೇ ಕೇಳಿಸಿತು. ಶಿವಲಿಂಗಯ್ಯ ಸಿಟ್ಟಲ್ಲಿ ಬಂದು ಫೋನ್ ಎತ್ತಿಕೊಳ್ಳುವ ಹೊತ್ತಿಗೆ ಫೋನ್ ಕಟ್ಟಾಗಿತ್ತು. ಆವತ್ತು ಗಿರಿಜೆ ಹೊಡೆಸಿಕೊಳ್ಳಲಿಲ್ಲ ಅಷ್ಚೇ. ಯಾರದು, ದನಿ ಹೇಗಿತ್ತು.. ಏನಂದಳು ಅಂತ ಮತ್ತೆ ಮತ್ತೆ ಕೇಳಿದರು. ಗಿರಿಜೆ ಯಾವಳೋ ಹಾಳು ಮುಂಡೇ, ಅದ್ಯಾಕೆ ಹಾಗಾಡ್ತೀರಿ ಅಂತ ತನ್ನ ತವರಿಗೆ ಭಾಷೆಗೆ ಮರಳುವ ತನಕ ಅವಳನ್ನು ಕಾಡಿದರು. ದಿನ ಉರುಳಿದ ಹಾಗೇ ಆ ದನಿ ಅವರೊಳಗೆ ಹರಳುಗಟ್ಟುತ್ತಾ ಹೋಯಿತು. ಮತ್ತೊಂದು ಮುಸ್ಸಂಜೆ ಆ ದನಿ ಯಾವುದು ಅನ್ನುವುದನ್ನು ಪತ್ತೆ ಮಾಡಲೇಬೇಕು ಅಂದುಕೊಂಡು ಶಿವಲಿಂಗಯ್ಯ ನಿರ್ಧಾರ ಮಾಡಿಬಿಟ್ಟರು. ಮೊದಲ ದಿನ ಫೋನ್ ಮಾಡಿದ ಭಂಗಿಯನ್ನೇ ಕೂತು, ತಮ್ಮನ ನಂಬರ್ ಹುಡುಕಿ ರಿಸೀವರ್ ಎತ್ತಿಕೊಂಡು ತಮ್ಮನ ನಂಬರ್ ಡಯವ್ ಮಾಡಿದರು, ತಮ್ಮನೇ ಫೋನೆತಿತ್ತಿಕೊಂಡು ಏನಣ್ಣಾ, ಚೆನ್ನಾಗಿದ್ದೀಯ” ಅಂತ. ಹೂಂ ಅನ್ನದೇ ಉಹೂಂ ಅನ್ನದೇ ಫೋನಿಟ್ಟರು. ಅಂದರೆ ತಾನು ಯಾವುದೋ ಒಂದು ನಂಬರ್ ಬೇರೆ ಒತ್ತಿದ್ದೇನೆ. ಆಗ ಅದು ದೇವಕನ್ನಿಕೆಗೆ ಹೋಗಿದೆ. ಯಾವ ನಂಬರ್ ಬೇರೆ ಒತ್ತಿರಬಹುದು. ಹತ್ತಂಕಿಯ ನಂಬರ್ ಮುಂದಿಟ್ಟುಕೊಂಡು ಶಿವಲಿಂಗಯ್ಯ ಅದರ ವಿವಿಧ ಸಂಭವನೀಯತೆಯನ್ನು ಲೆಕ್ಕ ಹಾಕಿದರು. ೯೪೮೦೪೪೯೪೪೭ ನಂಬರಲ್ಲಿ ತಪ್ಪಾದರೆ ಏನಾಗಿರಬಹುದು. ಮೊದಲ ಮೂರಂಕಿ ತಪ್ಪಾಗಿರಲಿಕ್ಕಿಲ್ಲ. ಆಮೇಲಿನ ಸಂಖ್ಯೆ ತಪ್ಪಾಗಿರಬಹುದೇ. ಇದರಿಂದ ಎಷ್ಟು ನಂಬರ್ ಹುಟ್ಟುವುದಕ್ಕೆ ಸಾಧ್ಯ. ಶಿವಲಿಂಗಯ್ಯ ಬರೆಯುತ್ತಾ ಹೋದರು: ೯೪೮೦೧೪೯೪೪೭, ೯೪೮೦೨೪೯೪೪೭, ೯೪೮೦೩೪೯೪೪೭, ೯೪೮೦೫೪೯೪೪೭… ಹೀಗೆ ಬರೆಯುತ್ತಾ ಬರೆಯುತ್ತಾ ಅವರ ಮುಂದೆ ಐನೂರೆಪ್ಪತ್ತಕ್ಕೂ ಹೆಚ್ಚು ಫೋನ್ ನಂಬರ್‌ಗಳಿರುವ ಪಟ್ಟಿ ಸಿದ್ದವಾಯ್ತು. ಆವತ್ತಿನಿಂದ ಅವರದು ಅದೇ ಕೆಲಸ ಆಯ್ತು. ಬೆಳಗಾಗೆದ್ದು ಆ ಟೆಲಿಫೋನ್ ಪಟ್ಟಿಯನ್ನೆತ್ತಿಕೊಂಡು ಒಂದೊಂದೇ ನಂಬರ್ ಡಯಲ್ ಮಾಡುವುದು. ಆ ಹಳೇ ಫೋನಿನಲ್ಲಿ ನಂಬರ್ ಡಯಲ್ ಮಾಡುತ್ತಾ, ಅದು ಟರ್ರ.. ಟ್‌ಟ್‌ರ್ರಾ… ಟರ್ರ್.. ಟರ್ರ್‌ರ್ರ್… ಎಂದು ಸದ್ದು ಮಾಡುತ್ತಾ, ಮರು ಕ್ಷಣವೇ ಗೊಗ್ಗರು ದನಿಯೊಂದು ಹಲೋ ಅನ್ನುತ್ತಿದ್ದಂತೆ ಫೋನ್ ಕಟ್ ಮಾಡುತ್ತಾ, ಹಲೋ, ಪೊಲೀಸ್ ಸ್ಚೇಷನ್, ಹಲೋ ಕಟ್ಟಿಗೆ ಡಿಪೋ, ಹಲೋ ಹಾಲಿನ ಡೈರಿ, ಯಾವ ನಂಬರ್ ಬೇಕ್ರೀ, ರಾಂಗ್ ನಂಬರ್, ಫೋನ್ ಮಾಡಿ ಮಾತಾಡೋದಕ್ಕೇನ್ರೀ ರೋಗ, ಈ ನಂಬರ್ ಅಸ್ತಿತ್ವದಲ್ಲಿ ಇಲ್ಲ, ನೀವು ಕರೆ ಮಾಡಿರುವ ಚಂದಾದಾದರು ವ್ಯಾಪ್ತಿ ಪ್ರದೇಶದ ಹೊರಗಿದ್ದಾರೆ, ಸದ್ಯಕ್ಕೆ ದೊರಕುತ್ತಿಲ್ಲ, ಸ್ವಿಚಾಫ್ ಮಾಡಿದ್ದಾರೆ, ದಯವಿಟ್ಟು ನೀವು ಡಯಲ್ ಮಾಡಿದ ನಂಬರ್ ಸರಿಯಿದೆಯೋ ಪರೀಕ್ಷಿಸಿ…. ಹೀಗೆ ಶಿವಲಿಂಗಯ್ಯನವರ ಹಗಲು ರಾತ್ರಿಗಳು ಸಾಗಿದವು. ಆ ತಿಂಗಳ ಬಿಲ್ಲು ಆರು ಸಾವಿರದ ಎಪ್ಪತ್ತೆಂಟು ಬಂತು. ಶಿವಲಿಂಗಯ್ಯ ಅಲ್ಲಾಡಲಿಲ್ಲ. ಆವತ್ತು ಗಿರಿಜೆ ಅವರನ್ನು ಹಿಡಕೊಂಡು ರೇಗಾಡಿ ಕೂಗಾಡಿದರು. ನಿಮಗೆ ಹುಚ್ಚು ಹಿಡಿದಿದೆ ಅಂದರು. ಒಂದು ದಿನ ಇದರಿಂದ ಬೇಸತ್ತು, ಶಿವಲಿಂಗಯ್ಯನವರಿಗೆ ಗೊತ್ತಾಗದ ಹಾಗೆ ಫೋನಿನ ವೈರು ಕತ್ತರಿಸಿಟ್ಟರು. ಆವತ್ತು ಫೋನ್ ಮೌನವಾಗಿತ್ತು. ಅದು ಮೌನವಾಗಿದ್ದದ್ದೂ ಅರಿವಿಗೆ ಬಾರದ ಹಾಗೆ ಶಿವಲಿಂಗಯ್ಯ ಫೋನ್ ಮಾಡುತ್ತಲೇ ಇದ್ದರು. ಇವರಿಗೇನಾಗಿದೆ ಅಂತ ಕೇಳಿಕೊಂಡು ಬರೋಣ ಅಂತ ಗಿರಿಜೆ ಸಂತೆಪೇಟೆಯಲ್ಲಿದ್ದ ತನ್ನ ಅಣ್ಣ ಮಹಾದೇವಯ್ಯನನ್ನು ಕೇಳೋಣ ಅಂತ ಅಲ್ಲಿಗೆ ಹೋಗಿ ಅಣ್ಣನ ಜೊತೆ ಮನೆಗೆ ಮರಳುವ ಹೊತ್ತಿಗೆ ರಿಸೀವರ್ ಕೆಳಗೆ ಬಿದ್ದಿತ್ತು. ಗಾಬರಿಯಲ್ಲಿ ಇಬ್ಬರೂ ಸೇರಿ ಶಿವಲಿಂಗಯ್ಯನವರನ್ನು ಹಾಸಿಗೆಯ ಮೇಲೆ ಮಲಗಿಸುವ ಹೊತ್ತಿಗೆ ಅವರ ಆತ್ಮವು ವ್ಯಾಪ್ತಿ ಪ್ರದೇಶದಲ್ಲಿ ಇರಲಿಲ್ಲ. ಅವನ ತಮ್ಮನಿಗಾದ್ರೂ ಫೋನ್ ಮಾಡಿ ಹೇಳೋಣ ಅಂದುಕೊಂಡು ಮಹಾದೇವಯ್ಯ, ಕೆಳಗೆ ಬಿದ್ದ ರಿಸೀವರ್ ಎತ್ತಿಕೊಂಡರು. ಫೋನ್ ಡೆಡ್ ಆಗಿದ್ಯಾ ಕೇಳಿದರು. ಇಲ್ಲಾ ಕನೆಕ್ಷನ್ ತೆಗೆದಿದ್ದೀನಿ ನೋಡಿ, ಅಲ್ಲಿ ಅಂತ ಗಿರಿಜೆ ತೋರಿಸಿದಳು. ಮಹಾದೇವಯ್ಯ ಫೋನಿನ ಆ ಹಳೇ ಕಾಲದ ಫೋನಿನ ಮುಕ್ಕಾಲು ಕೇಜಿ ಭಾರದ ರಿಸೀವರ್ ಎತ್ತಿಕೊಂಡರು. ಆಮೇಲೆ ಅದರ ಪಕ್ಕದಲ್ಲಿದ್ದ ಟೆಲಿಫೋನ್ ಡೈರಿ ಎತ್ತಿಕೊಂಡು ಐ ಜೆ ಕೆ ಎಲ್ ಎಮ್ ಎಂದು ಹುಡುಕಾಡಿ, ಮಹೇಶ ಅನ್ನುವ ಹೆಸರನ್ನು ಹುಡುಕಿ, ಅದರ ಪಕ್ಕದಲ್ಲಿ ಚಿತ್ತುಚಿತ್ತಾಗಿ ಬರೆದಿದ್ದ ಹತ್ತು ಅಂಕಿಗಳ ನಂಬರನ್ನು ಟರ್ರ.. ಟ್‌ಟ್‌ರ್ರಾ… ಟರ್ರ್.. ಟರ್ರ್‌ರ್ರ್… ಎಂದು ಹತ್ತು ಸಲ ತೋರು ಬೆರಳಿನಿಂದ ತಿರುಗಿಸುತ್ತಾ ಡಯಲ್ ಮಾಡಿದರು. ಅತ್ತಲಿಂದ ಫೋನು ರಿಂಗಾಗುವ ಸದ್ದು ಕೇಳಿ ಬರಲಿಲ್ಲ. ಅದರ ಬದಲಿಗೆ ಕೇಳಿಬಂದದ್ದು ಹಮೇ ತುಮ್‌ಸೇ ಪ್ಯಾರ್ ಕಿತ್‌ನಾ, ಯೇ ಹಮ್ ನಹೀ ಜಾನ್‌ತೇ.. ಮಗರ್ ಜೀ ನಹೀ ಸಕ್‌ತೇ.. ತುಮ್ಹಾರೇ ಬಿನಾ..
ಮಹಾದೇವಯ್ಯನಿಗೆ ಅರೆಕ್ಷಣ ಆಶ್ಚರ್ಯವಾಯಿತು. ತಾವು ಫೋನ್ ಮಾಡಿದ್ದು ಮೊಬೈಲಿಗೋ ಯಾವುದಾದರೂ ರೇಡಿಯೋ ಸ್ಟೇಷನ್ನಿಗೋ ಎಂಬ ಅನುಮಾನ ಬಂತು. ಫೋನ್ ಲೈನಿಗೆ ಯಾವುದಾದರೂ ರೇಡಿಯೋ ಸ್ಟೇಷನ್ನು ಸಿಕ್ಕಿಬಿಟ್ಟಿದೆಯೋ ಎಂದುಕೊಂಡು ಫೋನ್ ಕಟ್ ಮಾಡೋಣ ಅಂದುಕೊಳ್ಳುವಳ್ಳುವಷ್ಟರಲ್ಲಿ ಅವರ ಕಿವಿಗೆ ಹಲೋ ಅನ್ನುವ ಮಧುರವಾದ ದನಿಯೊಂದು ಕೇಳಿಸಿತು. ಅಂಥ ಸುಮಧುರ ಕಂಠವನ್ನು ಅವರು ಕೇಳಿಯೇ ಇರಲಿಲ್ಲ. ಅದು ಕಿವಿಗೆ ಬೀಳುತ್ತಲೇ ಮಹಾದೇವಯ್ಯ ಒಂದು ಸಾರಿ ದಂಗಾಗಿಹೋದರು. ಆ ಹಾಡಿನ ಬೆನ್ನಿಗೇ ಎಂದೂ ಕೇಳಿರದ, ಎಲ್ಲಿಯೋ ಕೇಳಿದ್ದೇನೆ ಅನ್ನಿಸಿದ ಆ ಮಂಜುಳ ಧ್ವನಿ. ಆ ಧ್ವನಿ ಮತ್ತೊಮ್ಮೆ ಉಲಿಯಿತು. ನಾನು ಅನ್ನುವುದಕ್ಕೆ ಯತ್ನಿಸಿದರು. ಧ್ವನಿ ಹೊರಗೆ ಬರಲು ನಿರಾಕರಿಸಿದಂತಿತ್ತು. ಆ ಸ್ವರದಲ್ಲಿರುವ ಆಪ್ತತೆ, ಮಾಧುರ್ಯ ಮತ್ತು ಅದು ಸೃಷ್ಟಿಸಿರುವ ಅಪೂರ್ವ ಜಗತ್ತು ತಮ್ಮ ಒಂದು ಮಾತಿನಿಂದ ಕರಗಿಹೋಗುತ್ತದೆ ಅನ್ನುವ ಆತಂಕದಲ್ಲಿ ಮಹಾದೇವಯ್ಯ ಸುಮ್ಮನೆ ಉಳಿದುಬಿಟ್ಟರು. ಗಿರಿಜೆ ಮಲಗಿದ್ದ ಶಿವಲಿಂಗಯ್ಯನವರ ದೇಹದ ಮುಂದೆ ಅಸ್ತಿತ್ವದಲ್ಲಿಲ್ಲದ ನಂಬರಿನ ಹಾಗೆ ಕೂತೇ ಇದ್ದರು.